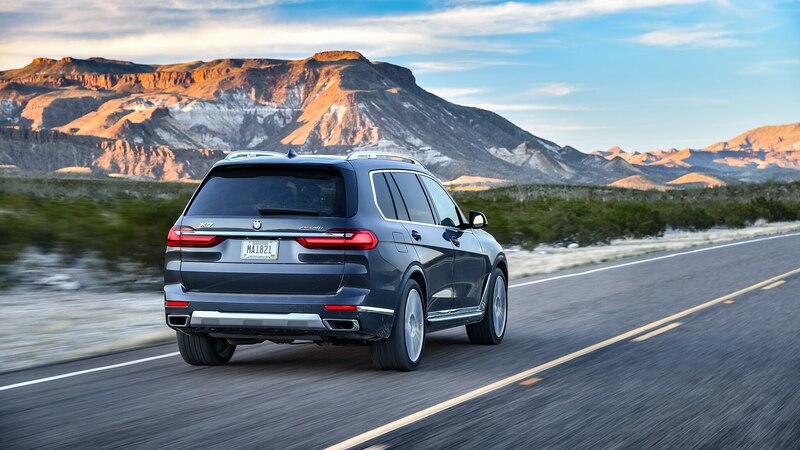 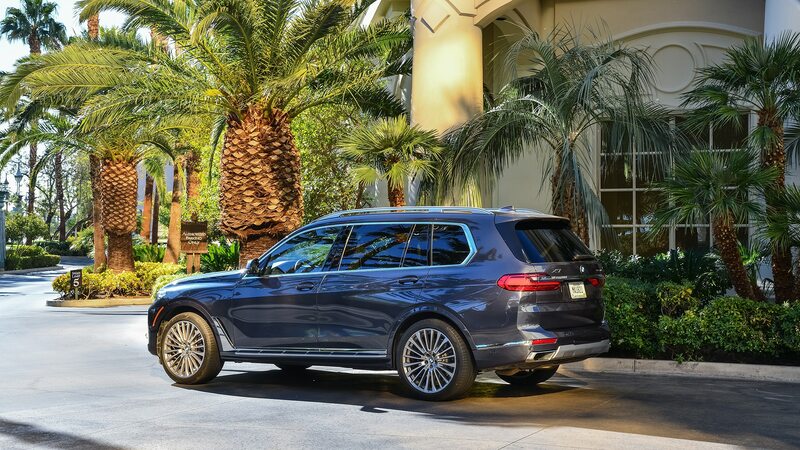 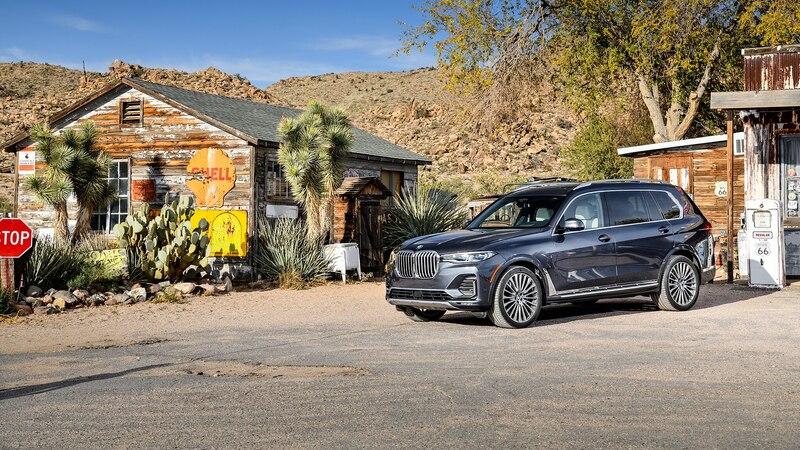 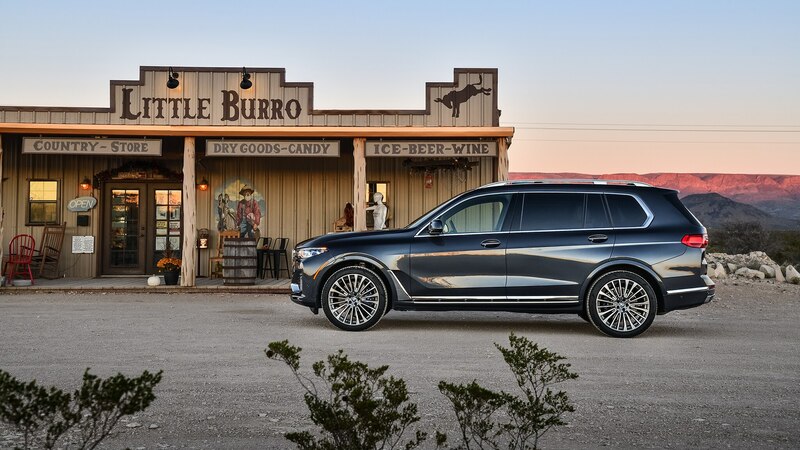 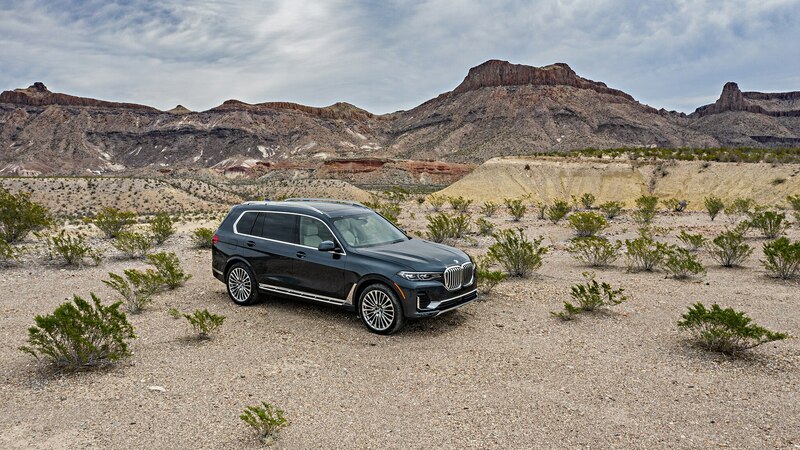 There may be no more appropriate place to road trip a new seven-seat SUV than the American Southwest, a region well-acquainted with high-occupancy haulers, from the jump-seat-equipped station wagons of the 1950s and ’60s to the suburban mall crawlers of today. 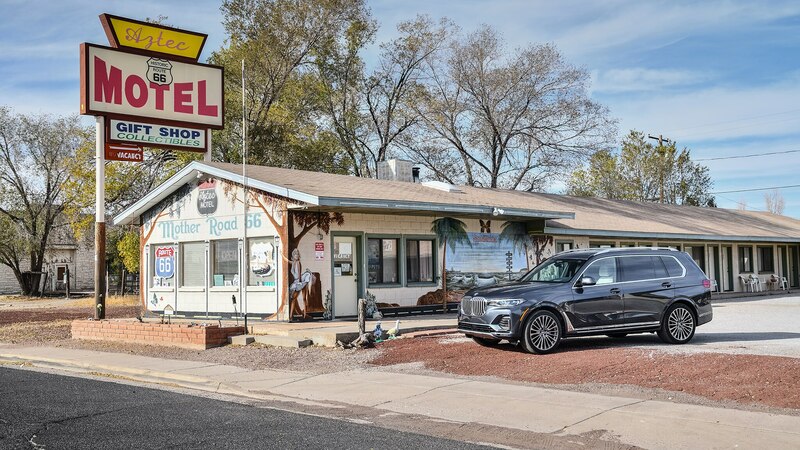 But where you once could count on seeing gas stations shaped like cowboy hats, quaint diners, and roadside stalls hawking all manner of tchotchkes, such a journey is now largely a highway slog from one place with a Target to another place with a Target, with long stretches of beautifully barren desert broken up only by quick layovers at the next truck stop/knife emporium/Starbucks. 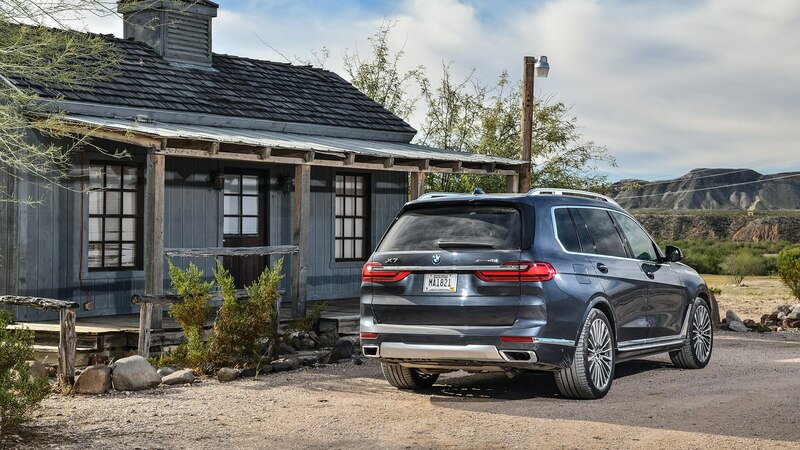 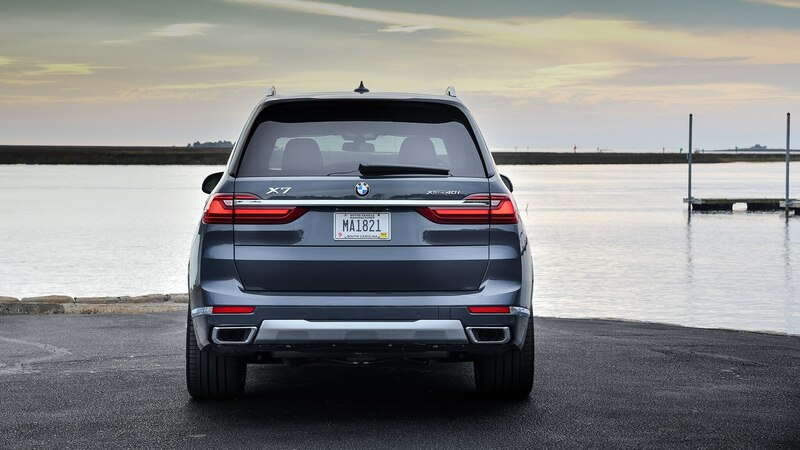 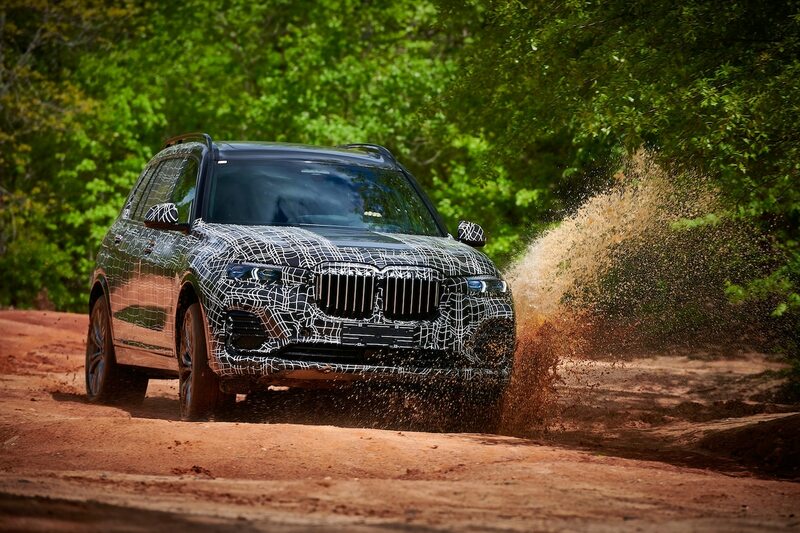 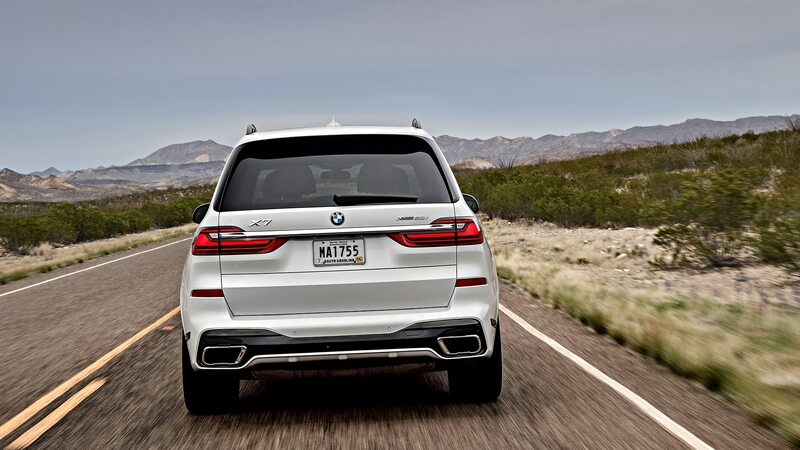 This was the environment in which we drove the all-new BMW X7. 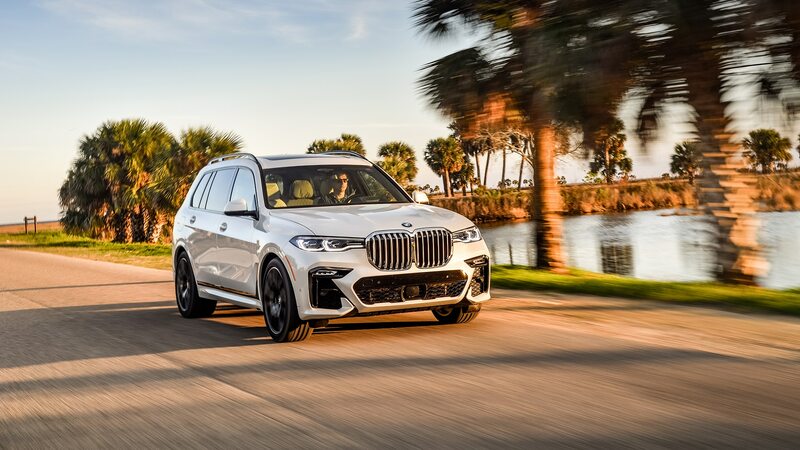 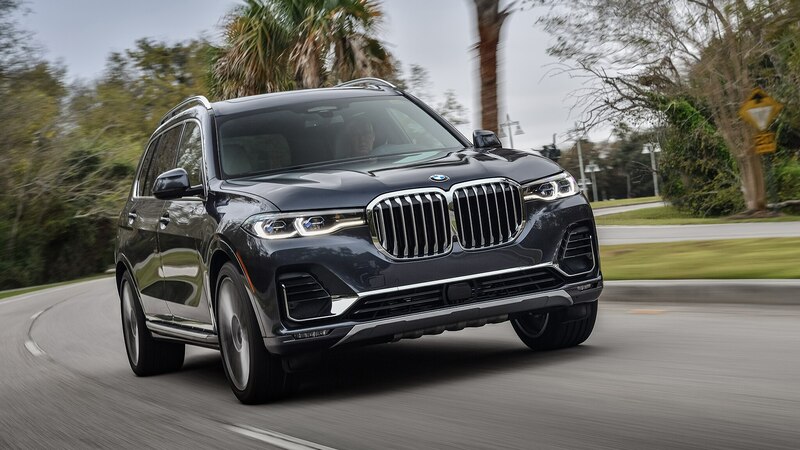 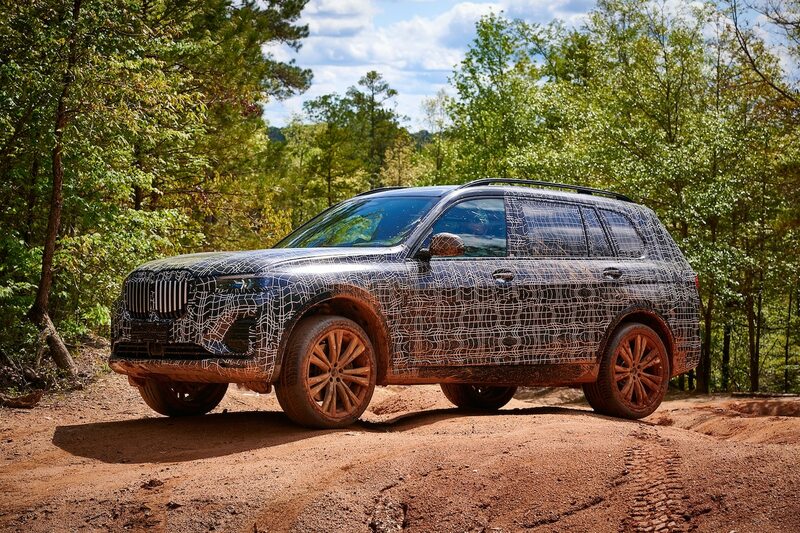 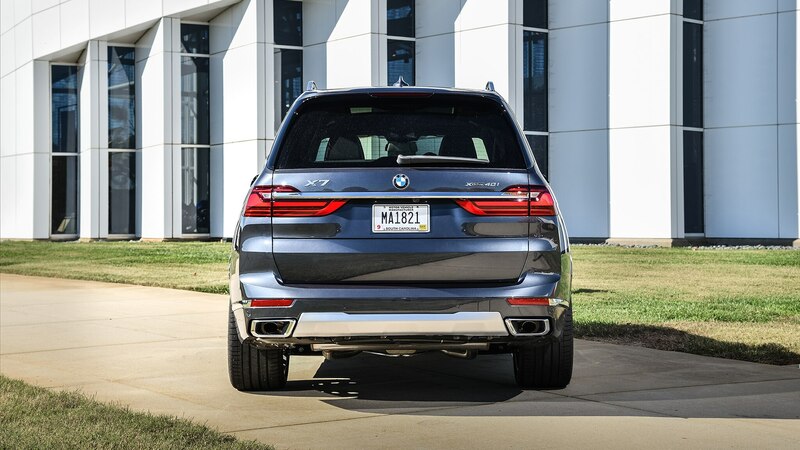 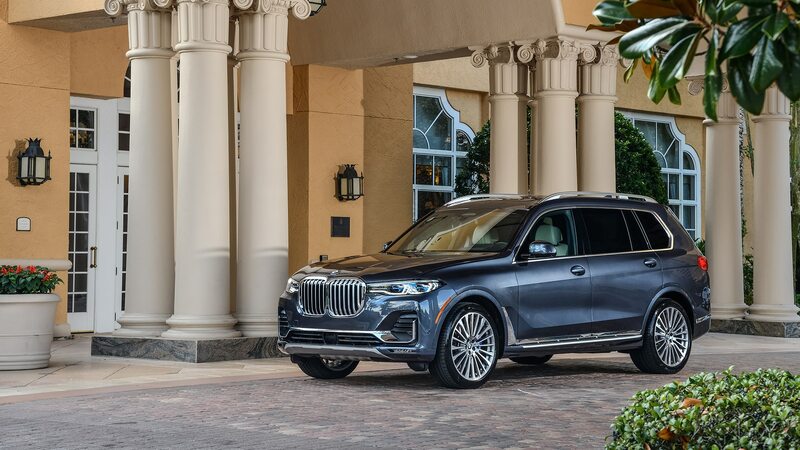 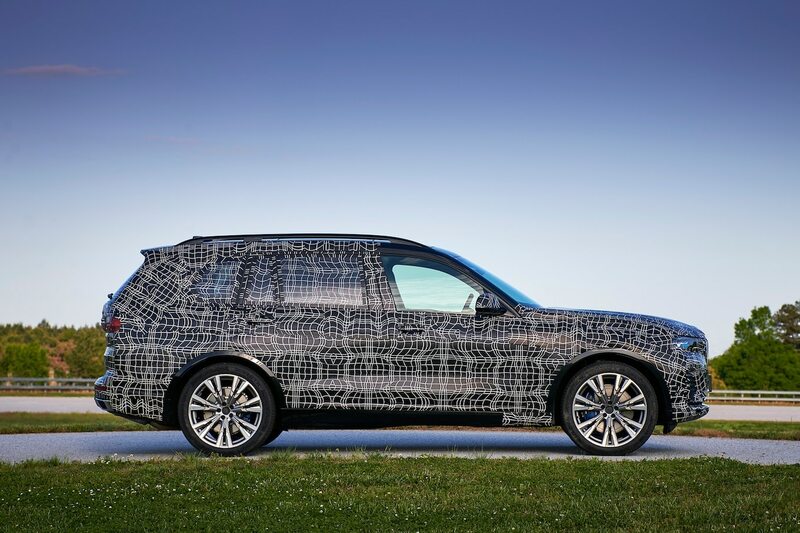 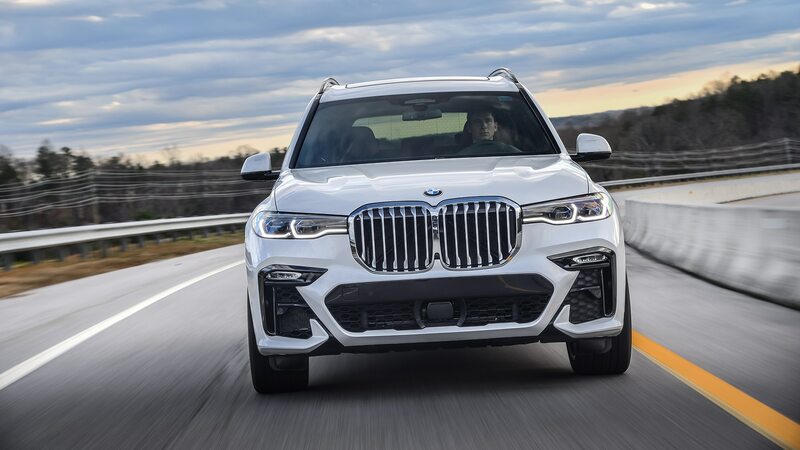 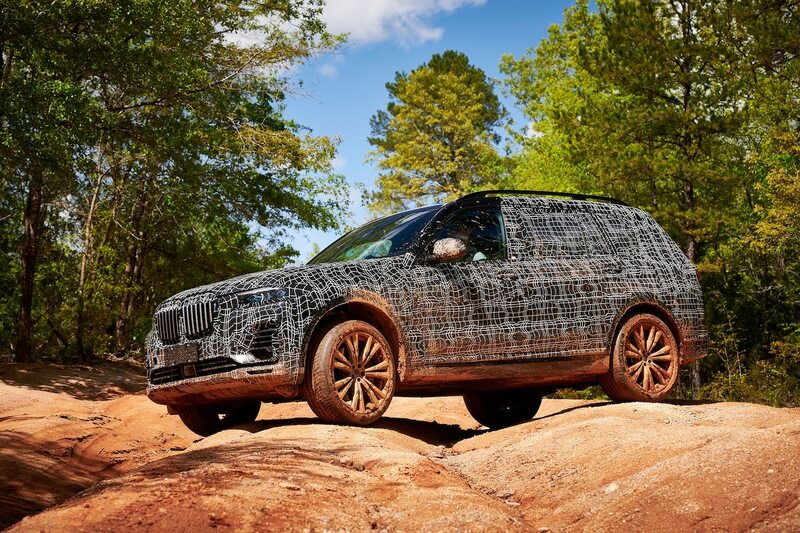 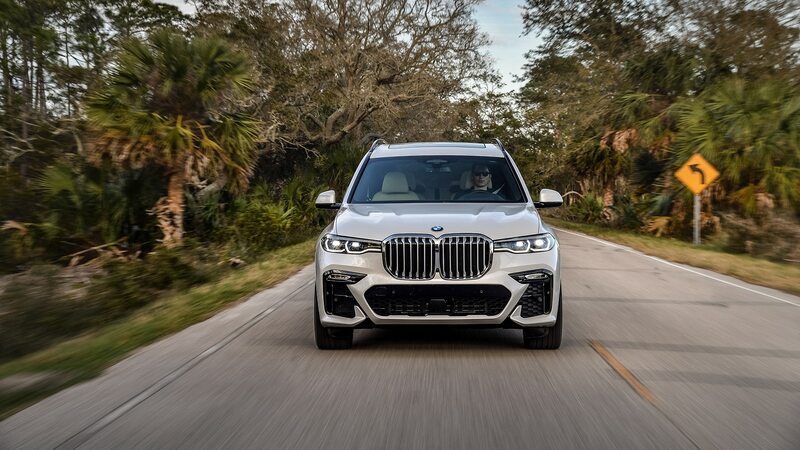 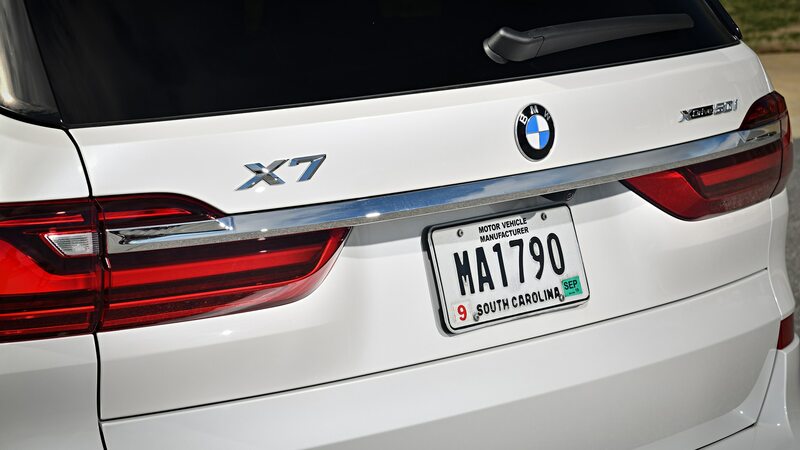 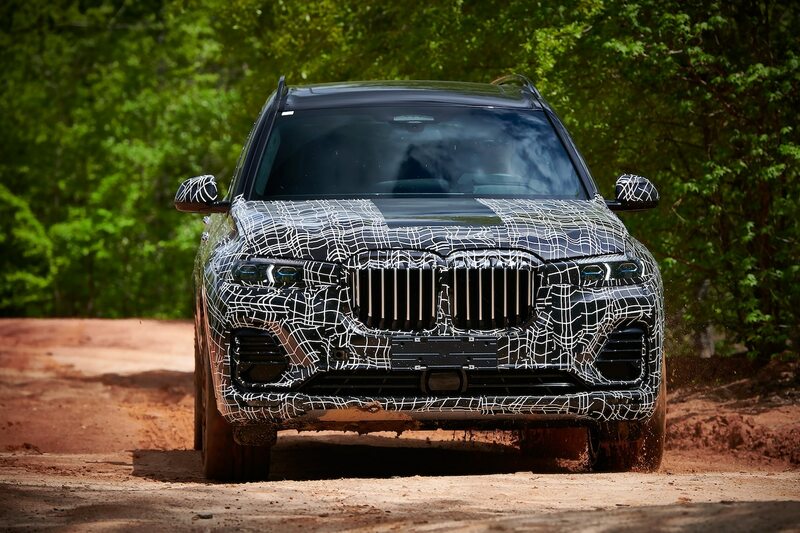 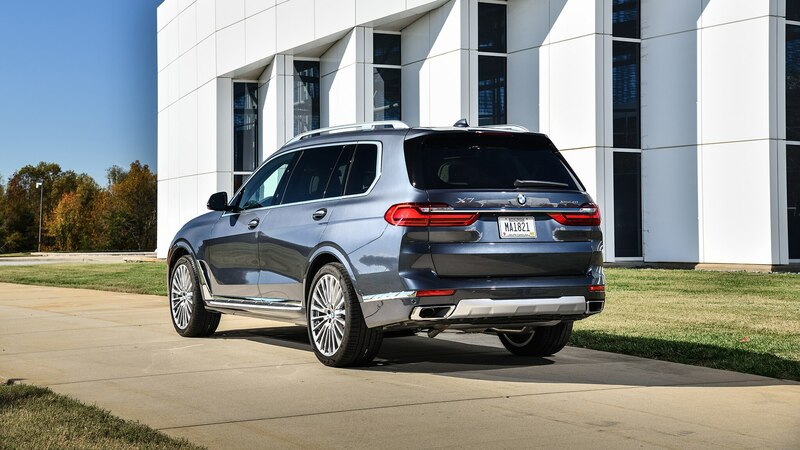 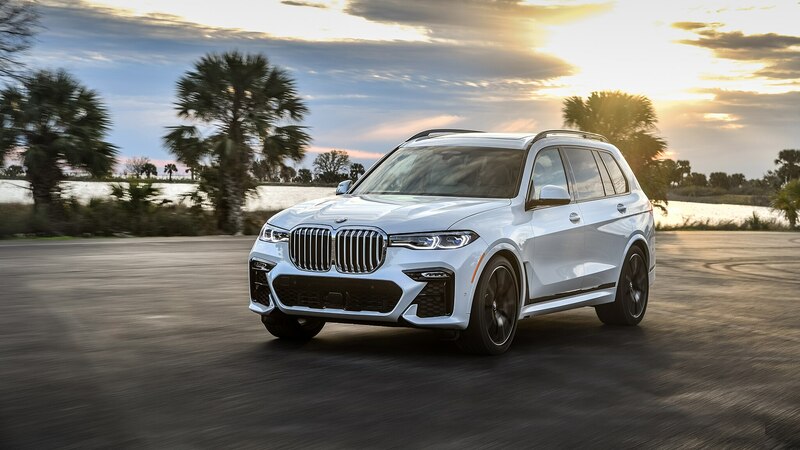 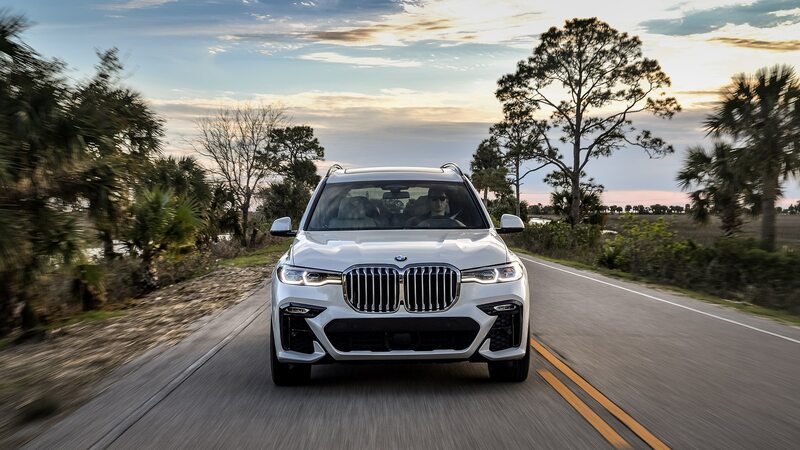 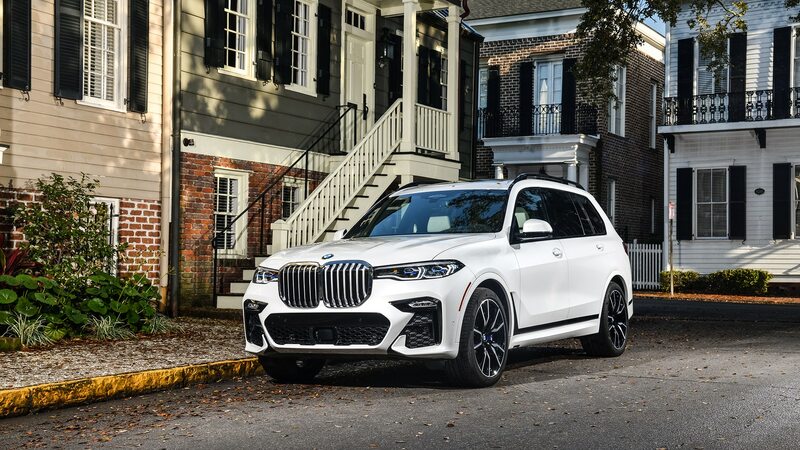 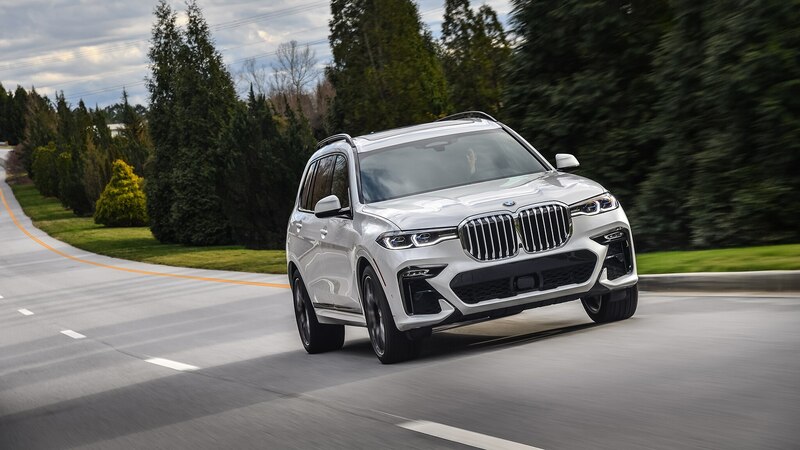 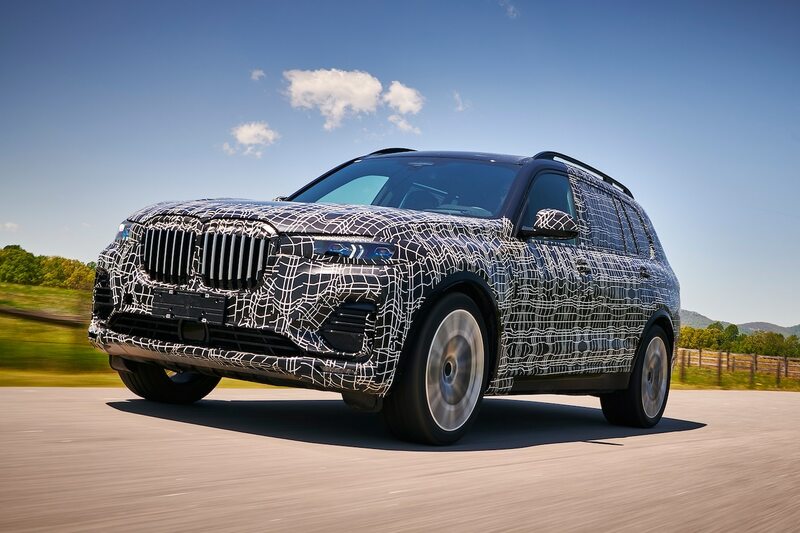 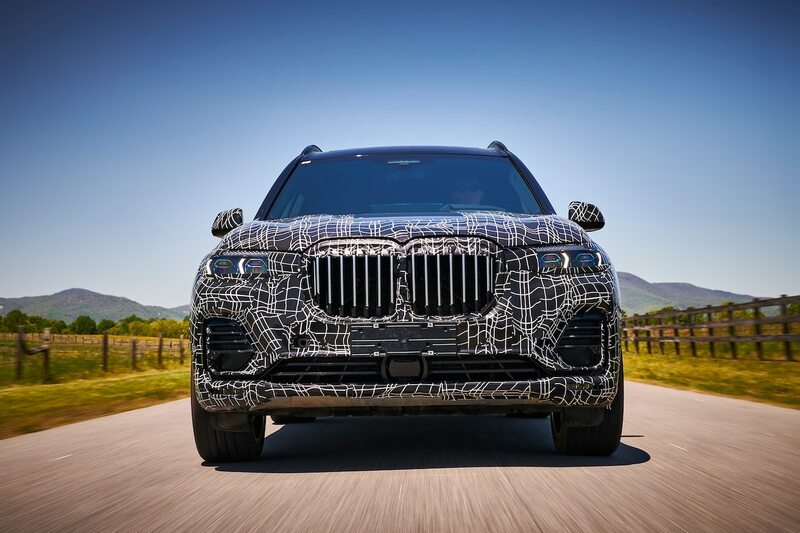 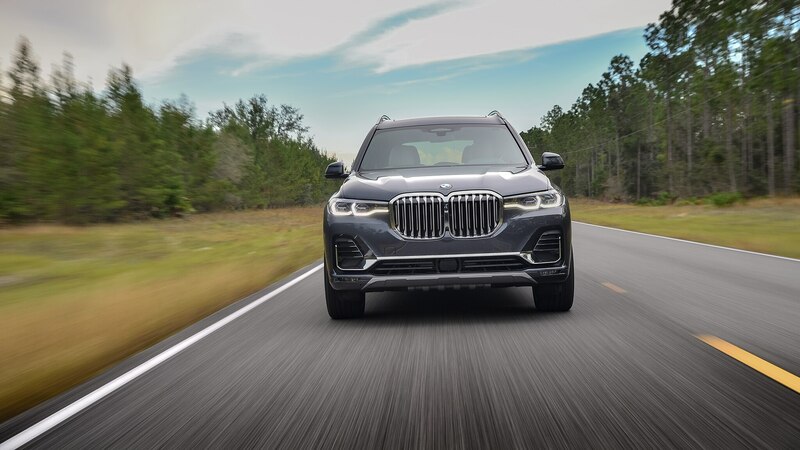 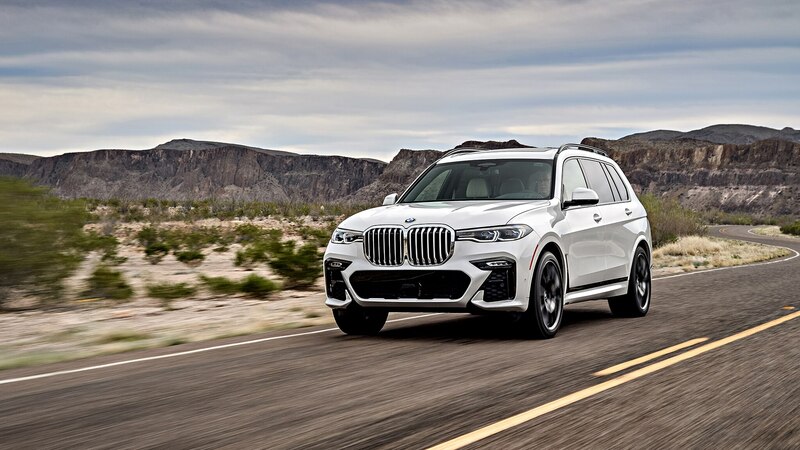 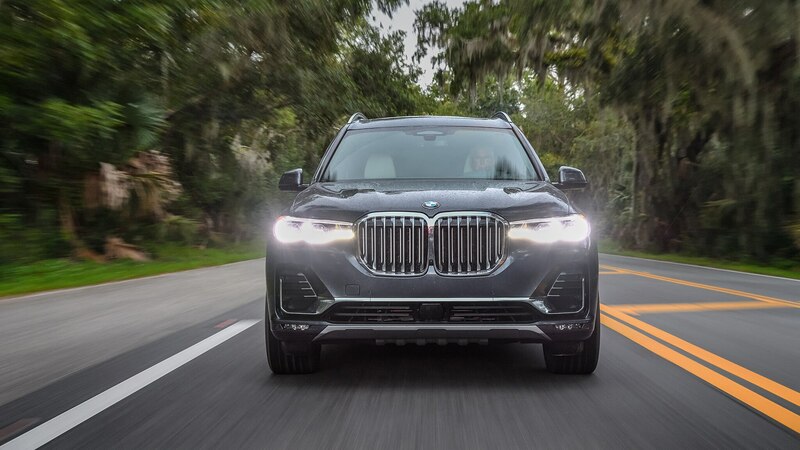 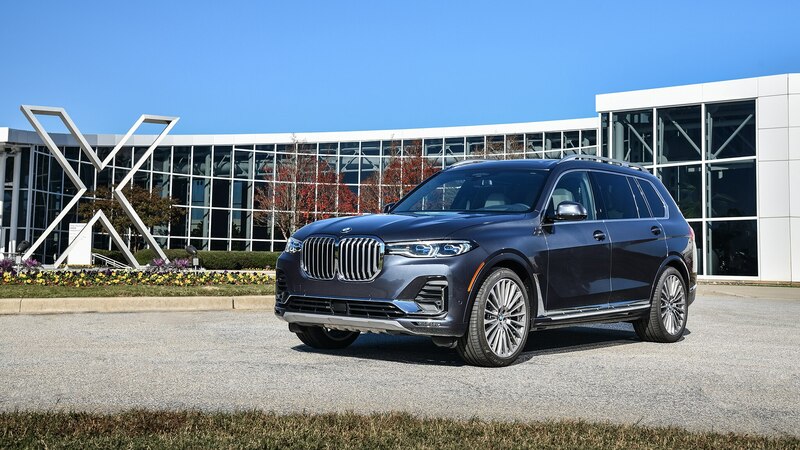 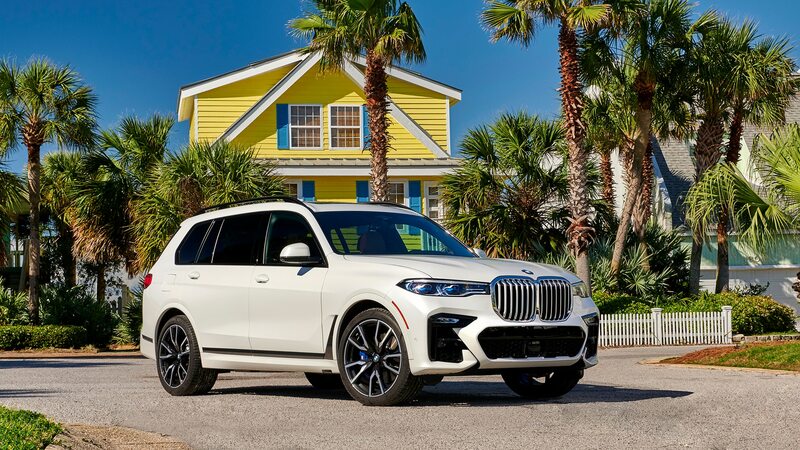 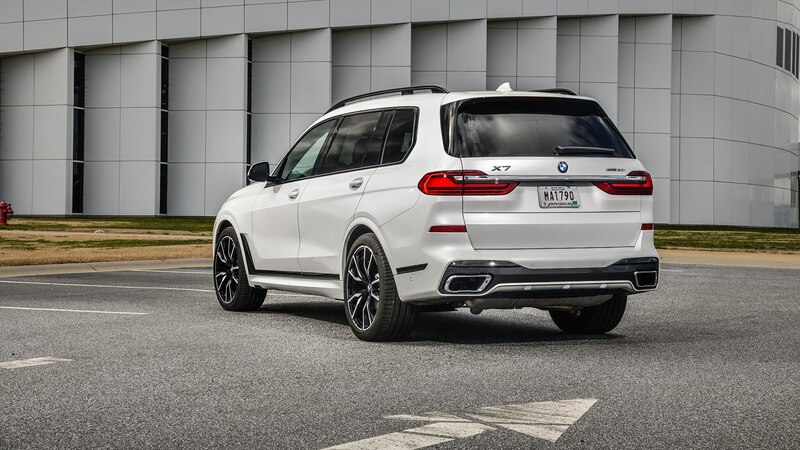 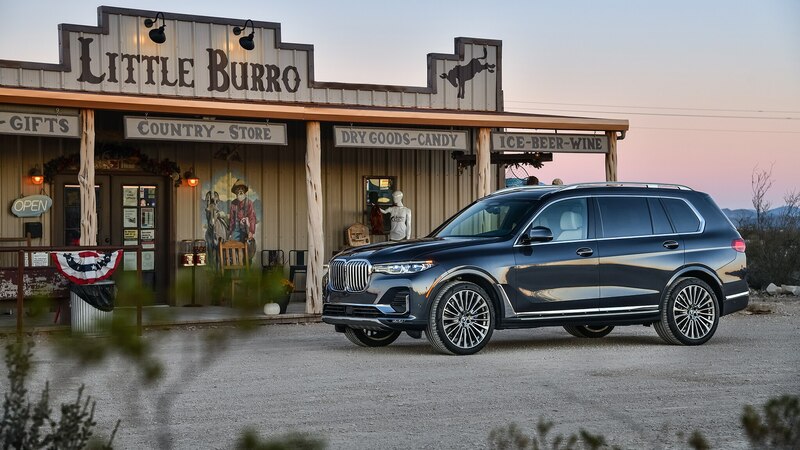 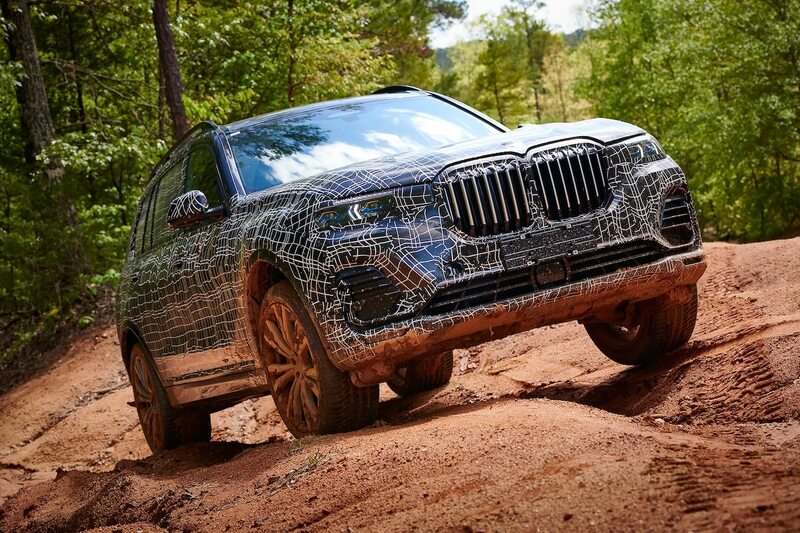 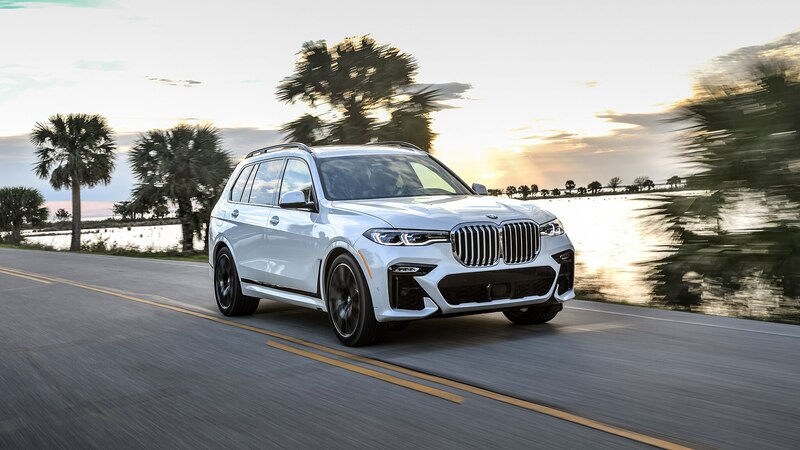 The South Carolina–built X7 is BMW’s first-ever huge-UV, and is an important addition to the company’s lineup in these utility-crazed times. 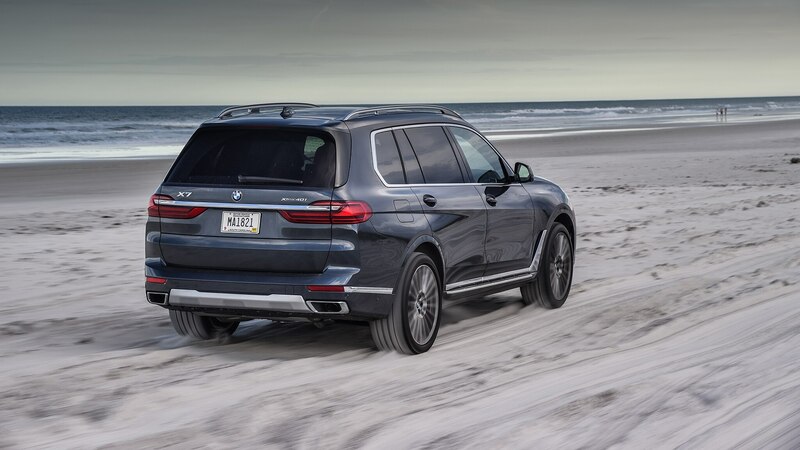 In the U.S., it offers two powertrains, standard all-wheel drive, and seating for up to seven. 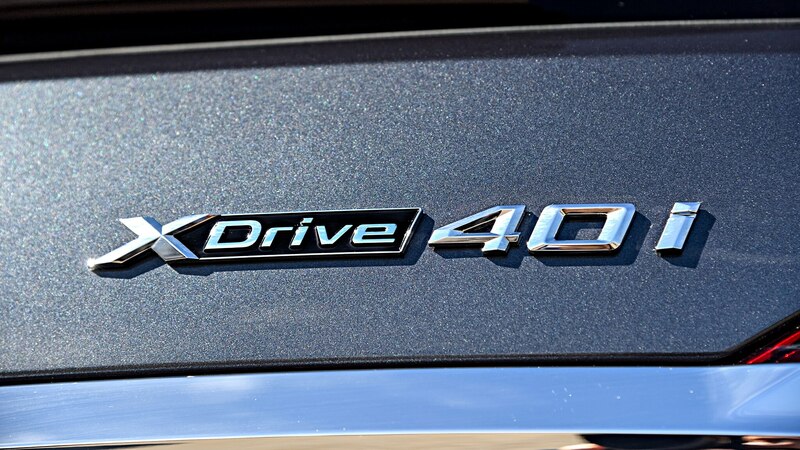 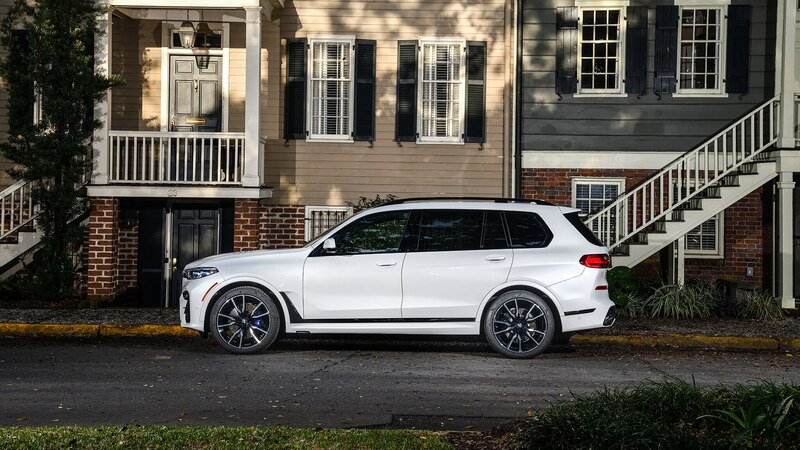 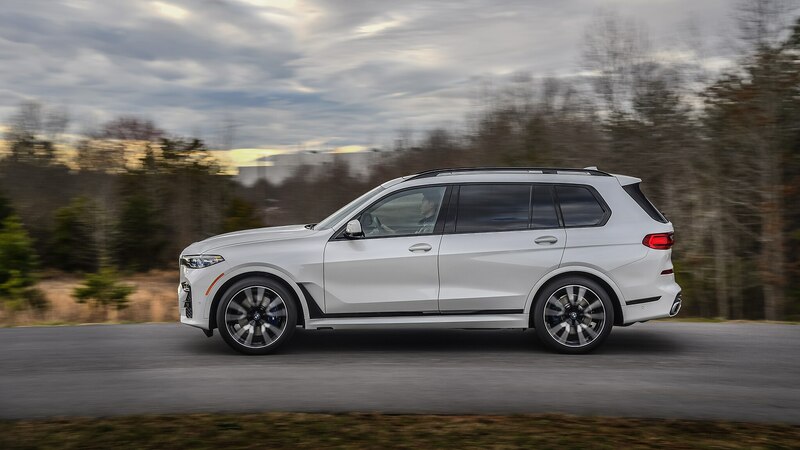 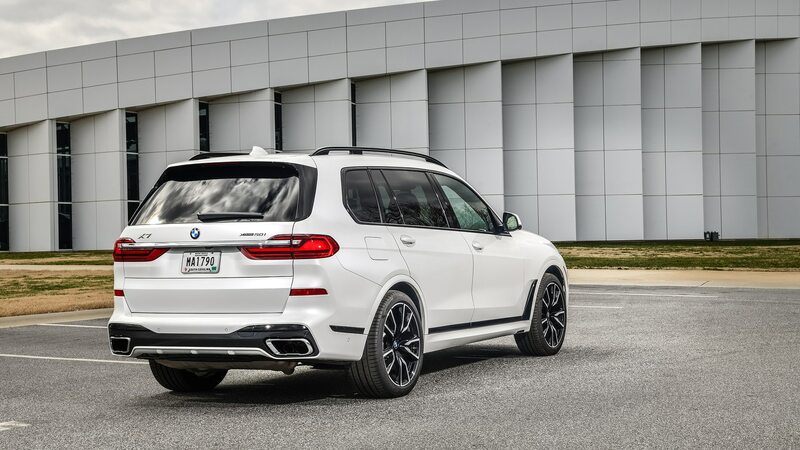 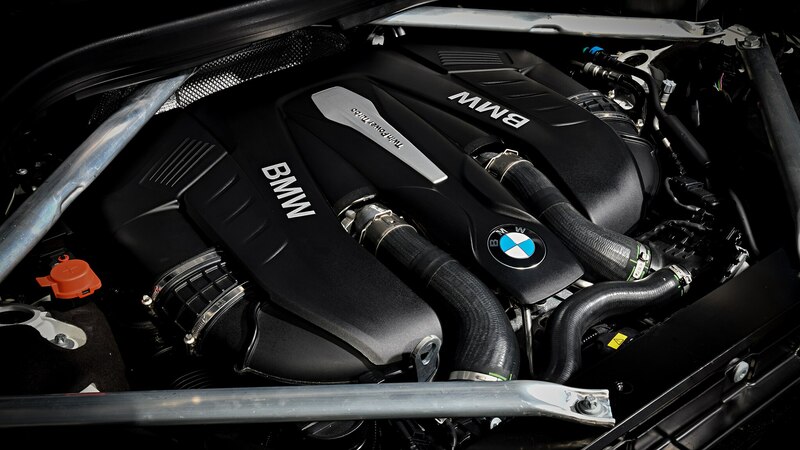 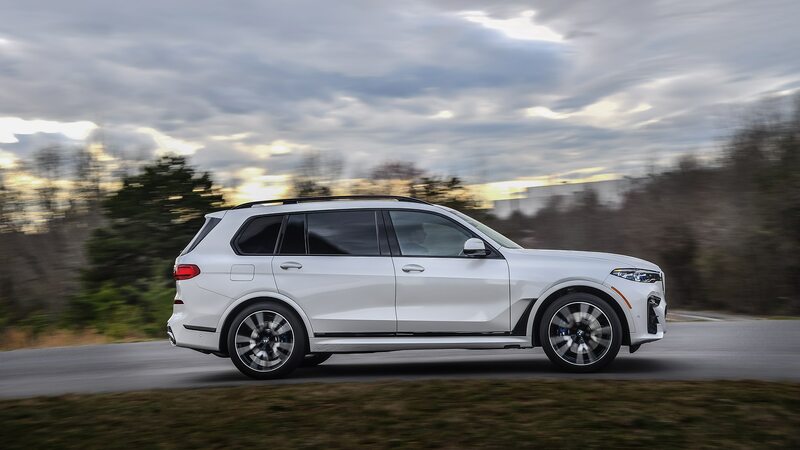 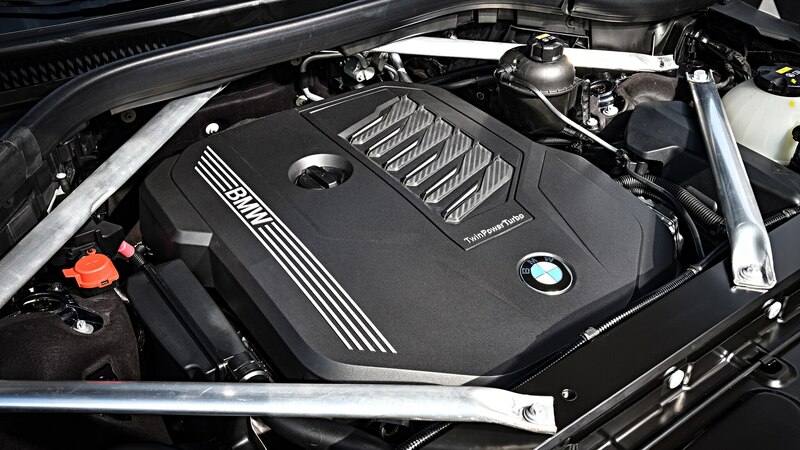 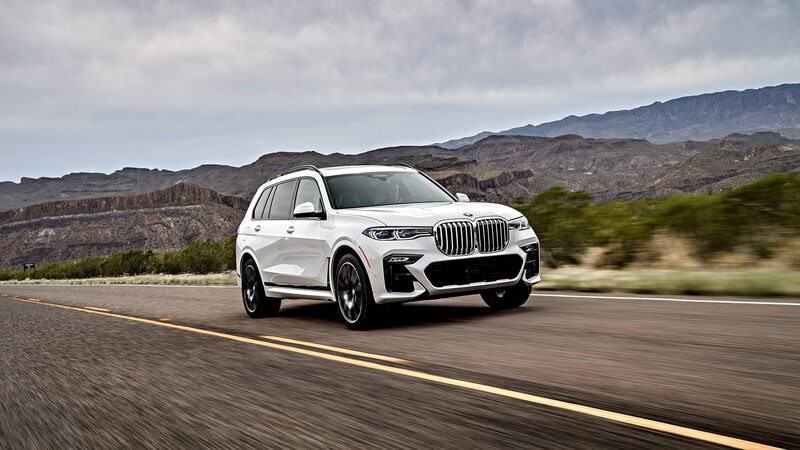 The engine choices are a turbocharged inline-six good for 335 horsepower and 330 lb-ft of torque in the xDrive40i or a twin-turbo V-8 that stumps up a meaty 456 horses and 479 lb-ft in the xDrive50i. 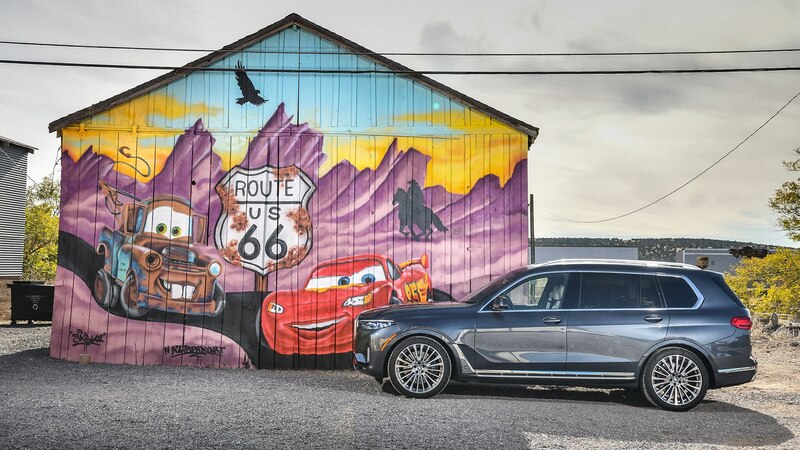 We drove both as part of a cross-country media drive that saw a train of X7s locomote from their birthplace in Spartanburg all the way to Los Angeles. 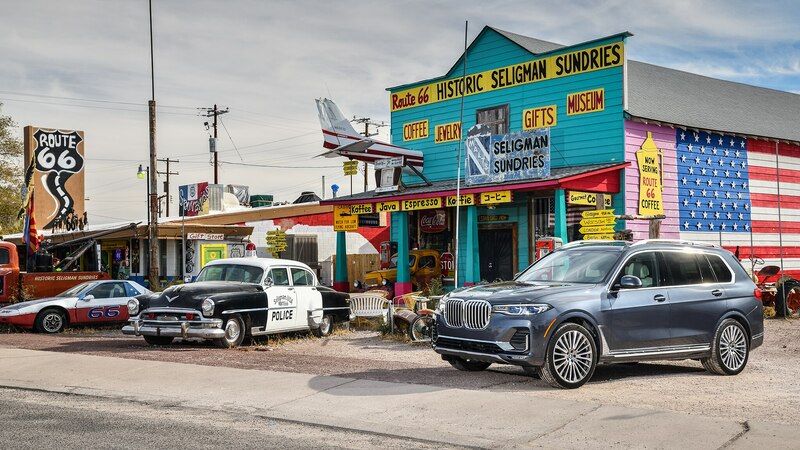 We dropped in for a daylong blast from El Paso to Phoenix. 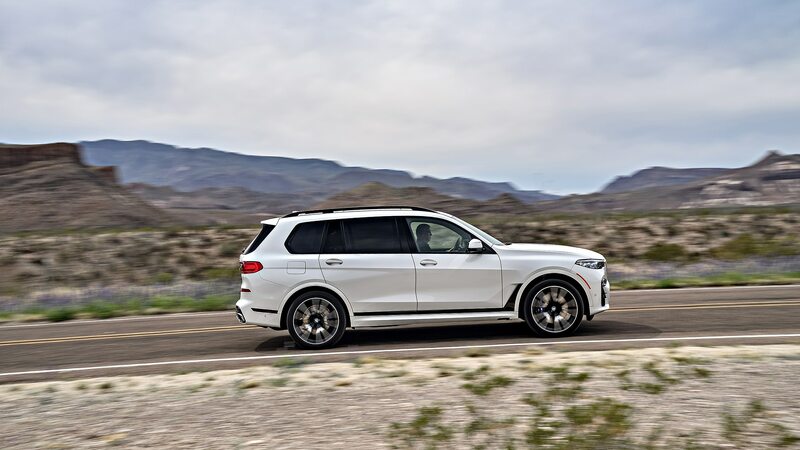 While our trip included time at moderate altitudes—3000 feet or so—both engines’ forced induction meant we hardly noticed, as neither lacked for breath. 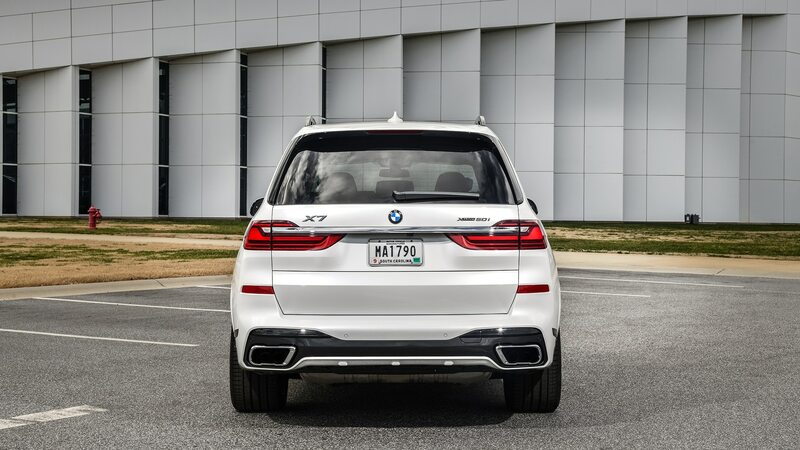 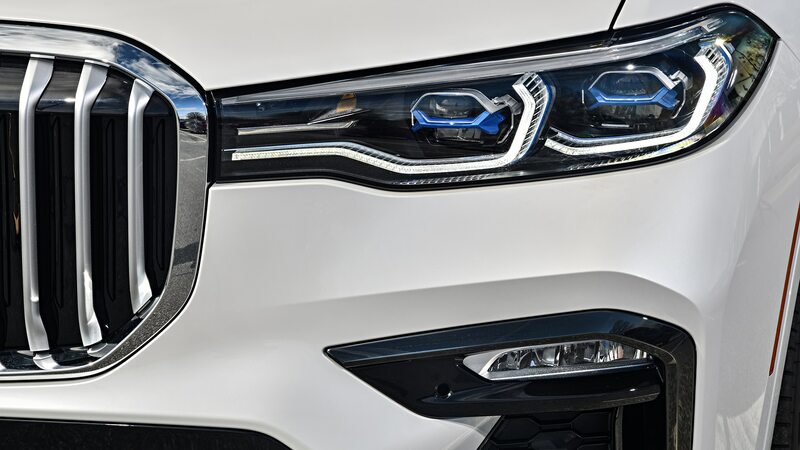 The six and the eight are each plenty strong at nearly any rpm, and in fact BMW’s own acceleration numbers are only 0.6 second apart, with the quicker 50i needing just 5.2 seconds to move its substantial 5,600-plus pounds to 60 mph. 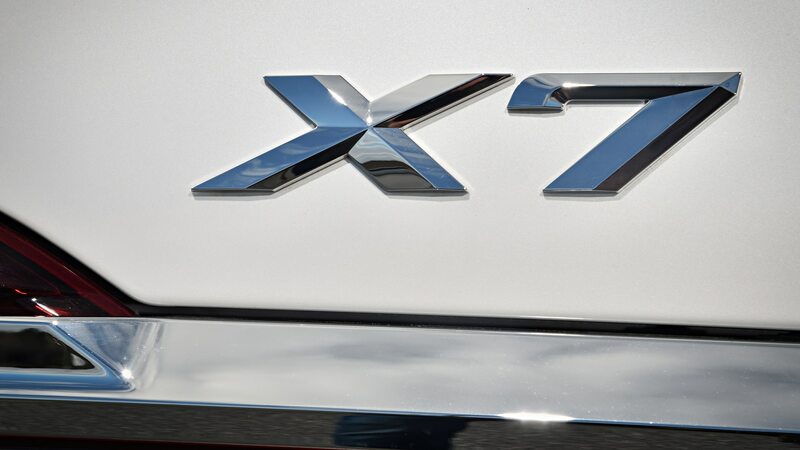 Also, the X7 will tow up to 7,500 pounds in gilded jet-skis or whatever you like. 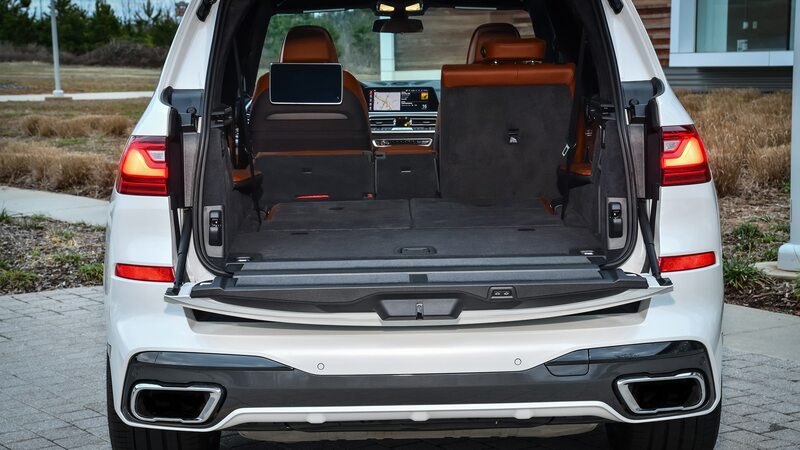 The X7s tapped for the trip were all fully loaded or very close to it, so you won’t be able to experience their sumptuous, navy and white leather interiors; five-zone automatic climate control; massaging front seats; or top-spec Bowers & Wilkins surround-sound audio systems—among myriad other delights—for anywhere near their starting prices of $74,895 (xDrive40i) or $93,595 (xDrive50i). 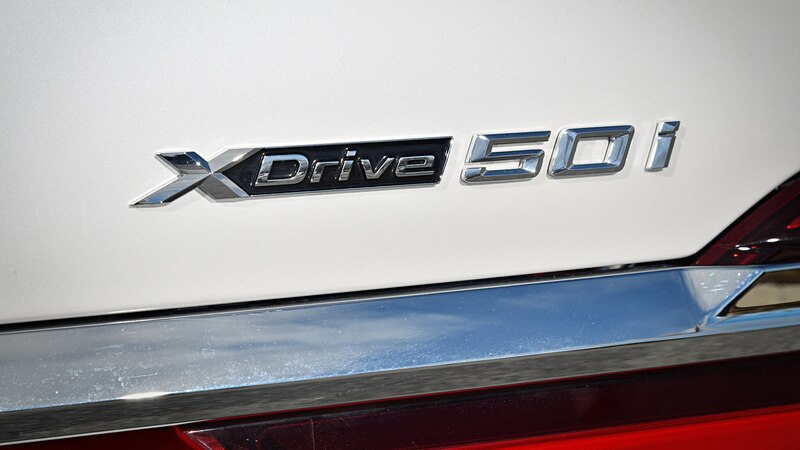 You’ll need to venture into six-figure territory to do so, as our 40i ran $100,995 and our 50i $120,945. 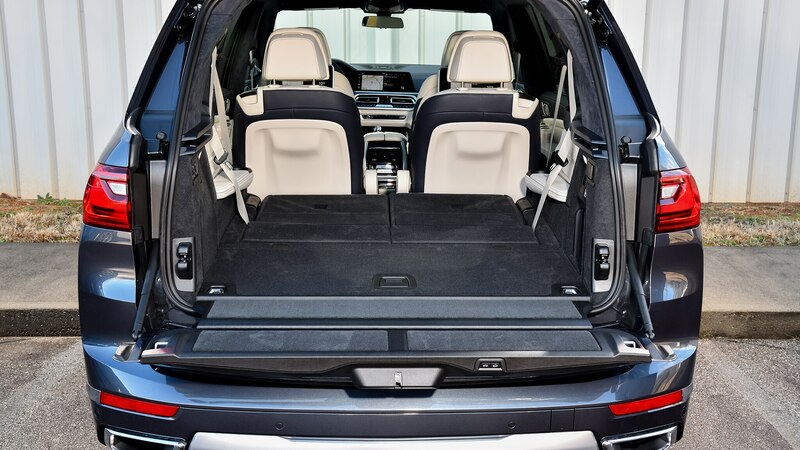 In that price bracket, however, there’s not a more cosseting or luxurious full-size SUV on the road right now. 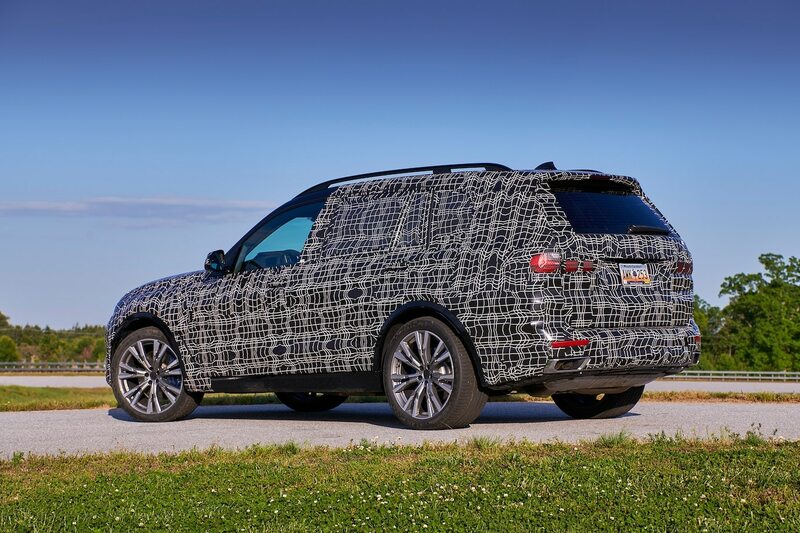 Mercedes is prepping an all-new GLS for launch later this year, though, at which point the battle will truly be on. 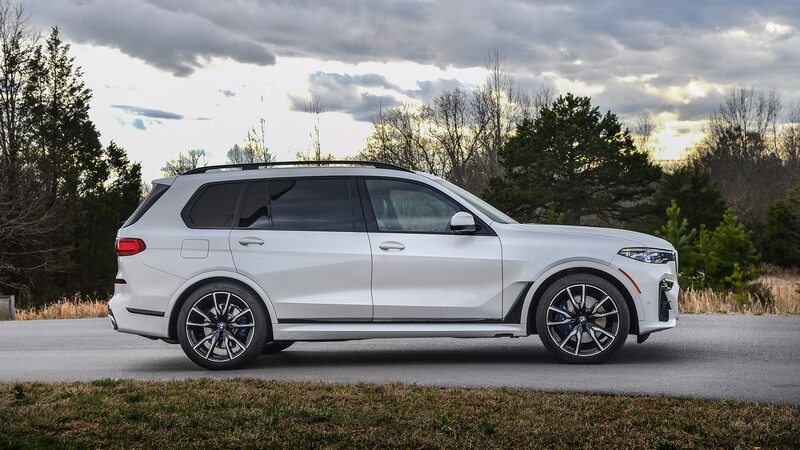 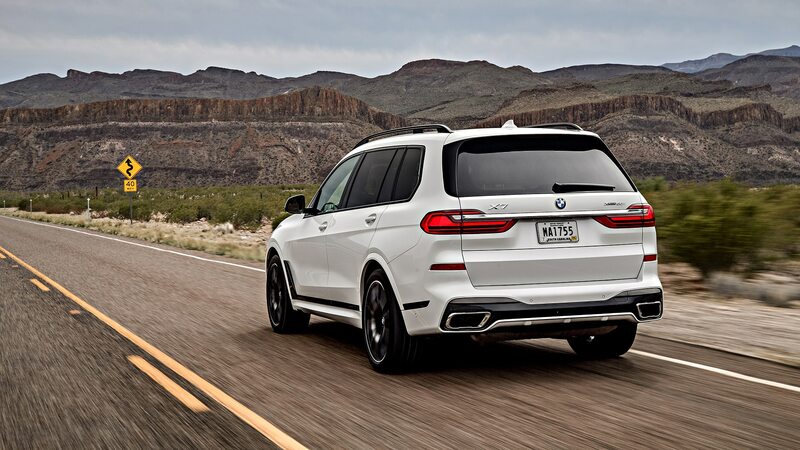 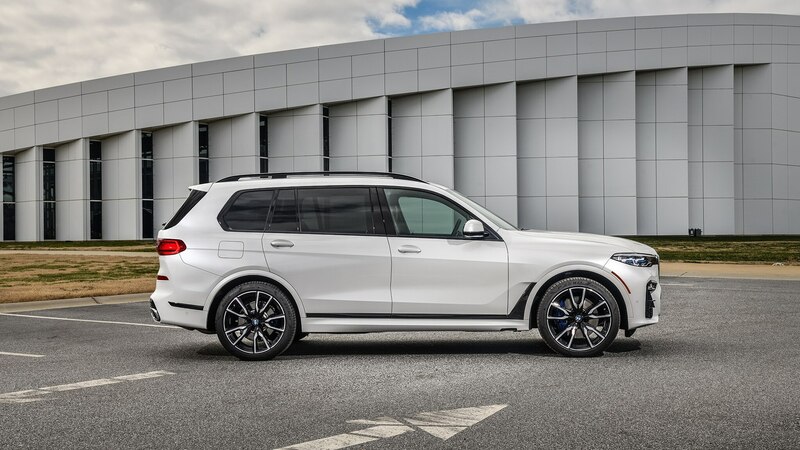 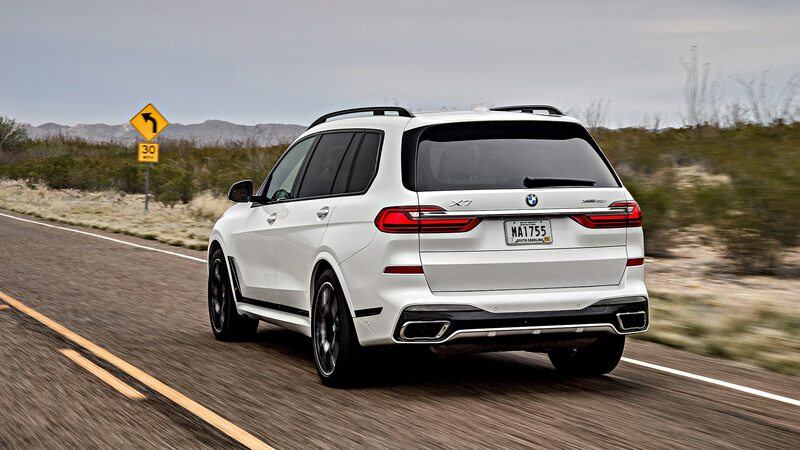 Both versions we drove rode on gorgeous, max-spec 22-inch wheels and run-flat performance tires (20s and all-seasons are standard), so the key difference besides the engine between the X7s we drove was the 50i’s optional M Sport and Dynamic Handling packages. 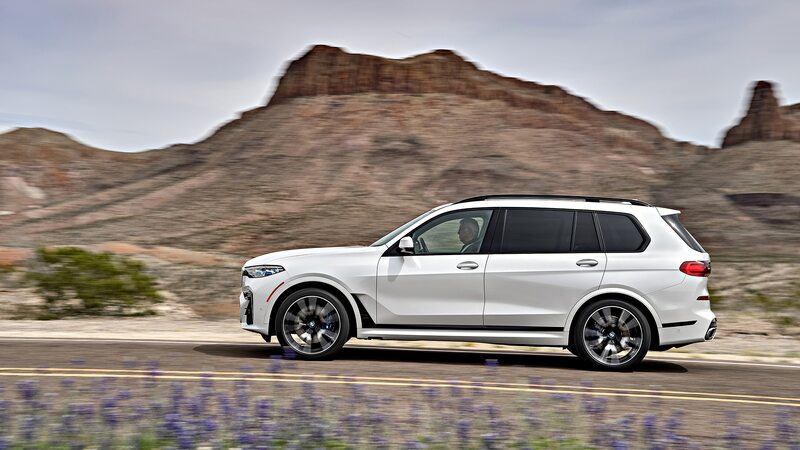 The ride quality of both models—the six-cylinder had the standard air suspension, the V-8 the Active Comfort Drive adjustable anti-roll bars—was acceptably supple on the relatively nice tarmac of our drive route, but we’ll wait to try similar models, as well as those on smaller wheels and all-season tires, on rougher roads to render a final verdict. 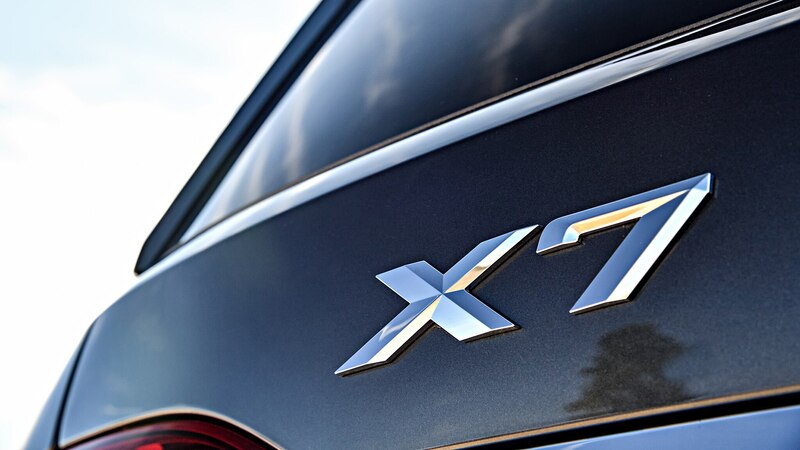 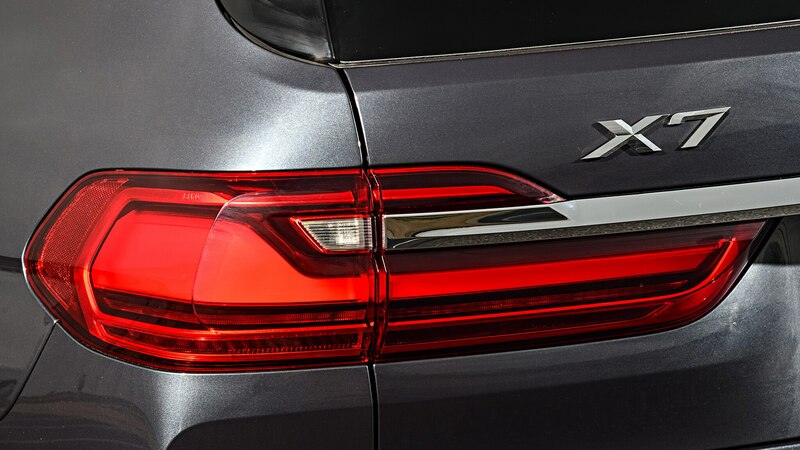 Jörg Wunder, the project manager for the X7 told us that the vehicle was developed to be more in the vein of the 7 Series than to simply be a larger version of the decidedly sporty-leaning X5, and both the extravagant and extensive equipment list and the driving character give truth to his statement. 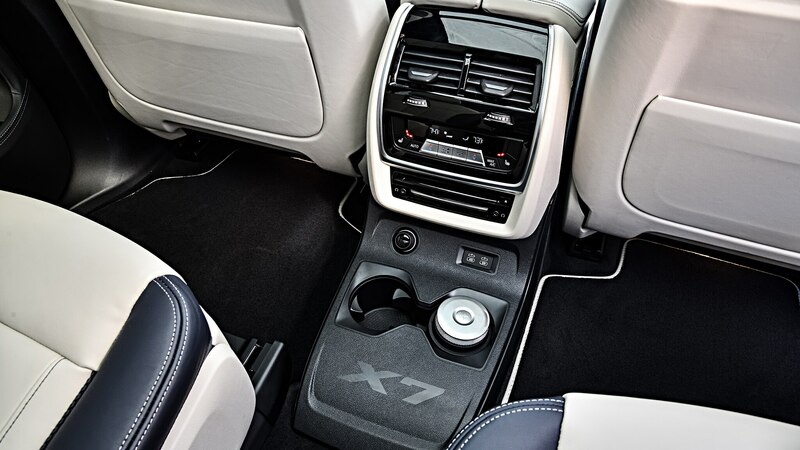 Left in its default Normal chassis mode, the tall X7 is a bit of a bob and weaver, with aggressive or abrupt inputs—or even sawing back and forth on the steering wheel to avoid, say, a stray tumbleweed or turquoise-jewelry vendor—leading to a small but noticeable amount of dive and squat, as well as a slight wiggle in the rear end. 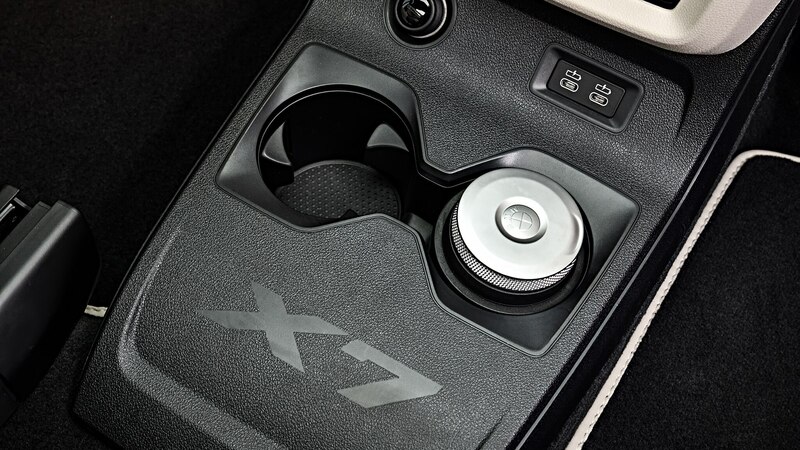 The X7 never feels unstable or out of sorts; it simply takes a moment to set itself right. 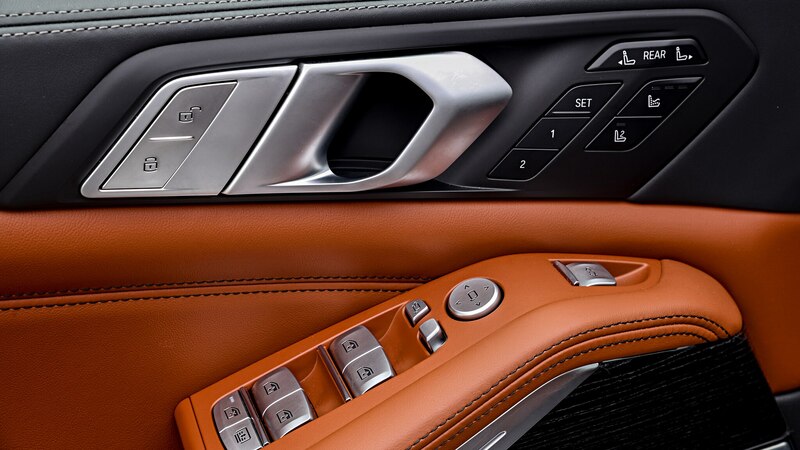 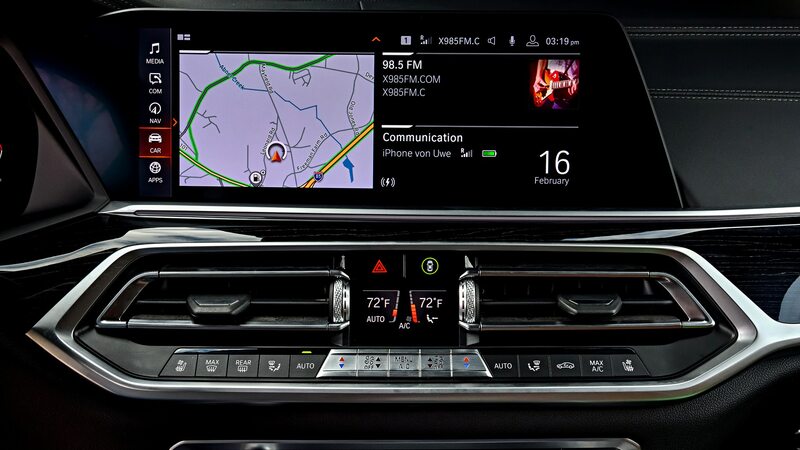 There is a real Bimmer hiding underneath, though, once you activate Sport mode via a center-console-mounted button. 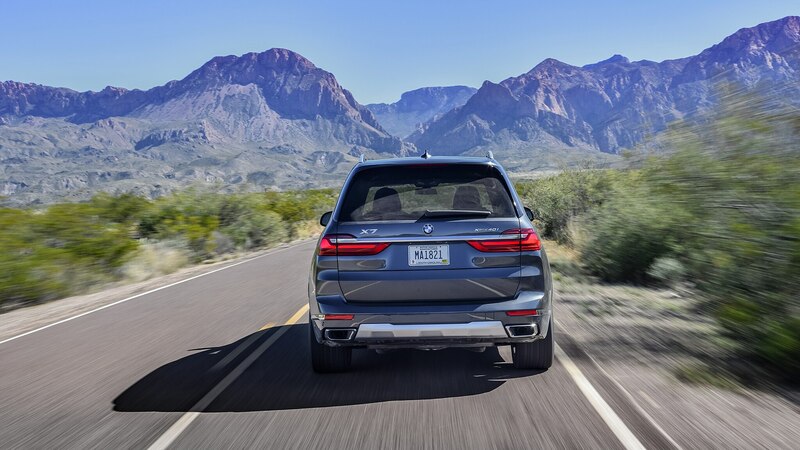 In Sport, especially with the Dynamic Handling–equipped 50i, the X7 cinches itself down, taking a set immediately on any change in direction. 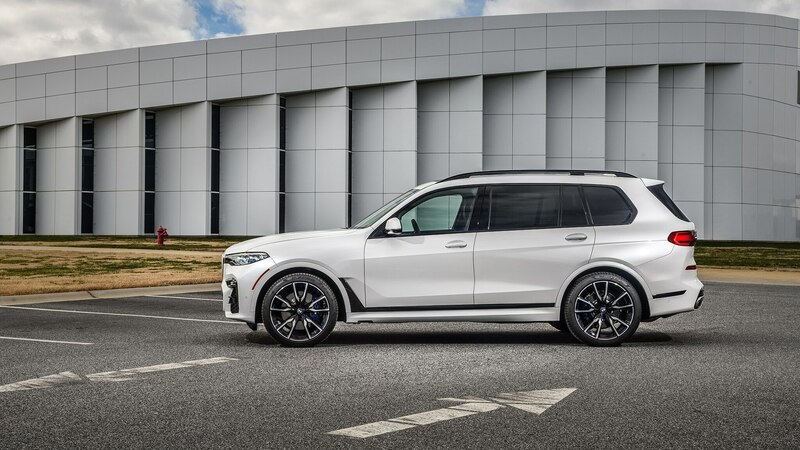 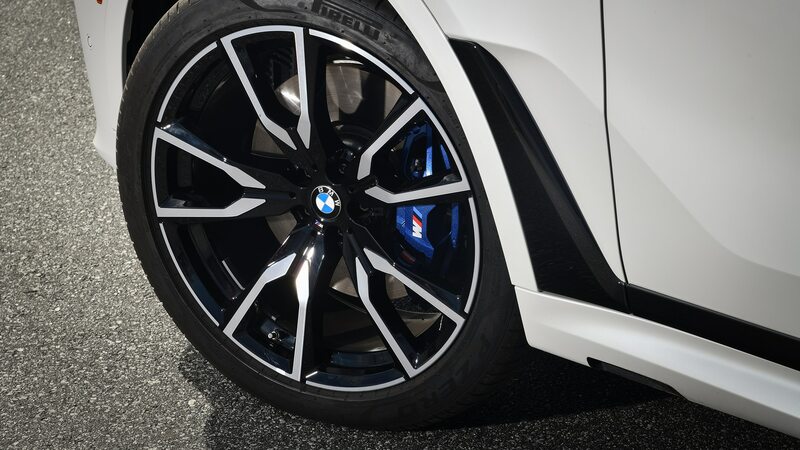 Sport also weights up the steering, invigorates the M Sport bundle’s active exhaust—which sounds fantastic, particularly from the third row; thrill the kids!—and lowers the ride height by 0.8 inch. 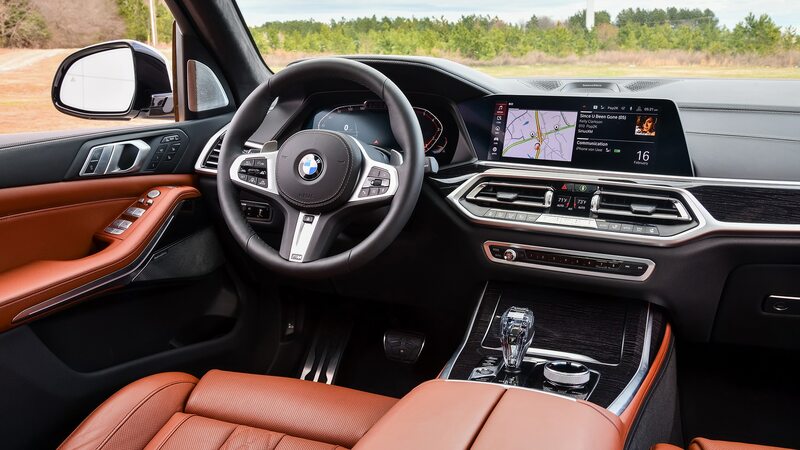 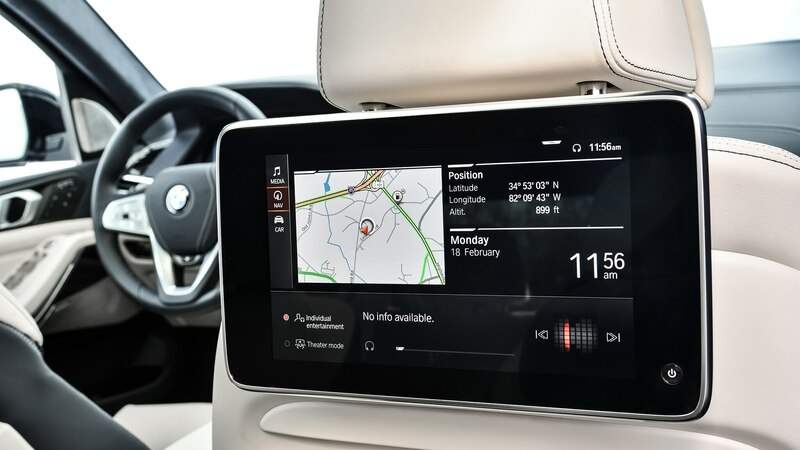 Were it our X7, we’d use the Individual mode to select the lighter and slower but still feelsome Comfort steering, Sport suspension, and Sport powertrain settings. 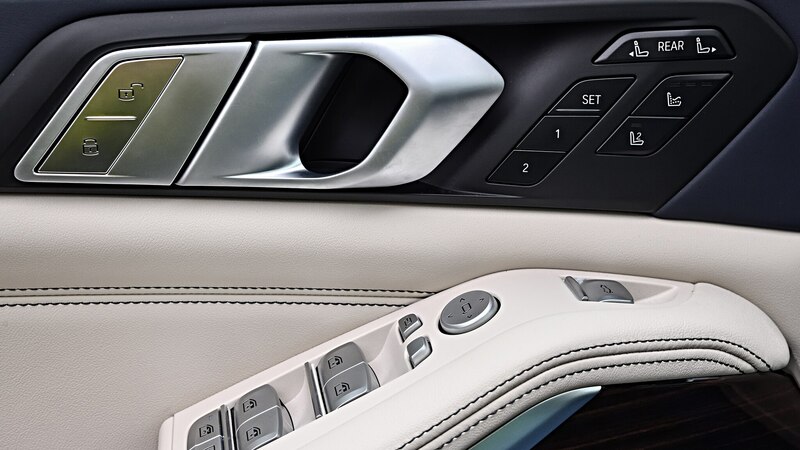 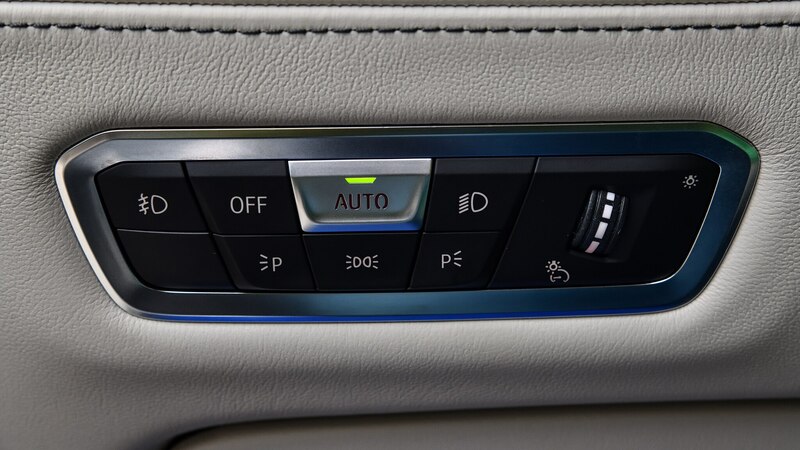 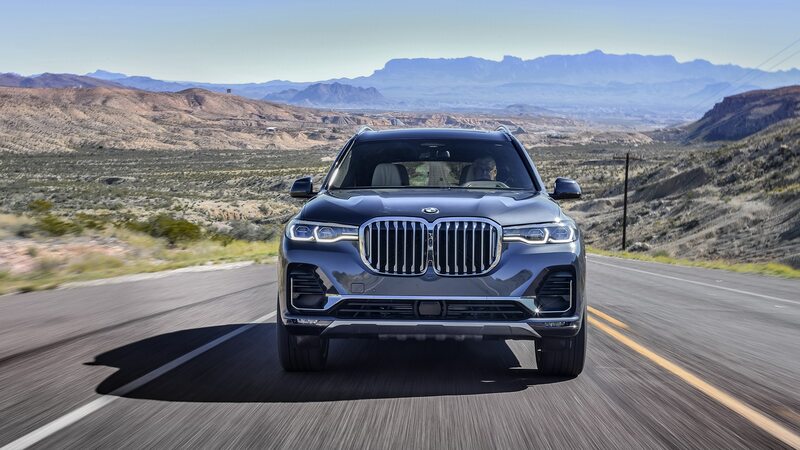 The latter two are key to finding the most enjoyment behind the wheel, and the X7 thankfully remembers which mode you were in when it was last turned off. 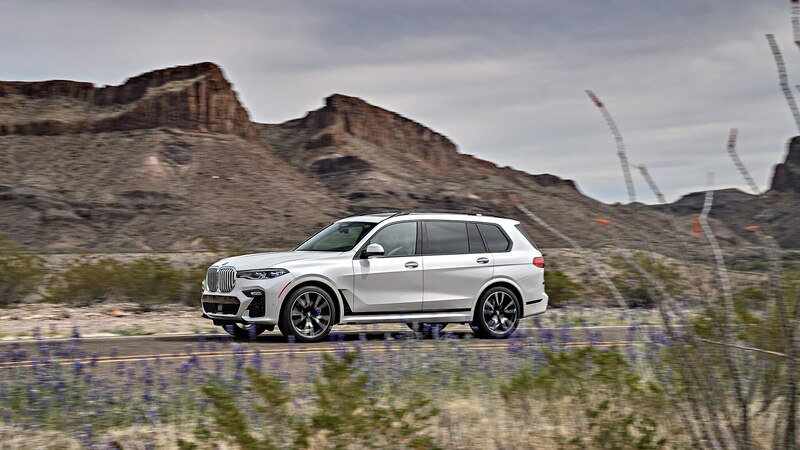 We didn’t have a chance to push the 50i hard enough on our wending desert route to truly feel the M Sport differential in action, but our experience in other BMWs says the hardware will do what it’s supposed to, namely mitigate understeer and help the big SUV turn into corners with more alacrity. 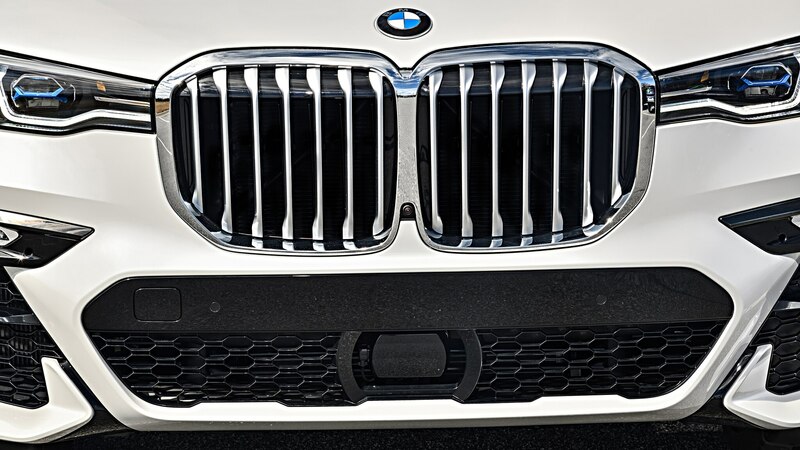 While the size of BMW’s traditional kidney grilles has caused some consternation among the internet commentariat, they’re fine in person—more overly renal than overwrought. 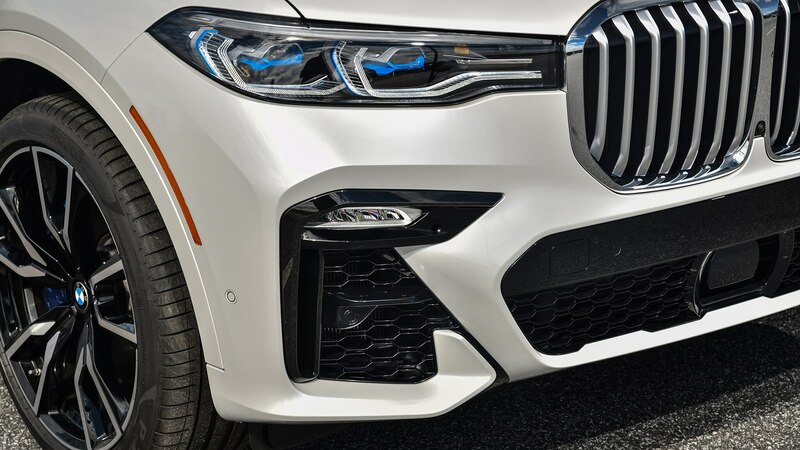 (The M Sport body kit’s huge, Cybertronic mouth is more problematic to our eye.) 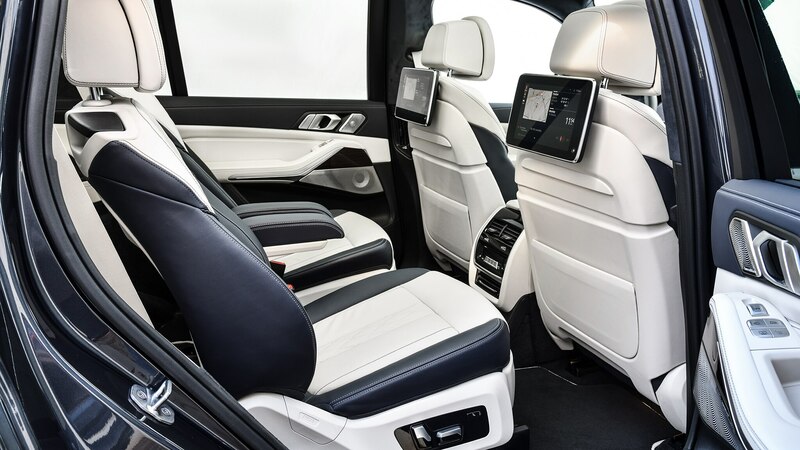 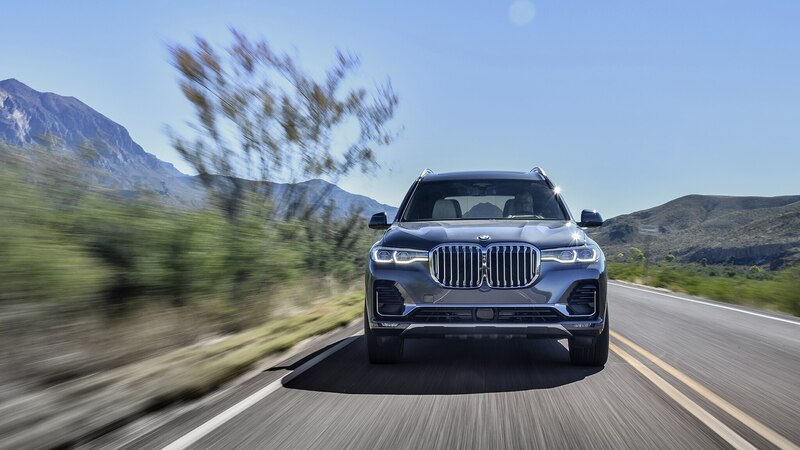 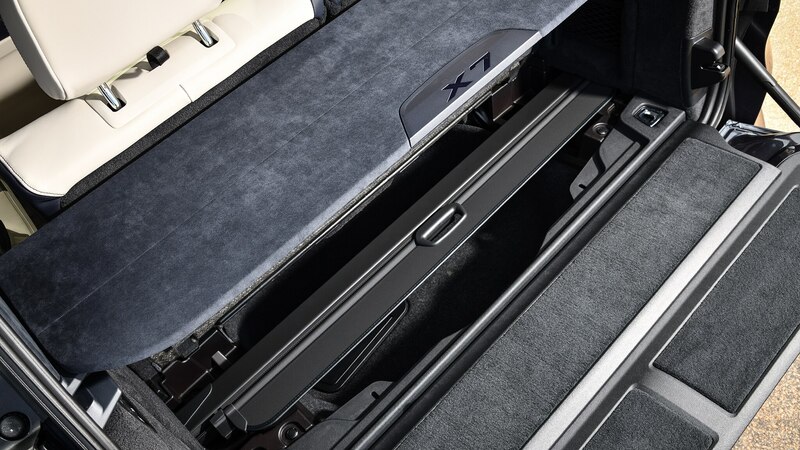 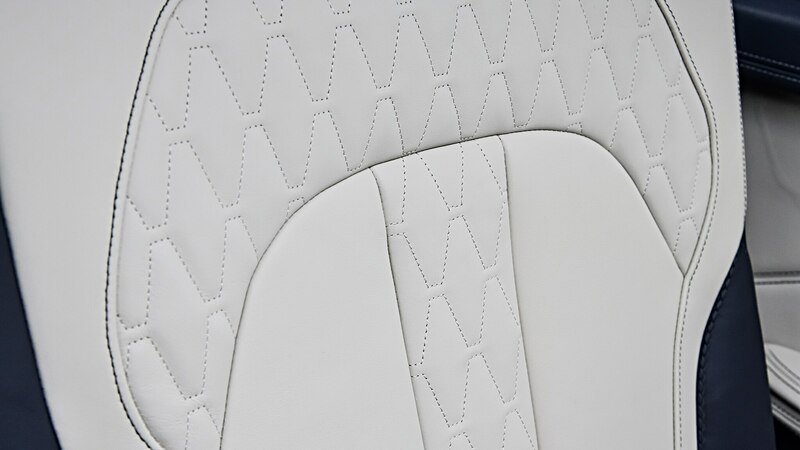 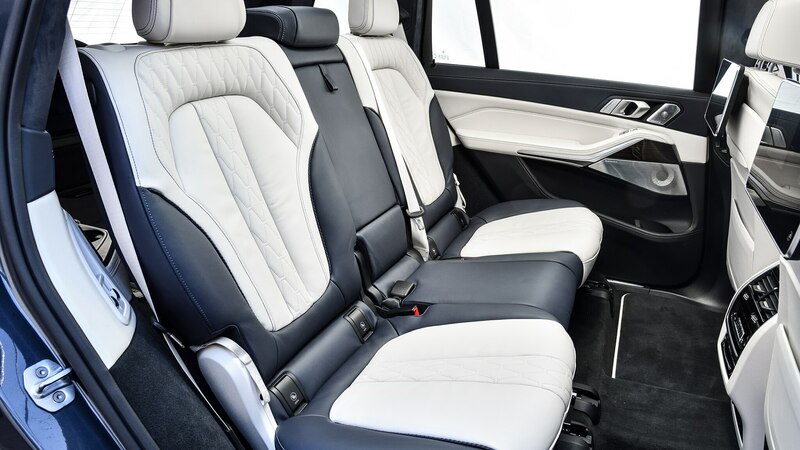 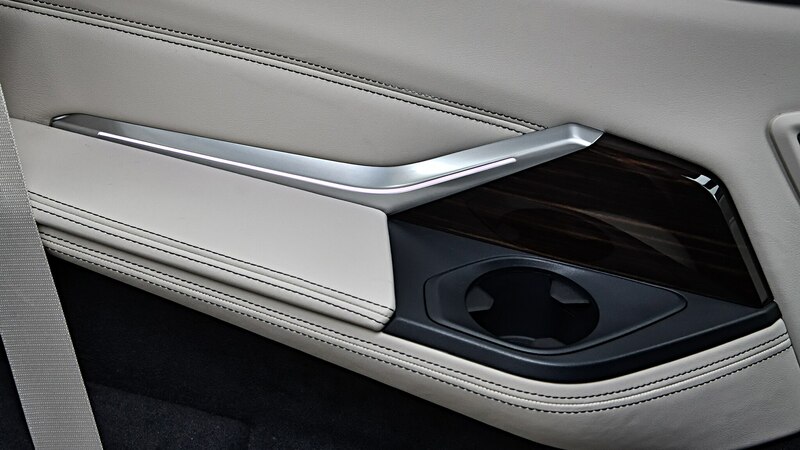 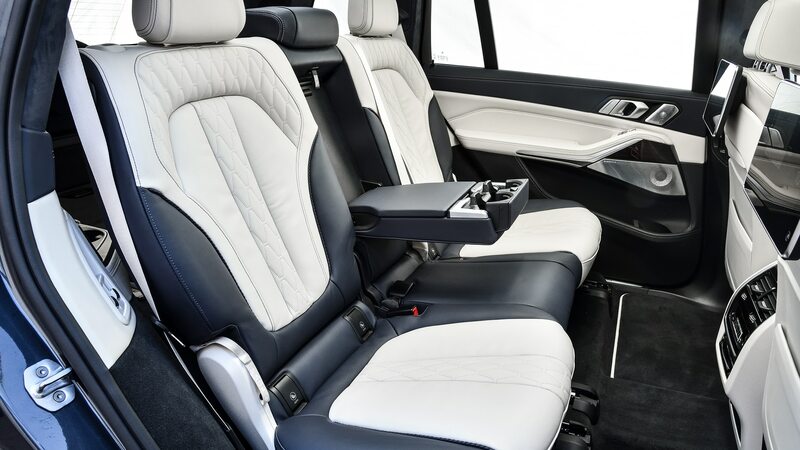 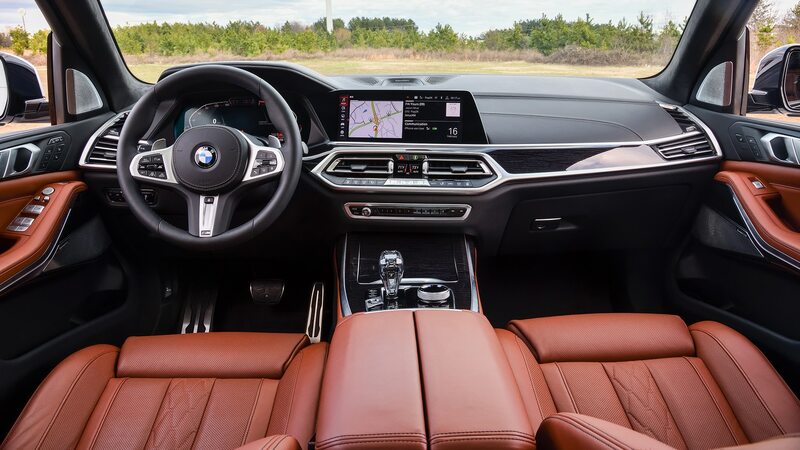 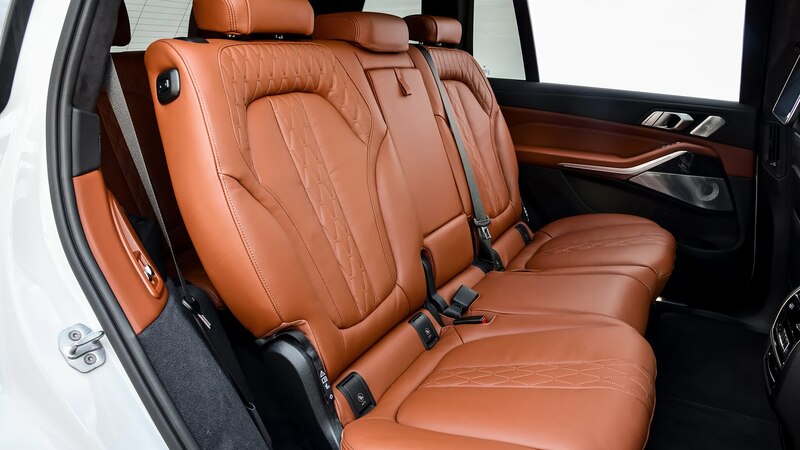 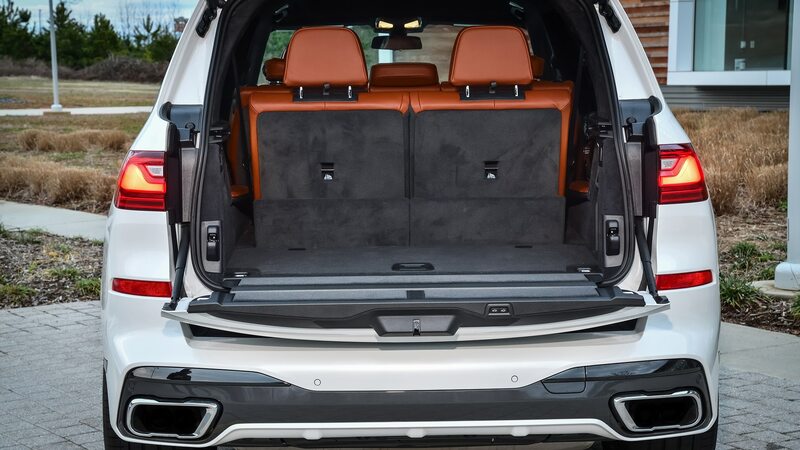 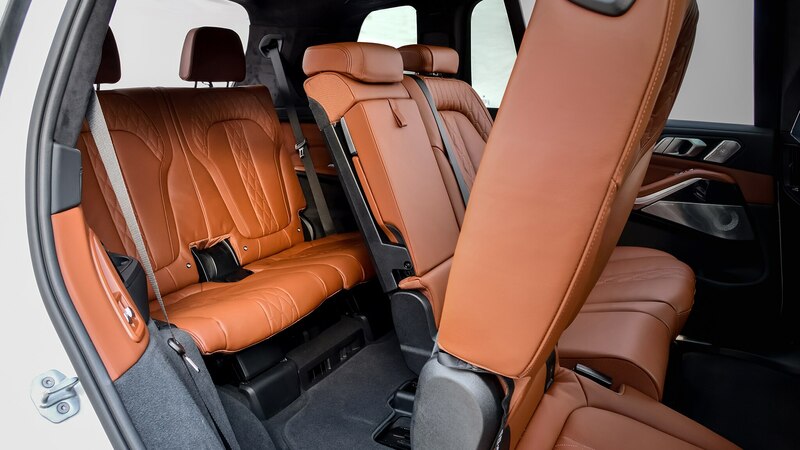 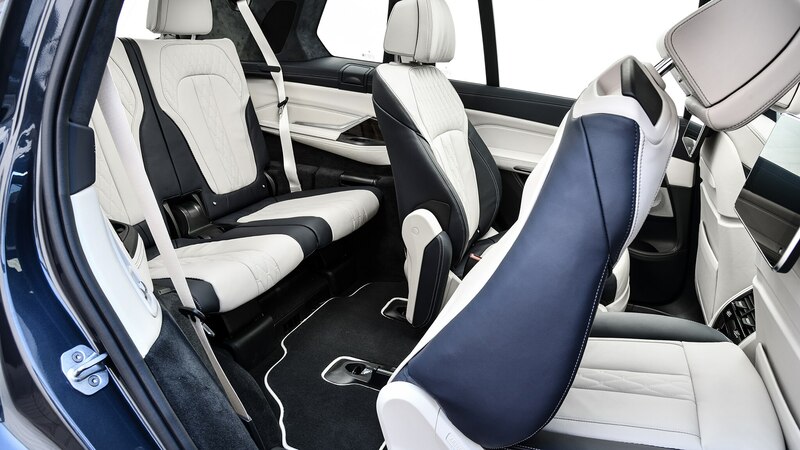 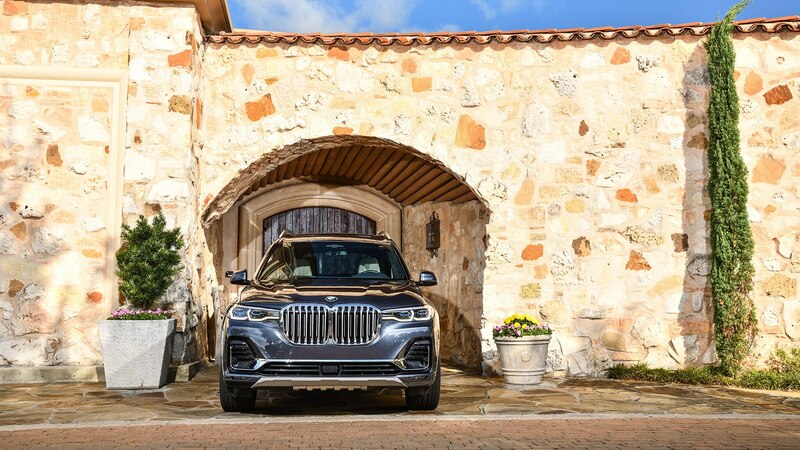 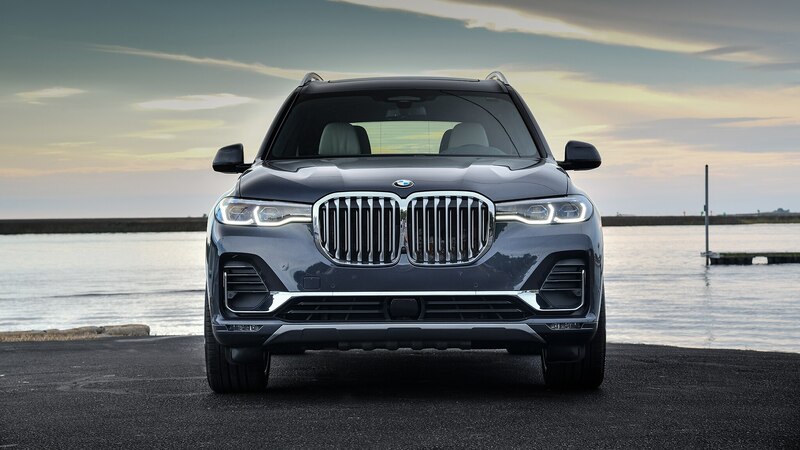 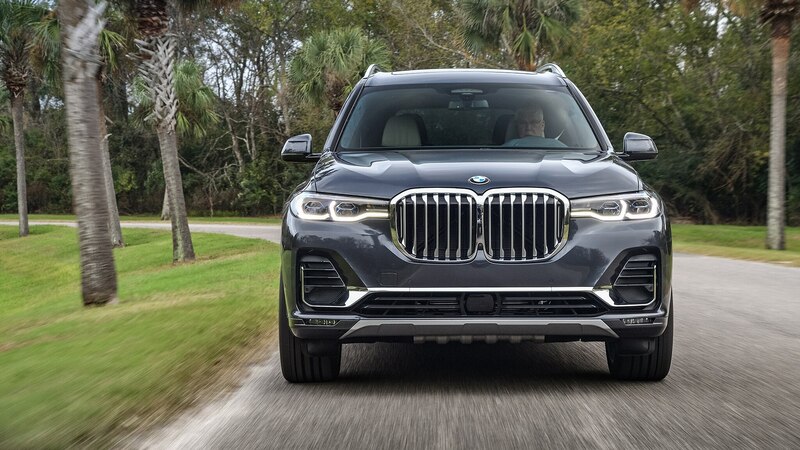 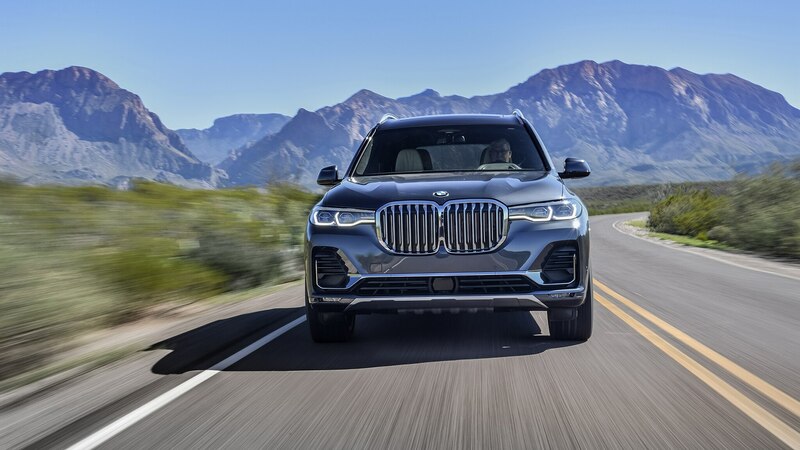 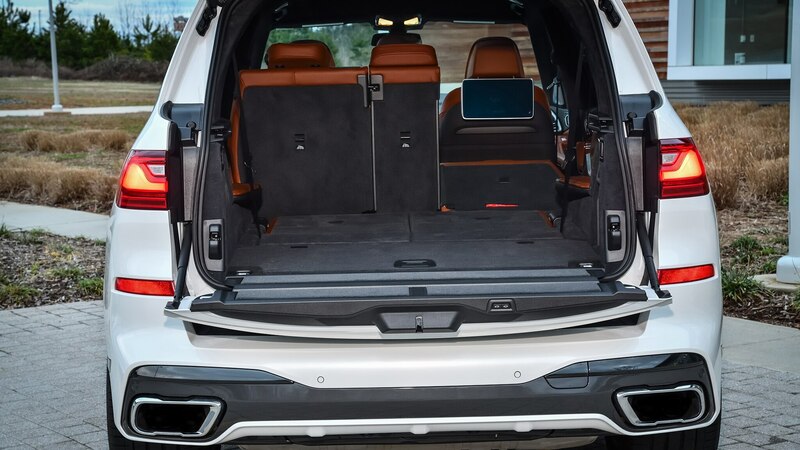 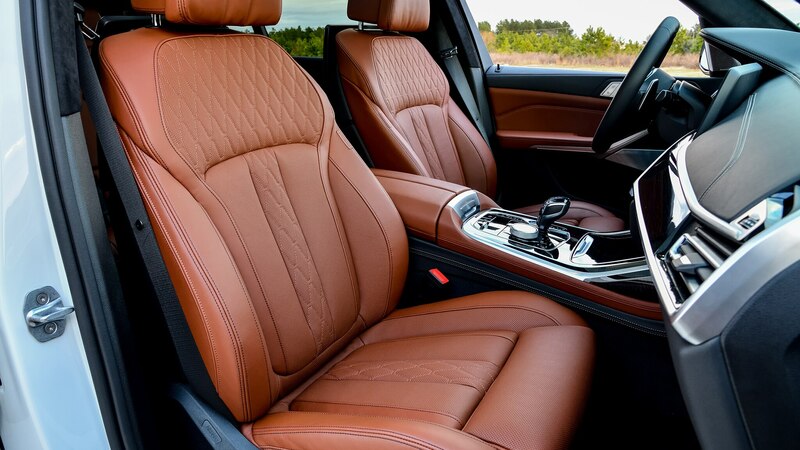 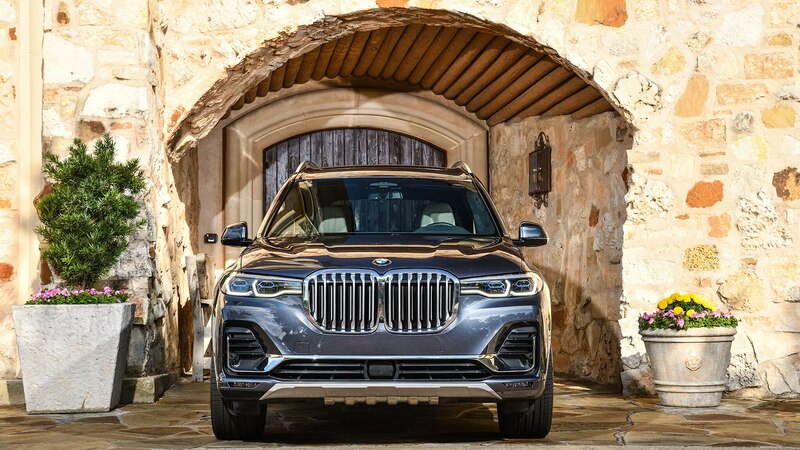 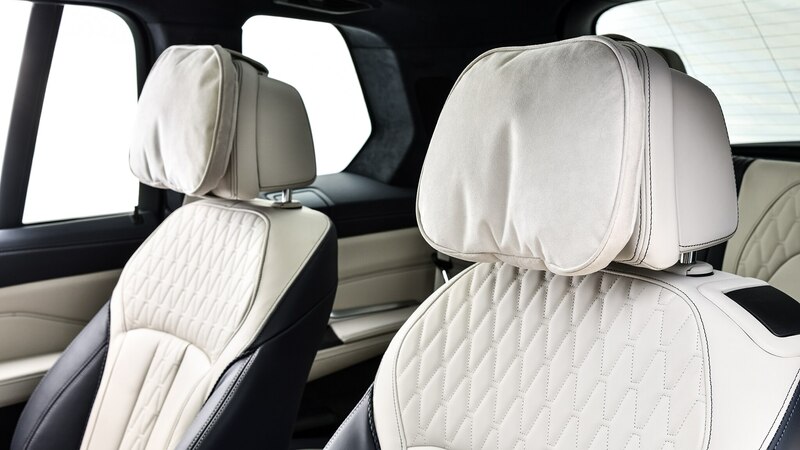 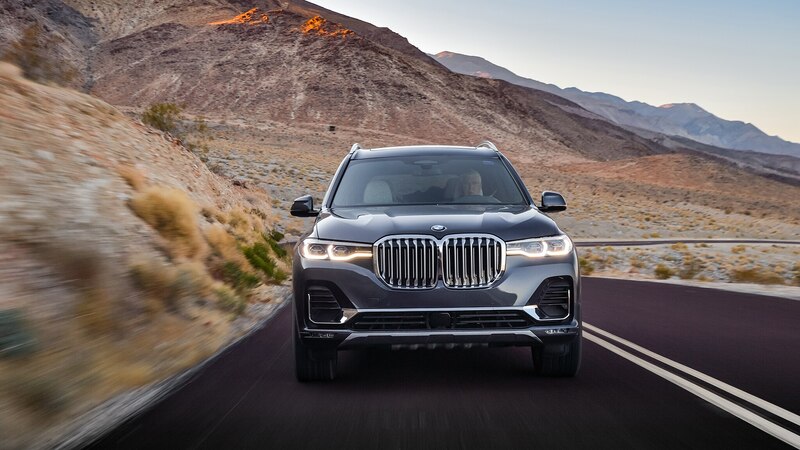 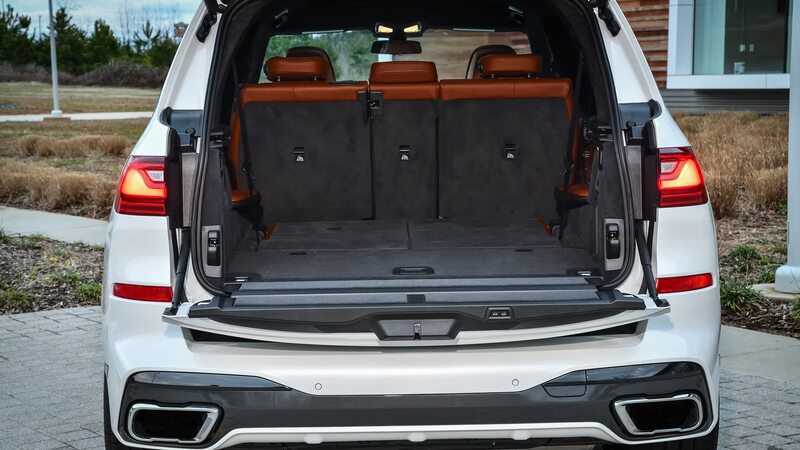 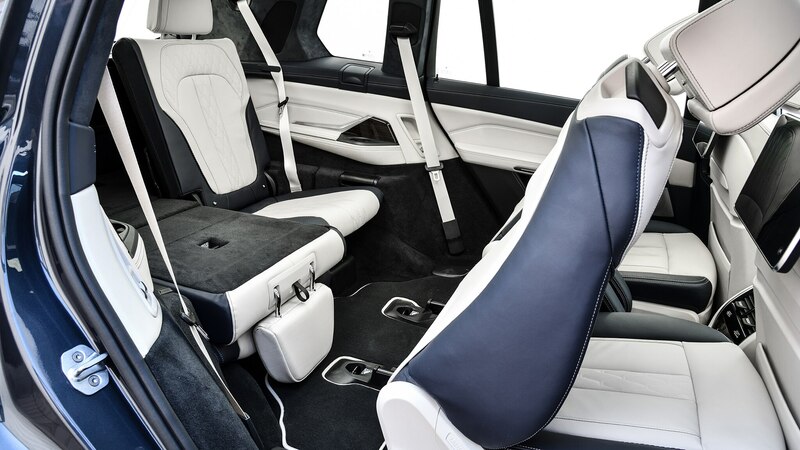 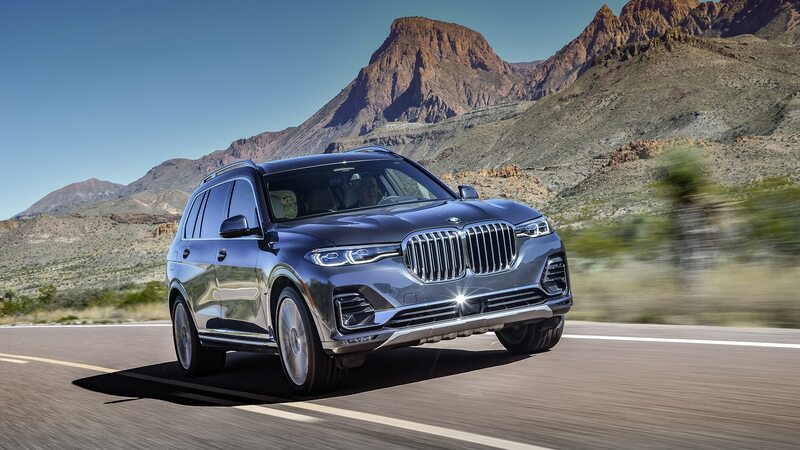 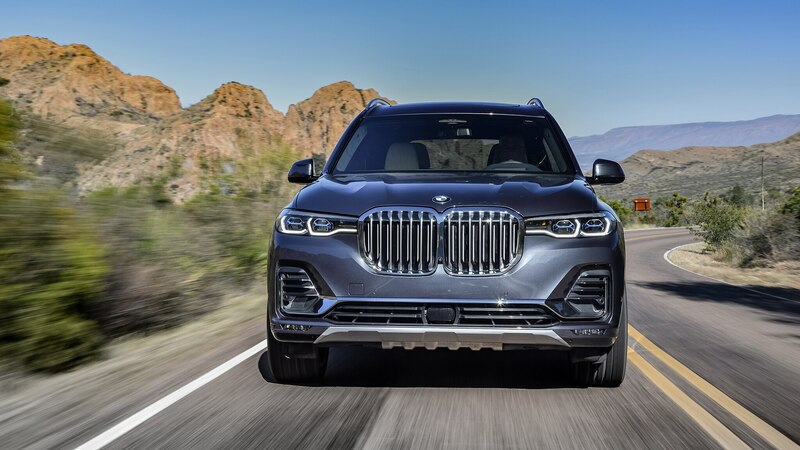 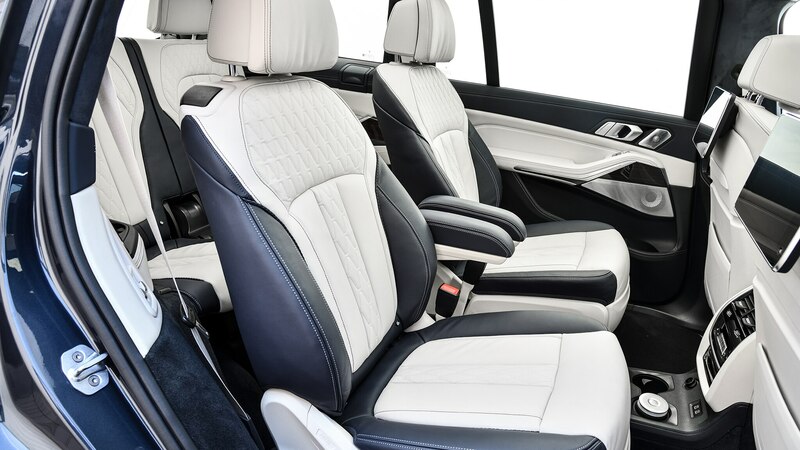 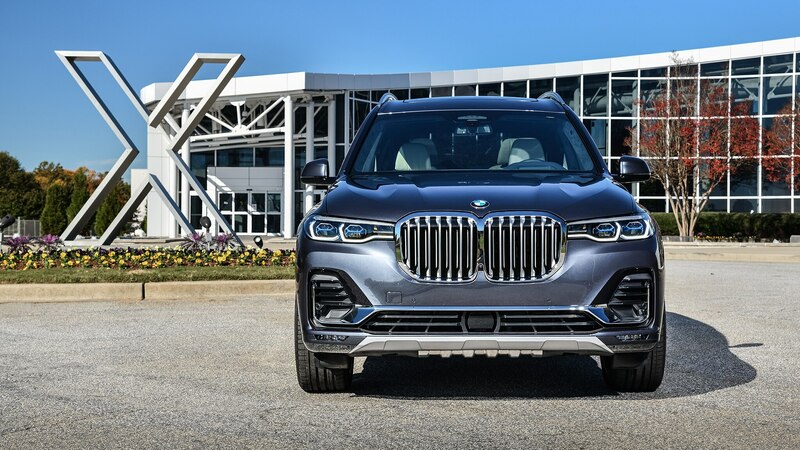 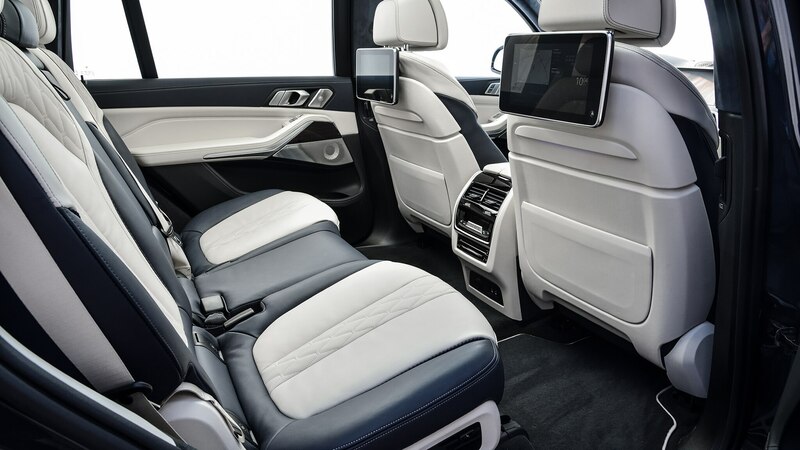 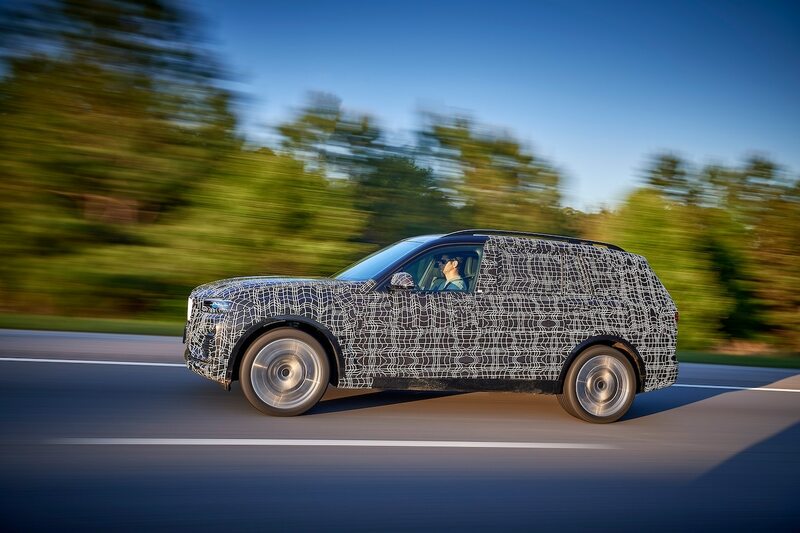 And really, the X7 is in general more handsome than it might seem in photographs, the upright greenhouse counterbalancing the SUV’s acres of sheetmetal and providing a sense of brightness inside, even in the back row of seats. 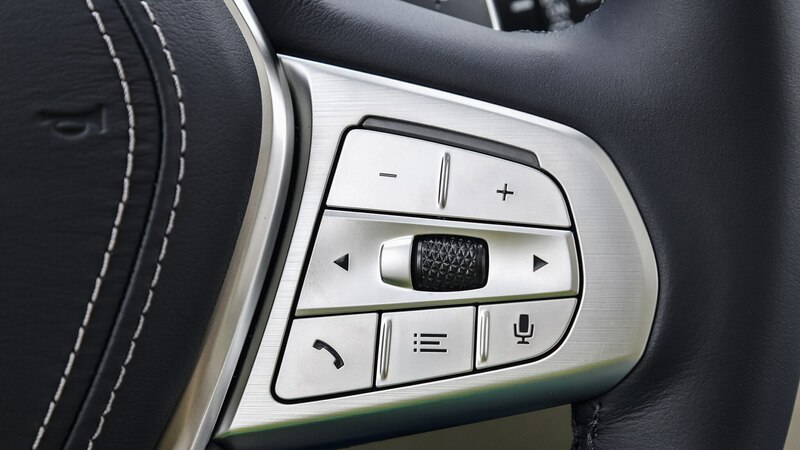 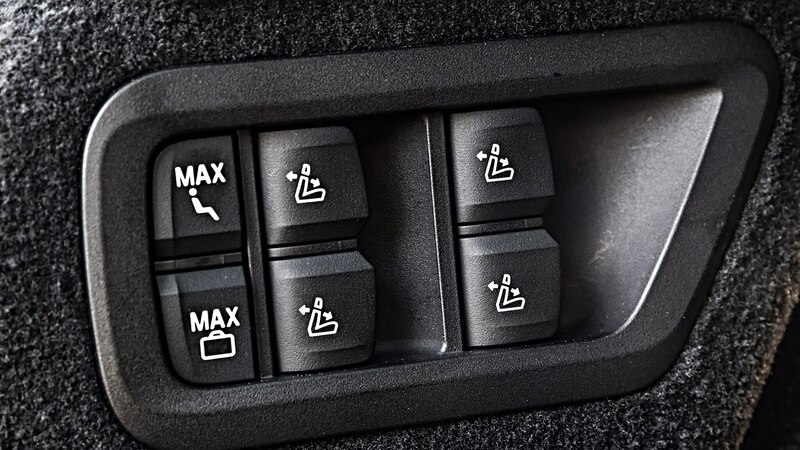 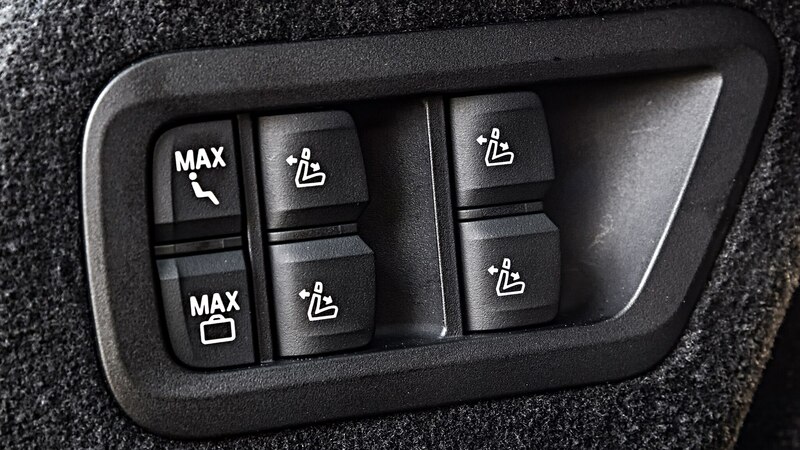 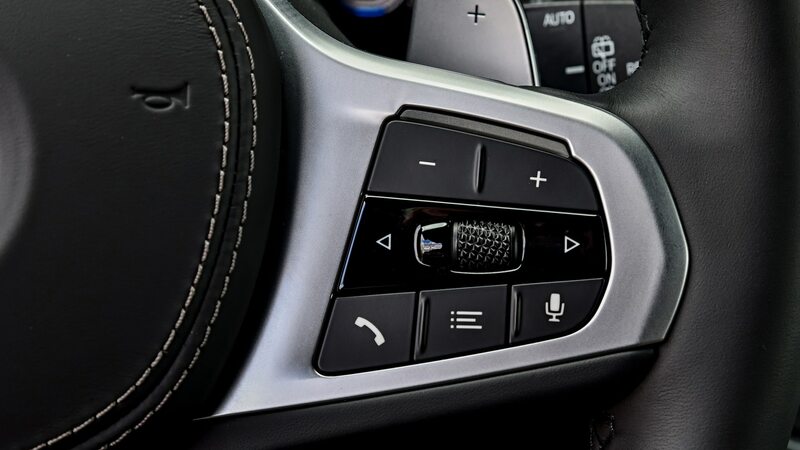 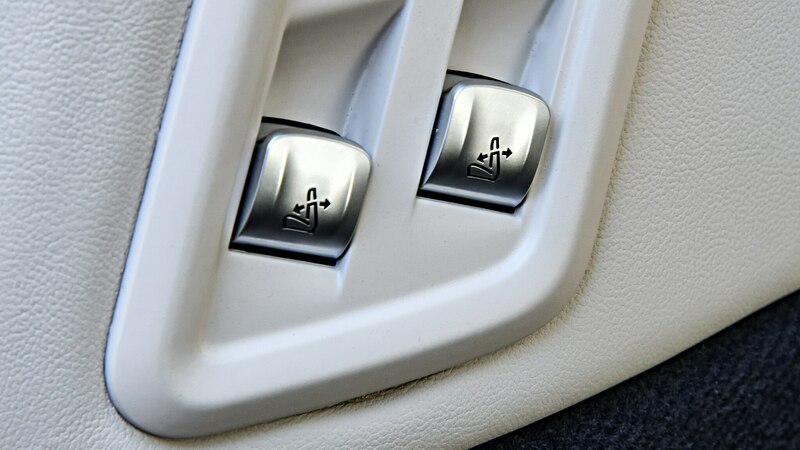 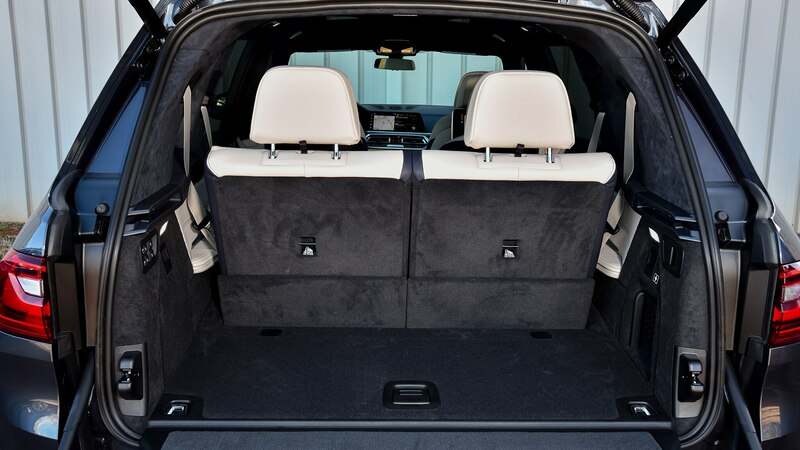 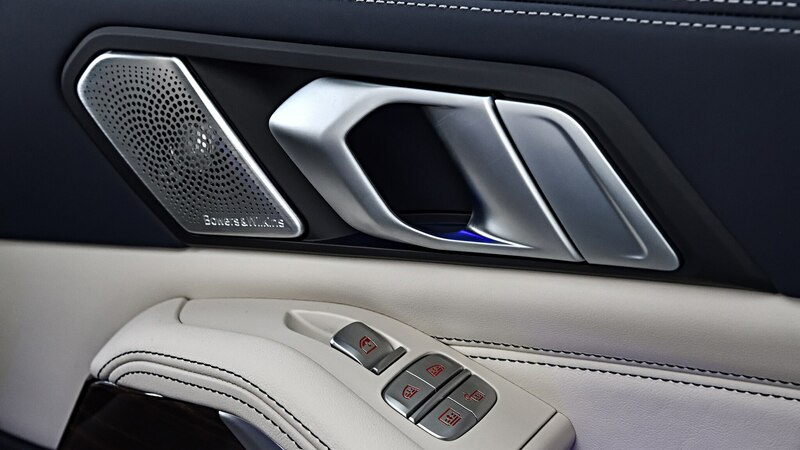 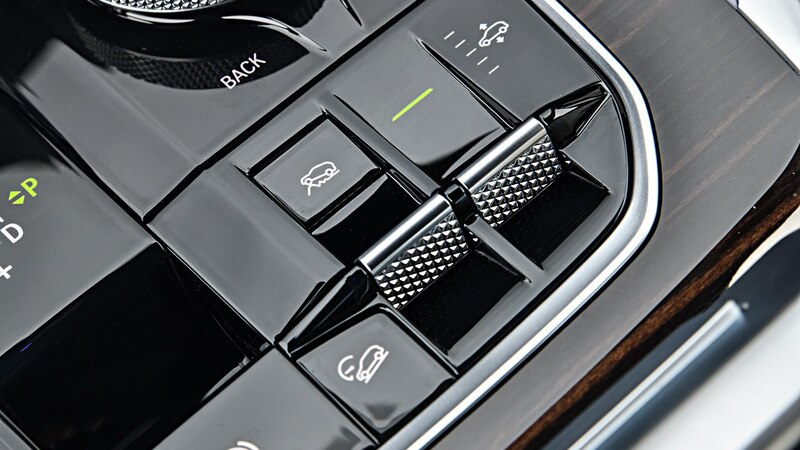 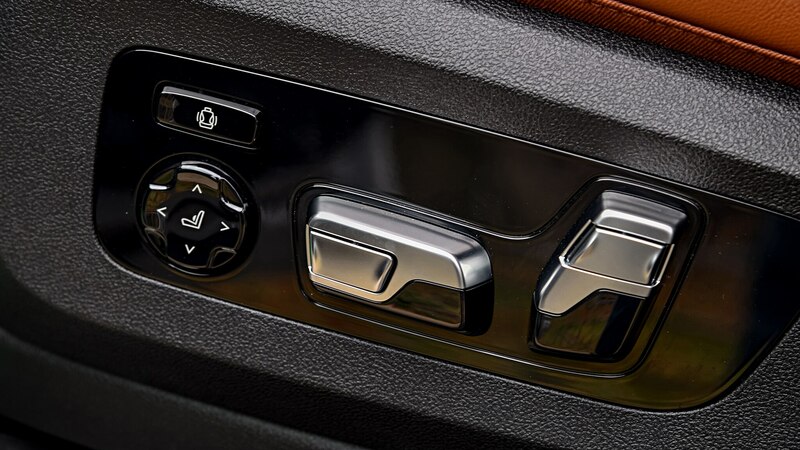 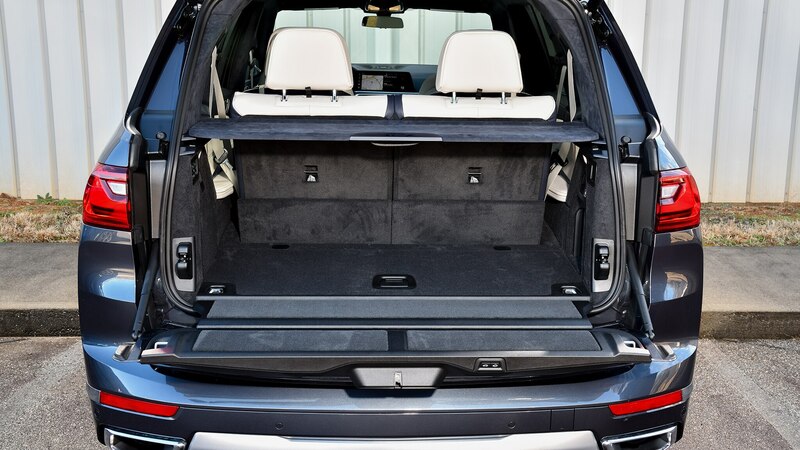 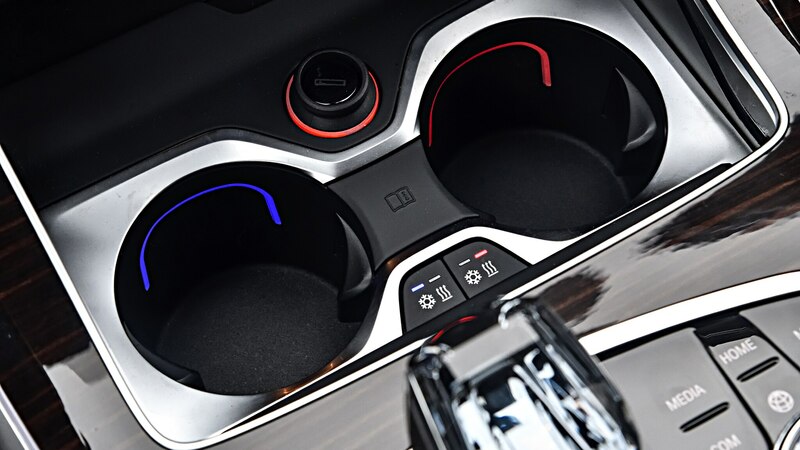 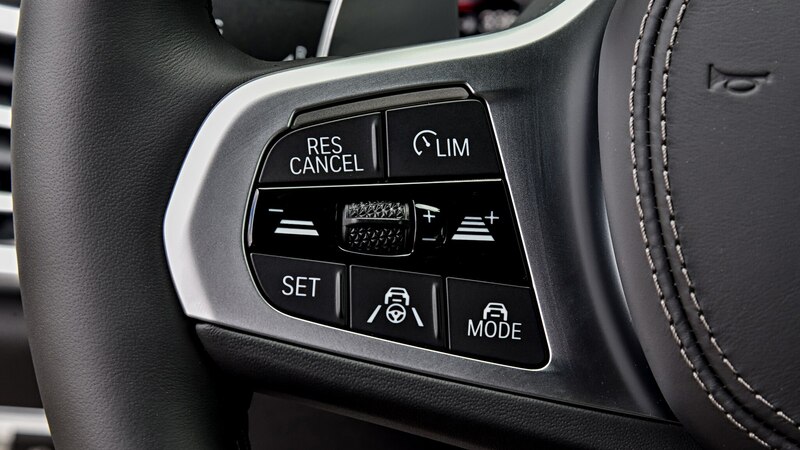 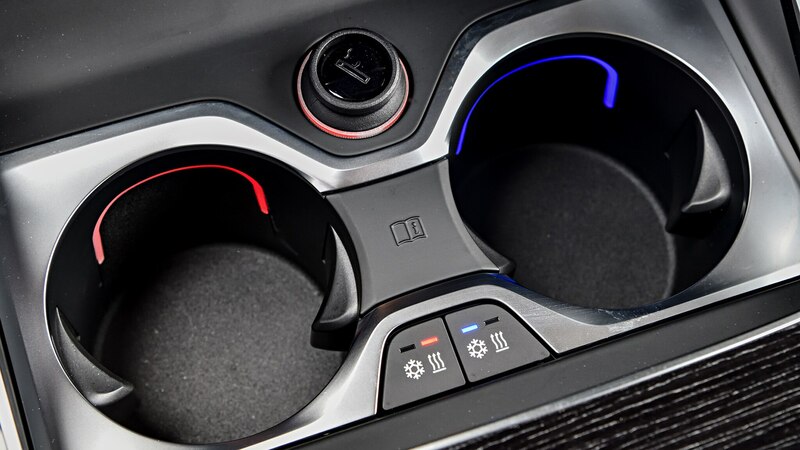 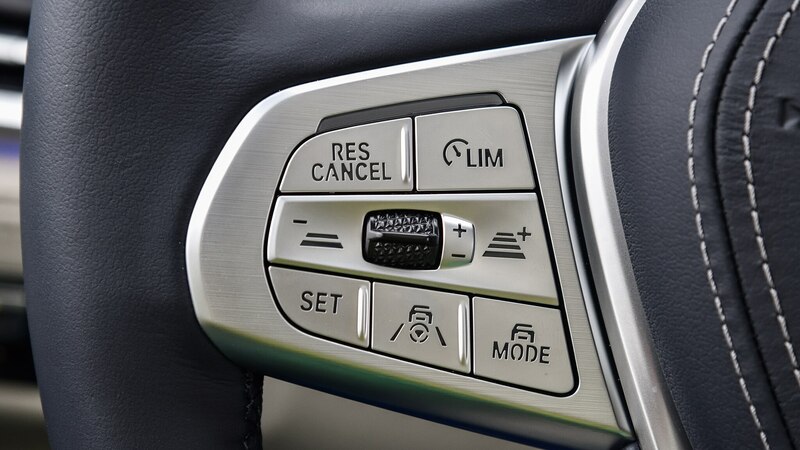 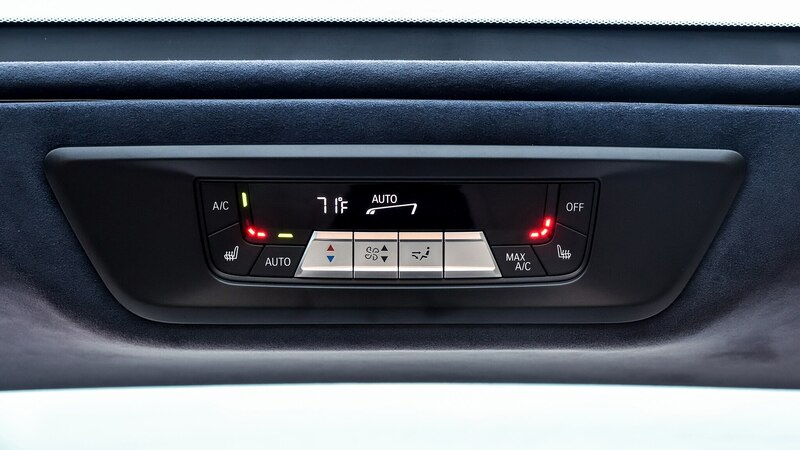 Accessing the way back is accomplished by moving the power-operated second row forward, which can be done by the driver or via switches inside the C-pillar or cargo area. 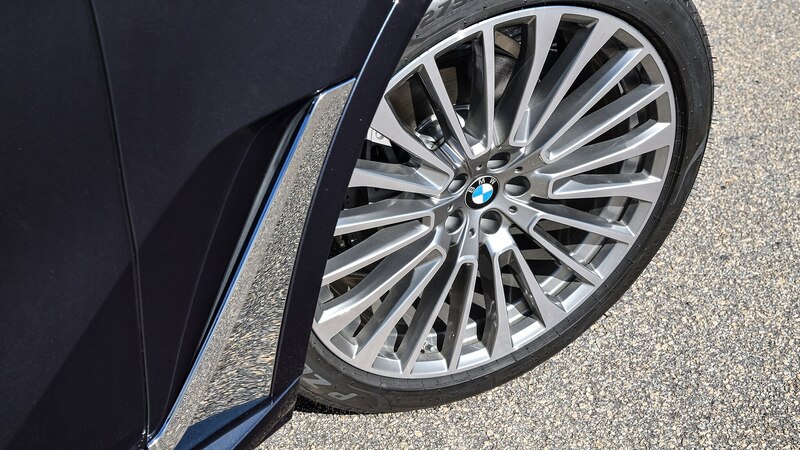 Prepare to be patient, though, as the electric motors are much slower than a nonmotorized mechanism. 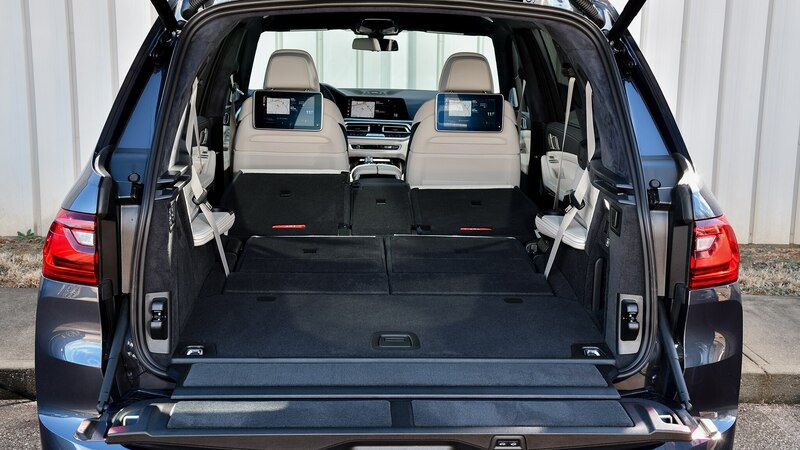 (Or just get the second-row captain’s chairs; you’ll reduce capacity by one but gain an aisle.) 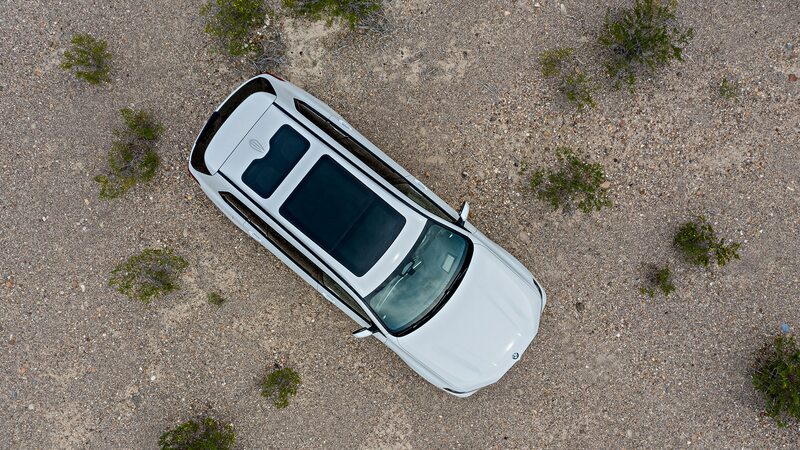 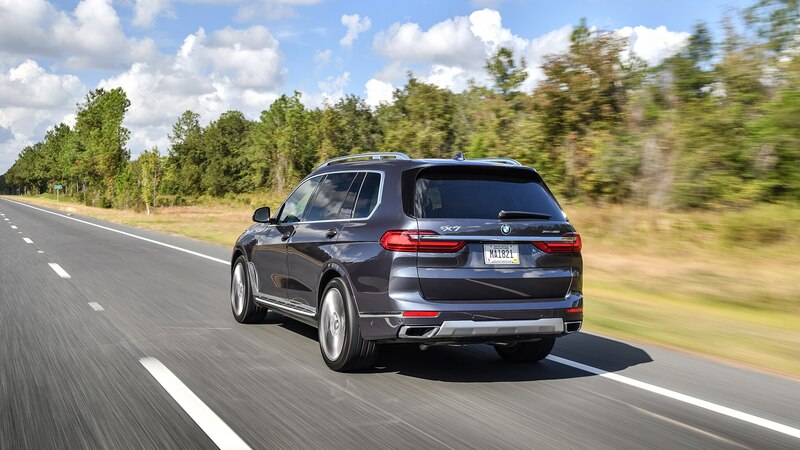 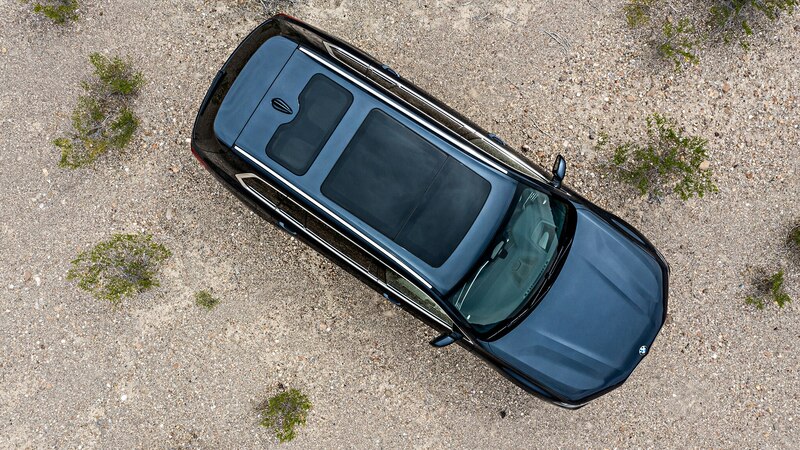 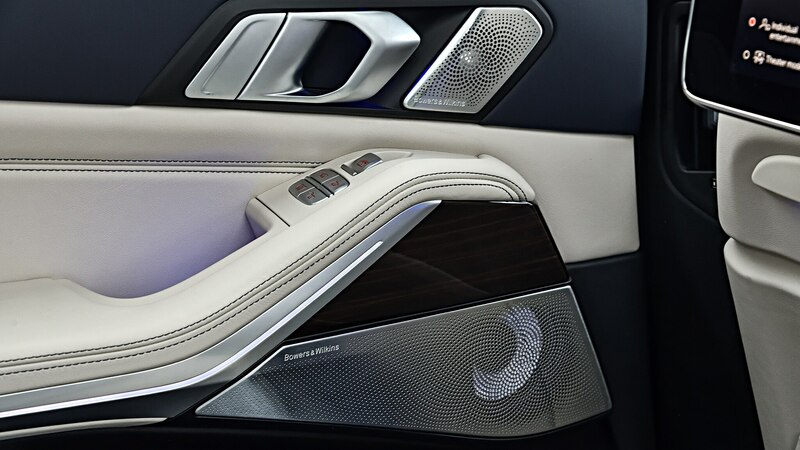 Once back there, passengers have access to a glass roof panel with its own power shade, a reasonable amount of room for an average adult, and two USB-C ports. 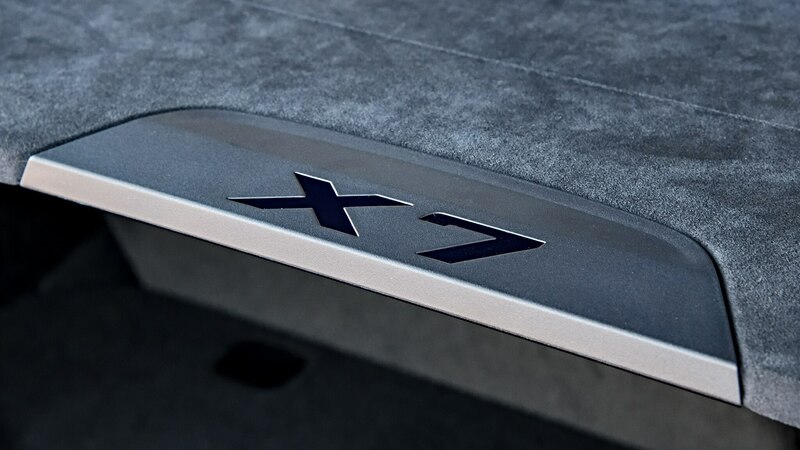 There are also two USB-C ports in the second row, and single USB-C and regular USB ports up front. 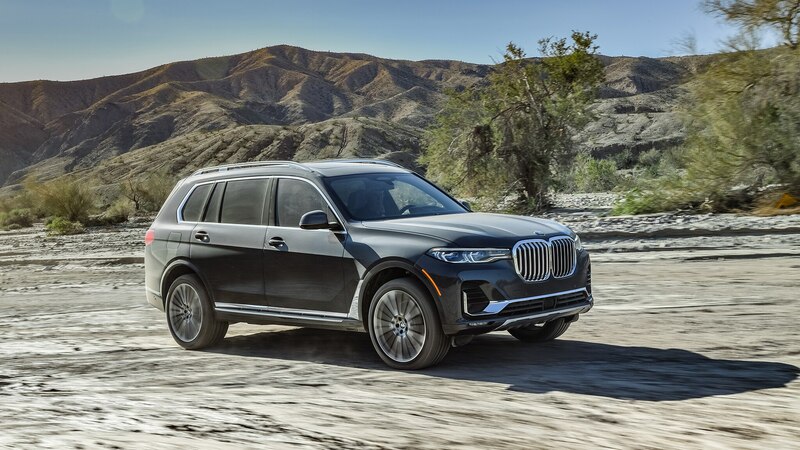 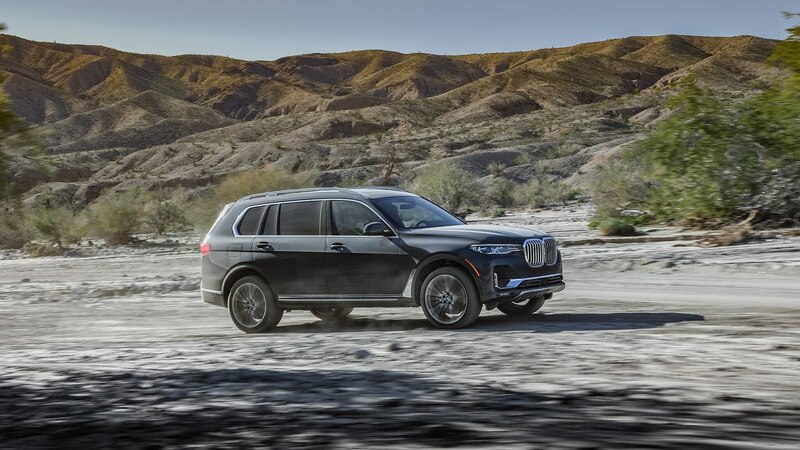 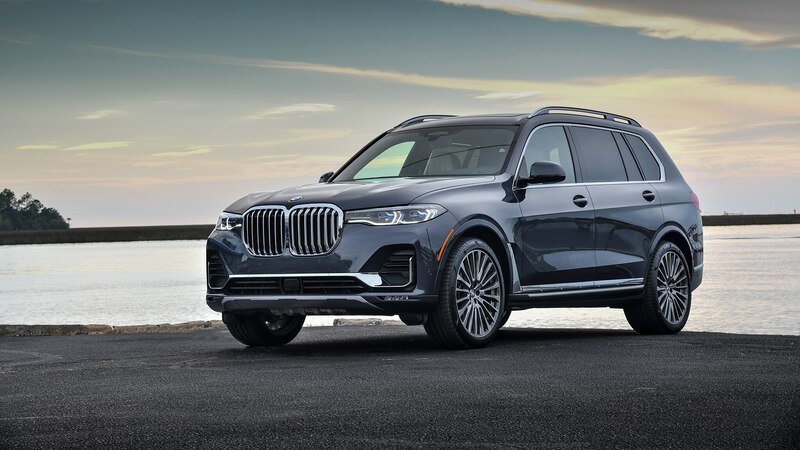 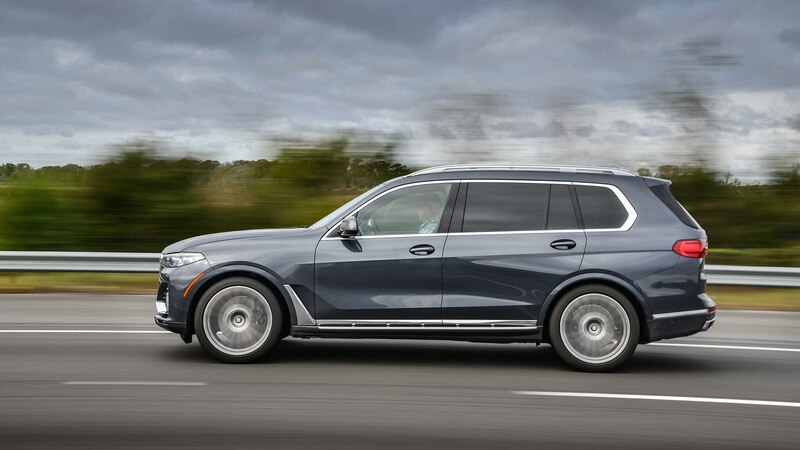 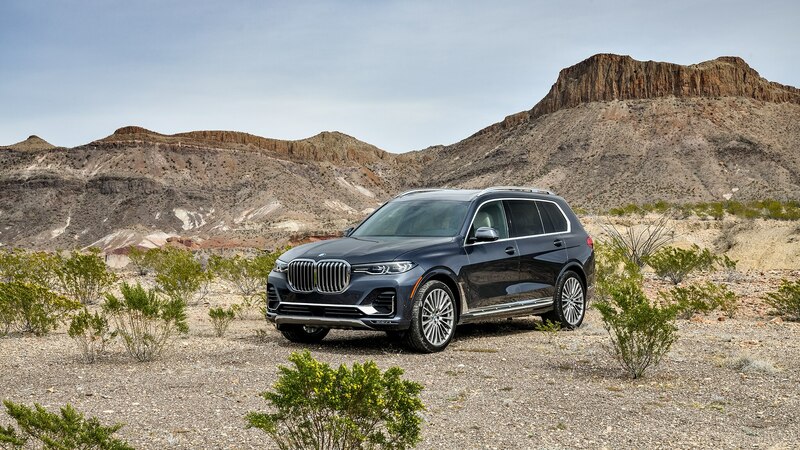 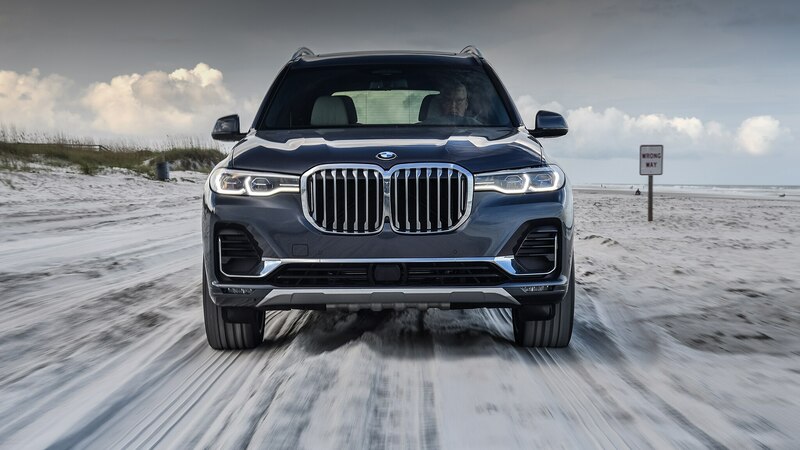 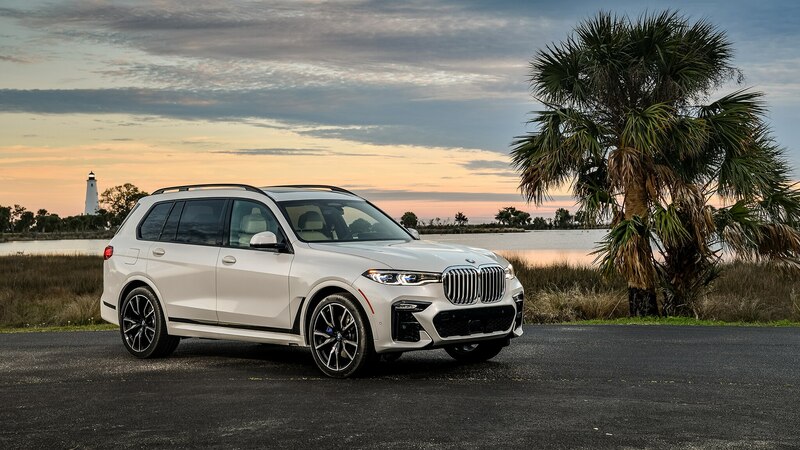 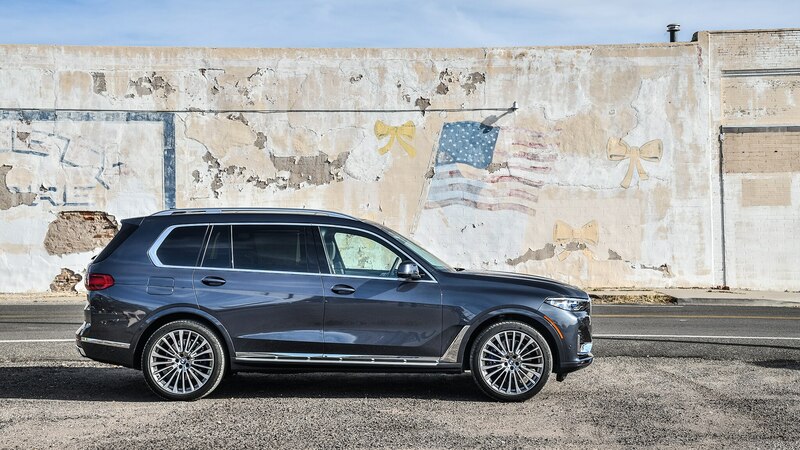 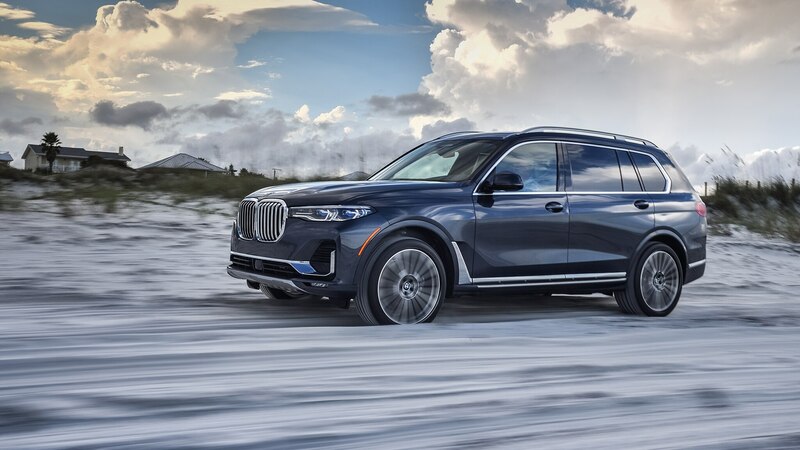 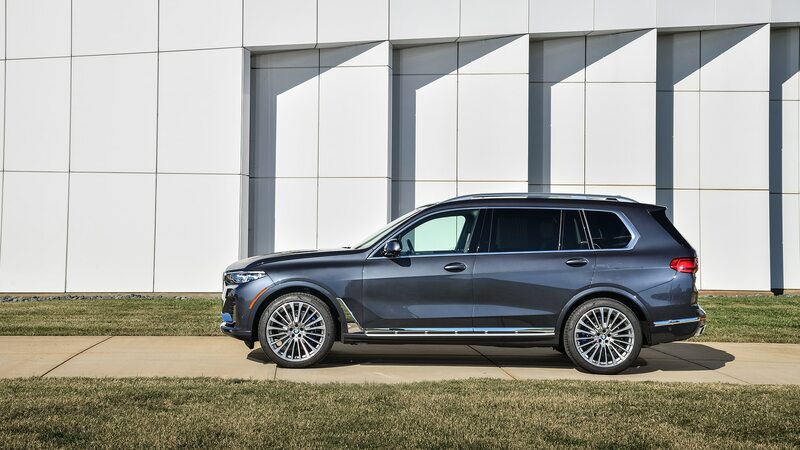 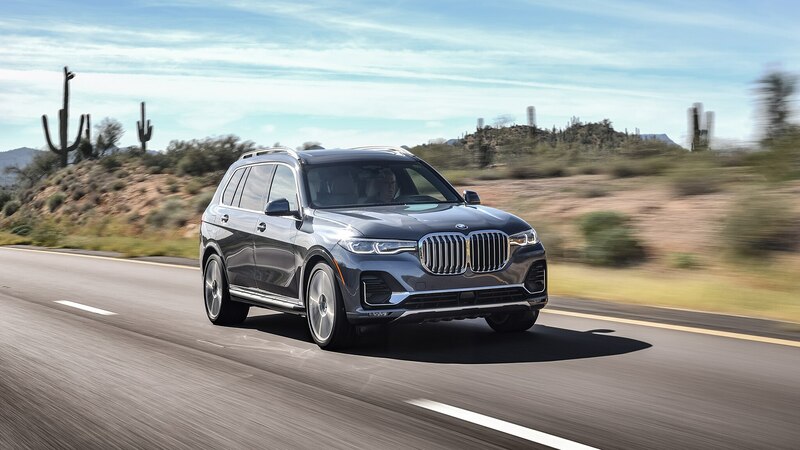 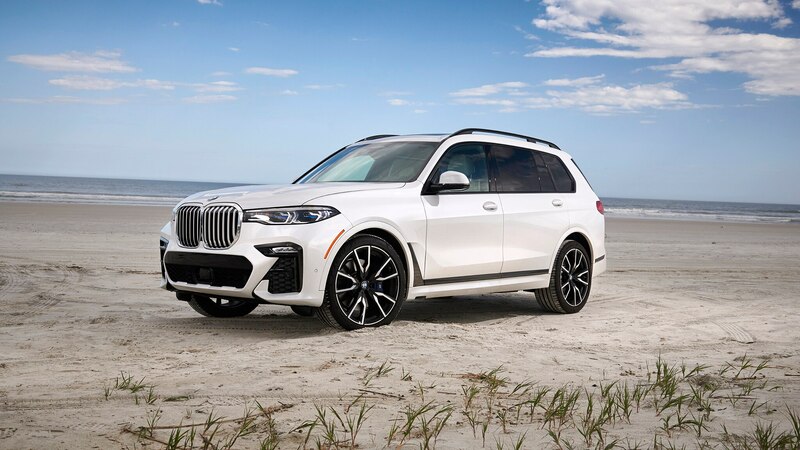 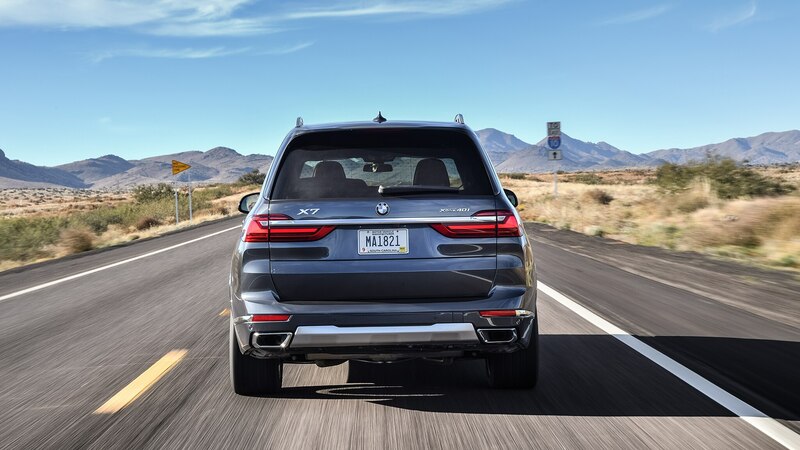 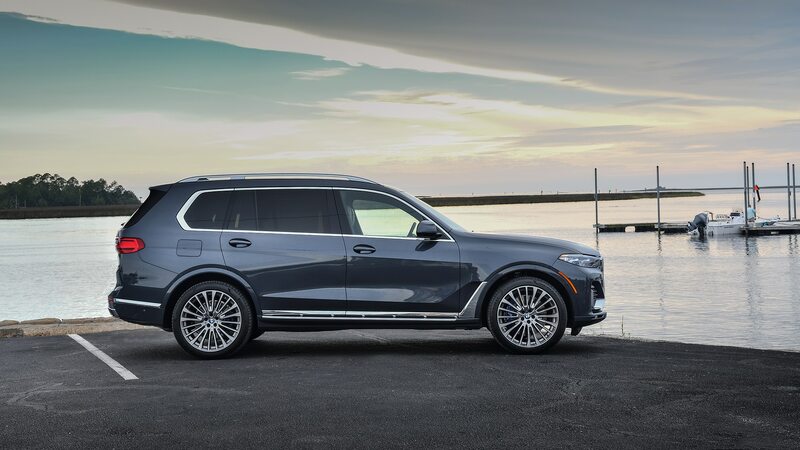 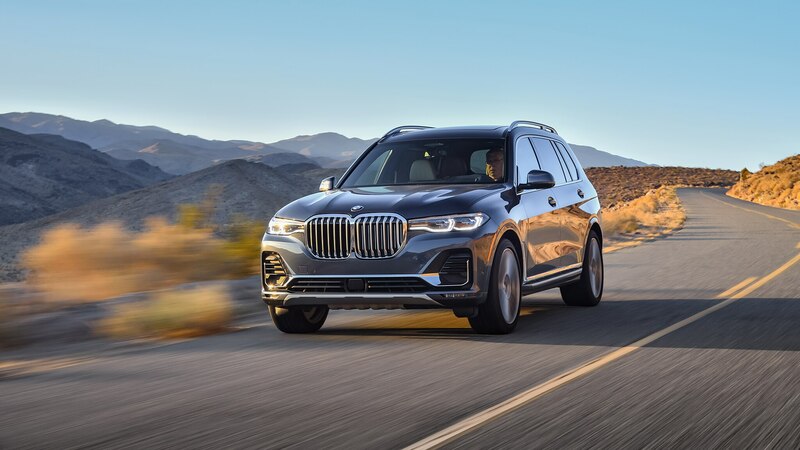 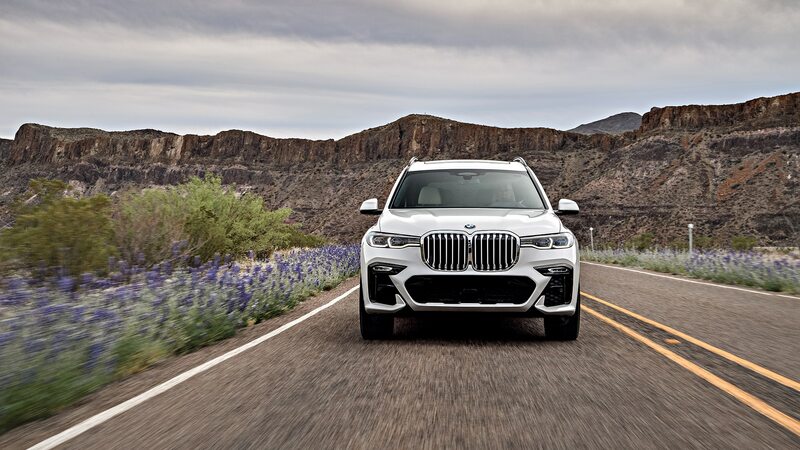 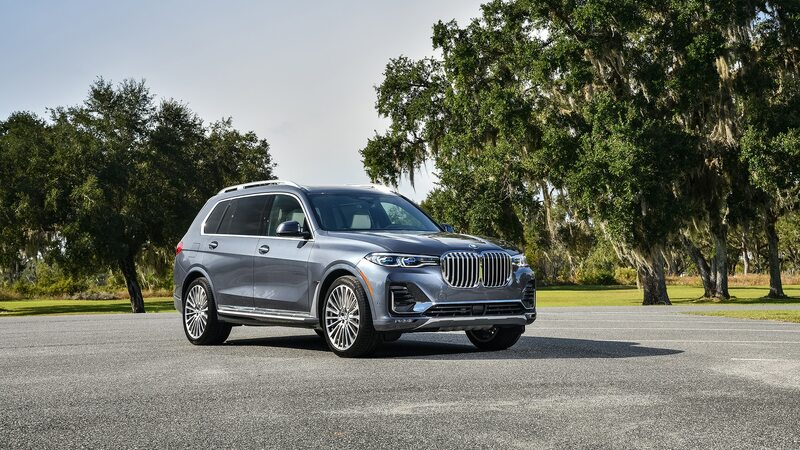 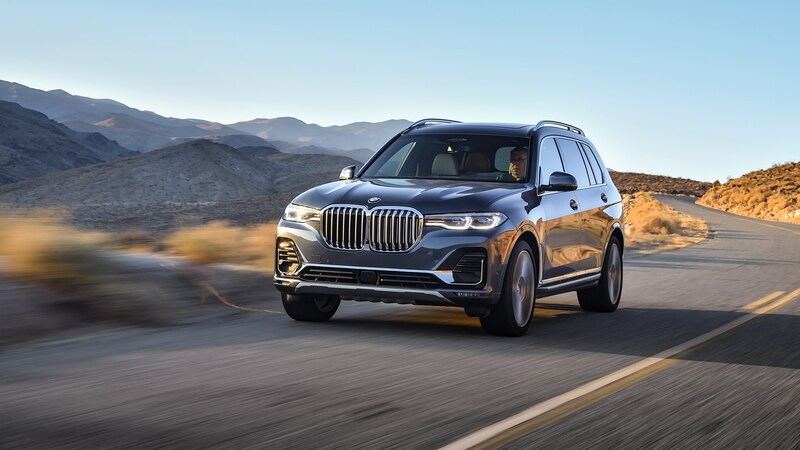 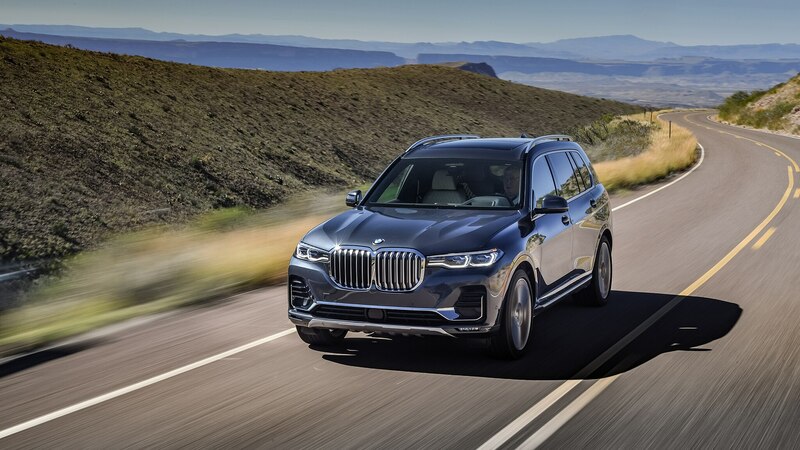 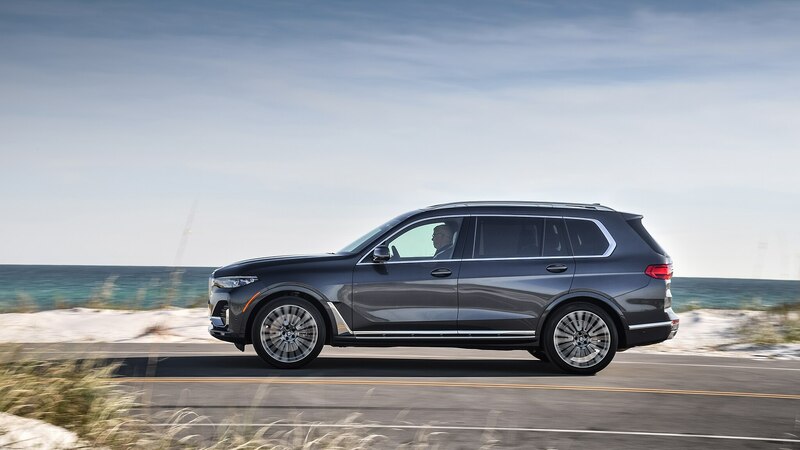 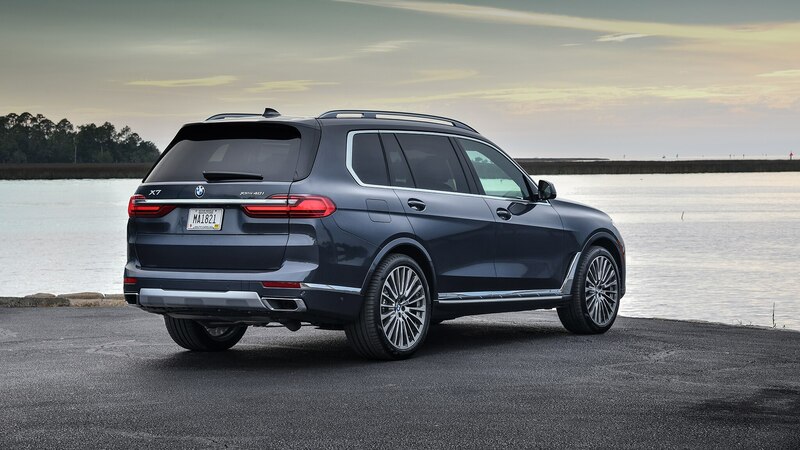 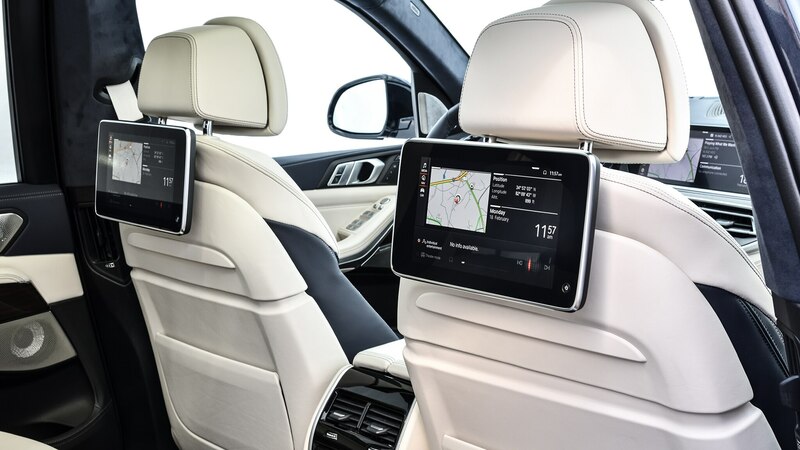 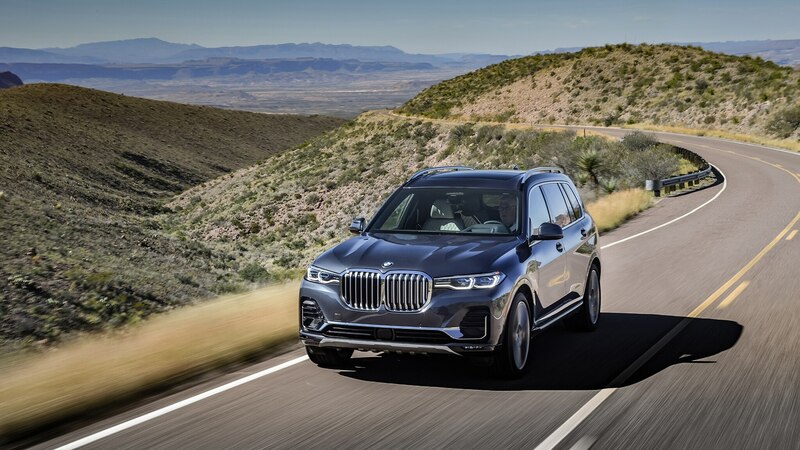 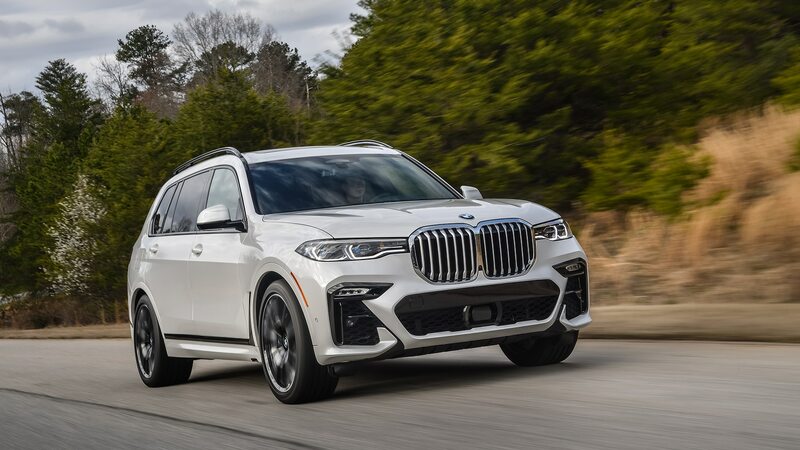 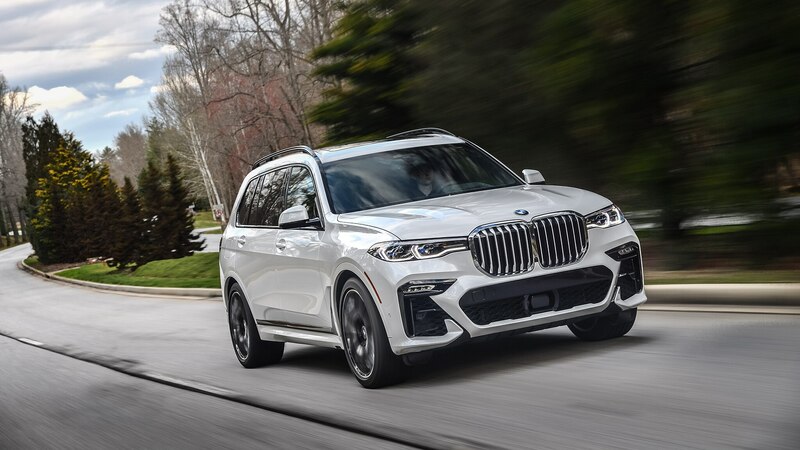 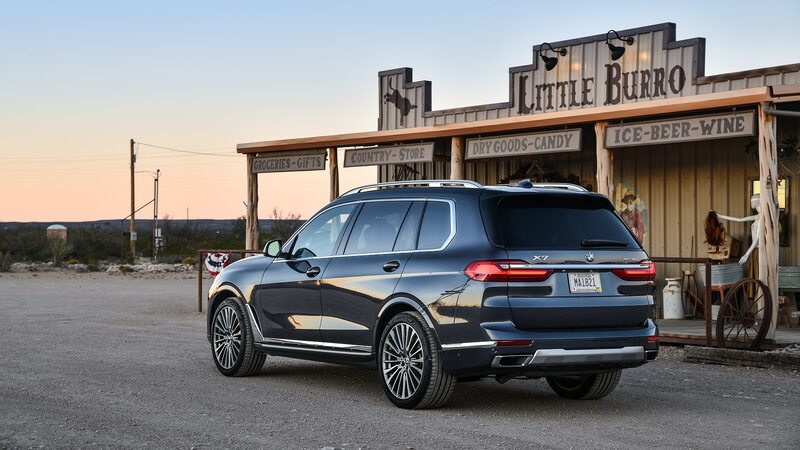 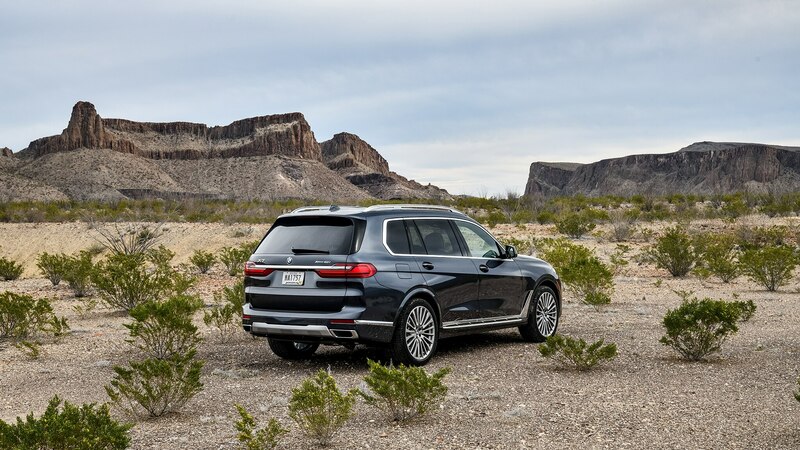 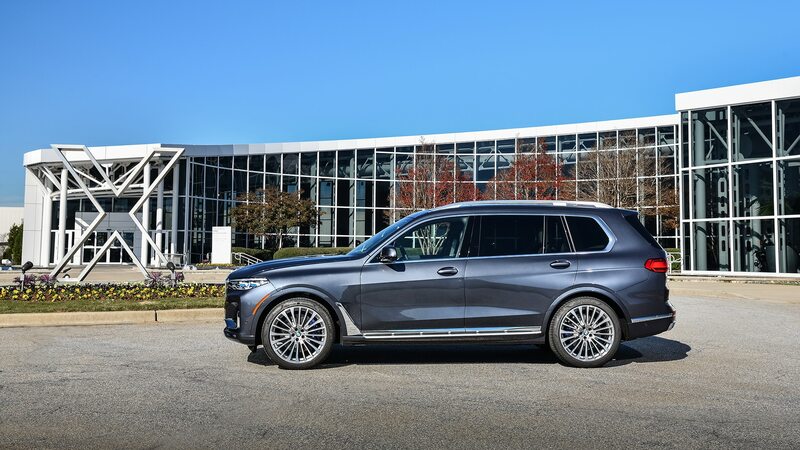 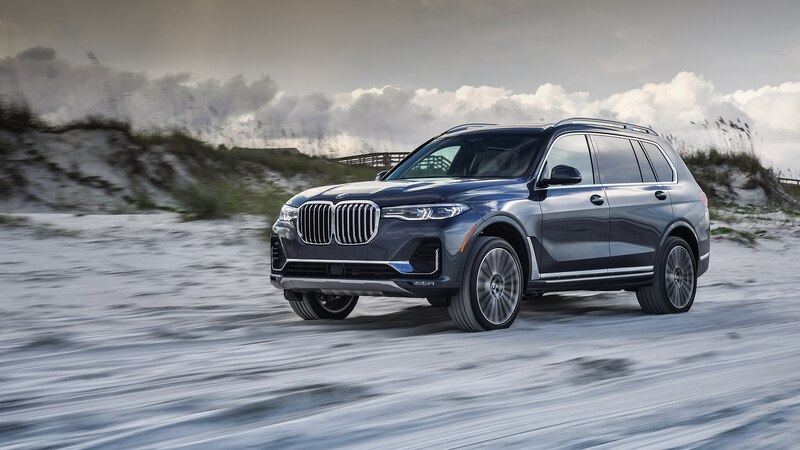 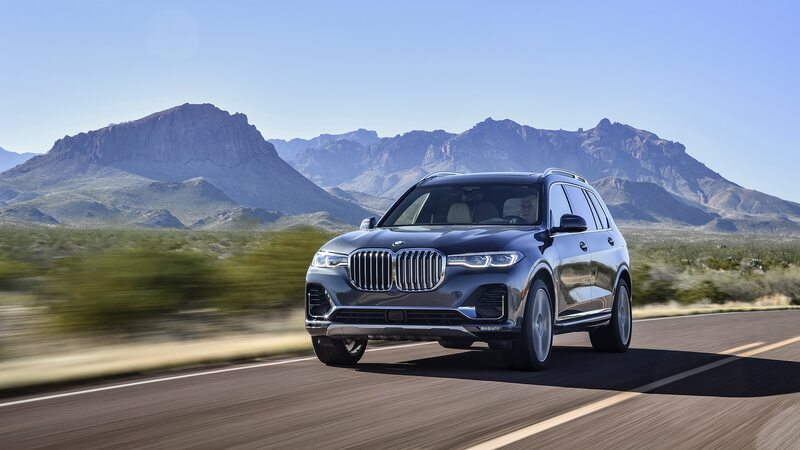 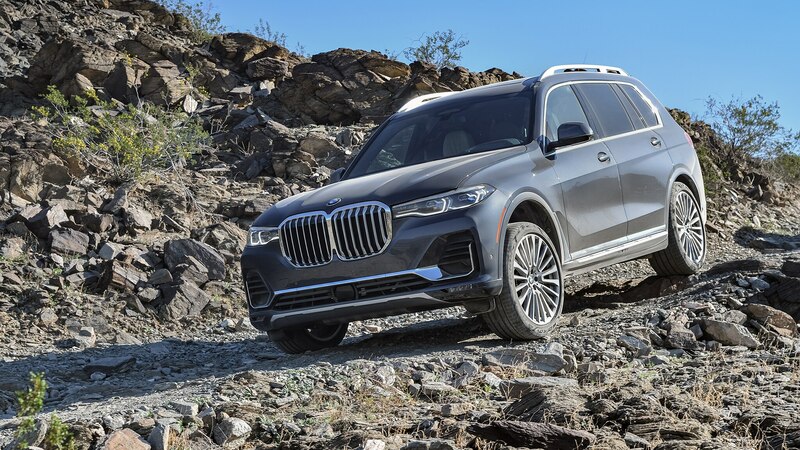 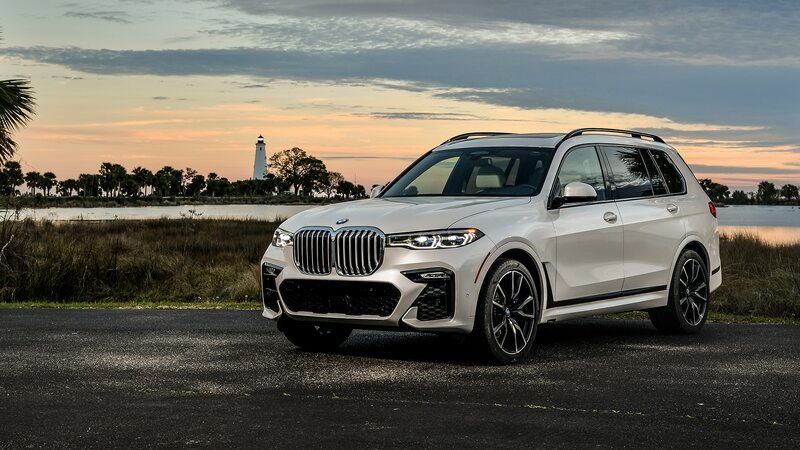 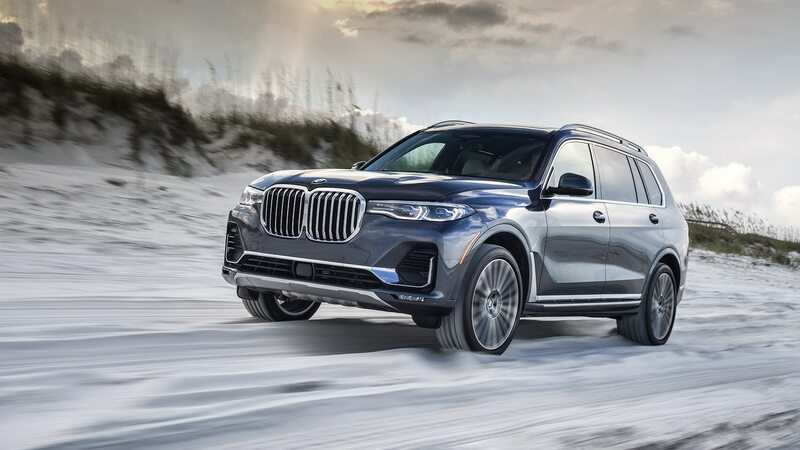 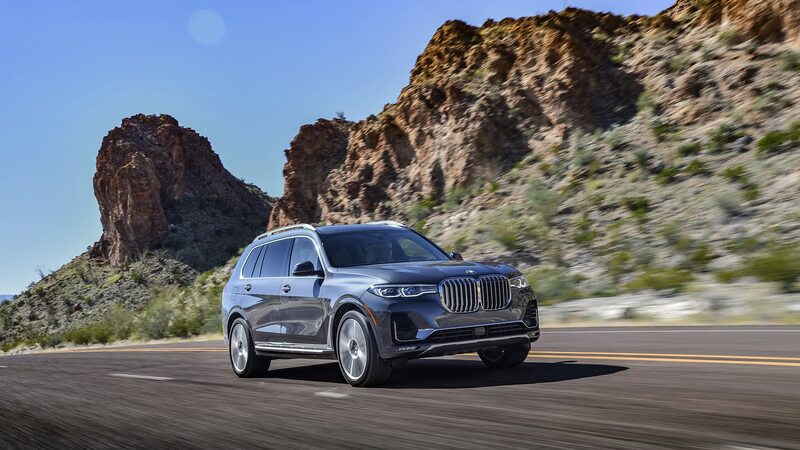 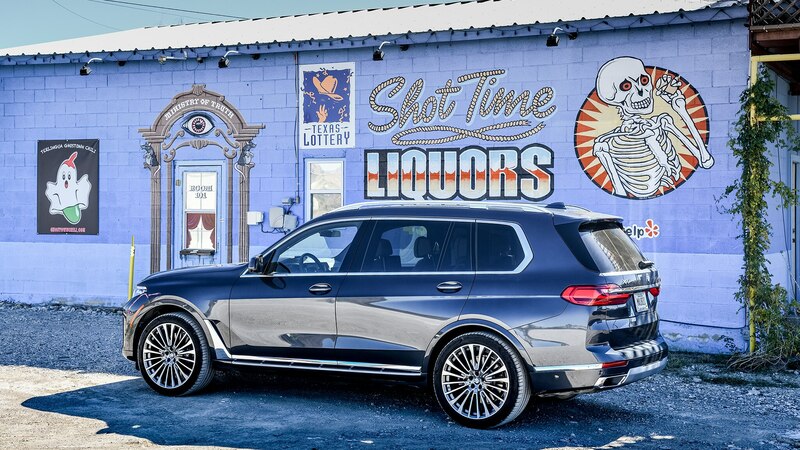 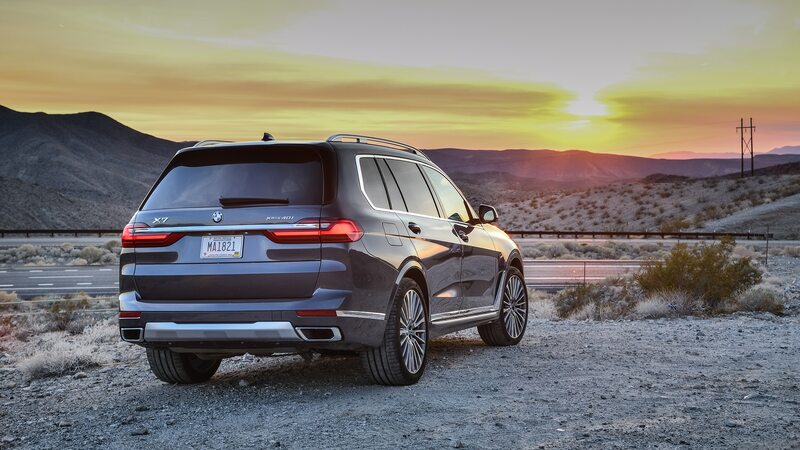 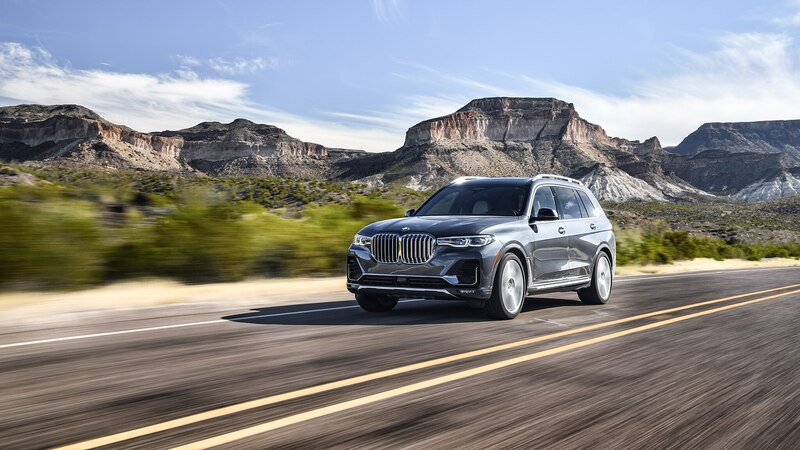 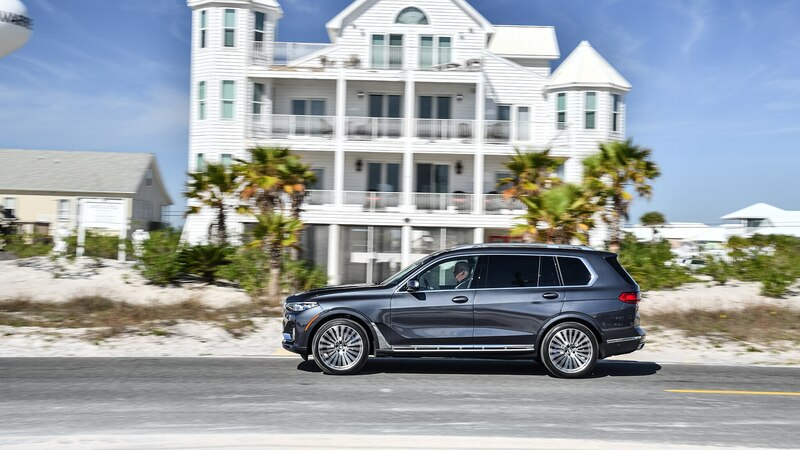 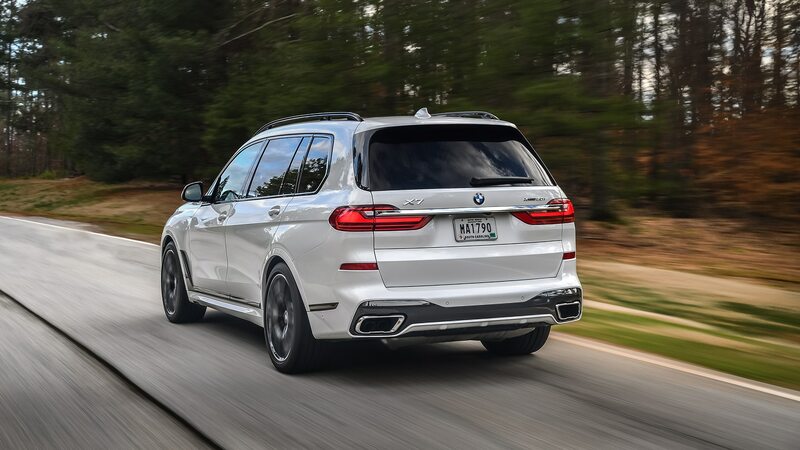 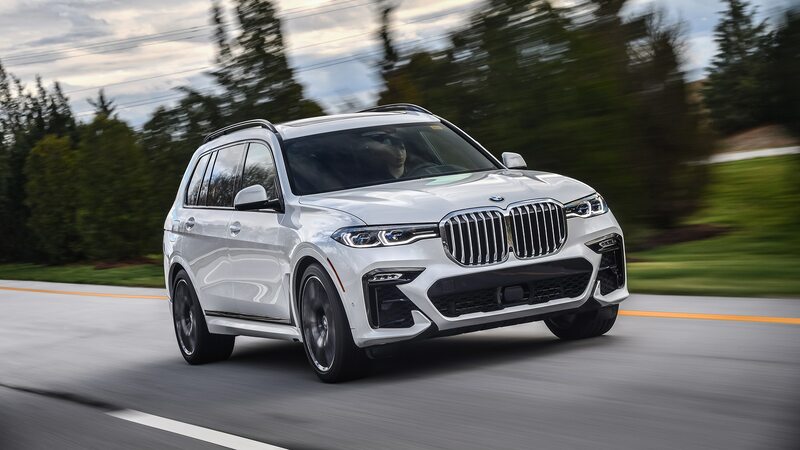 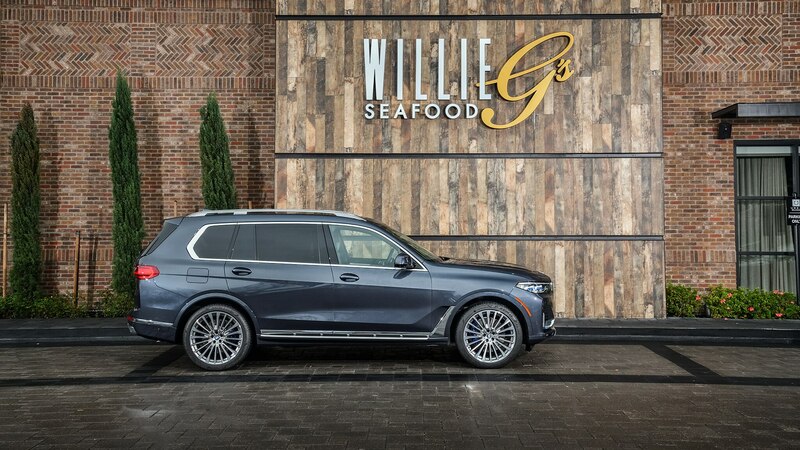 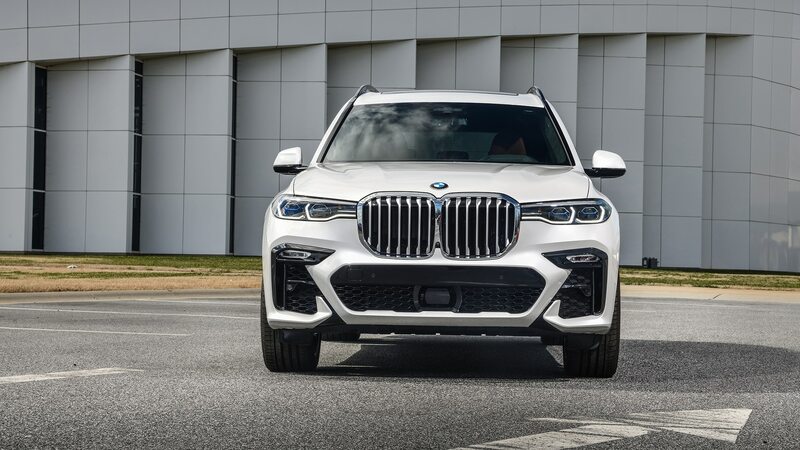 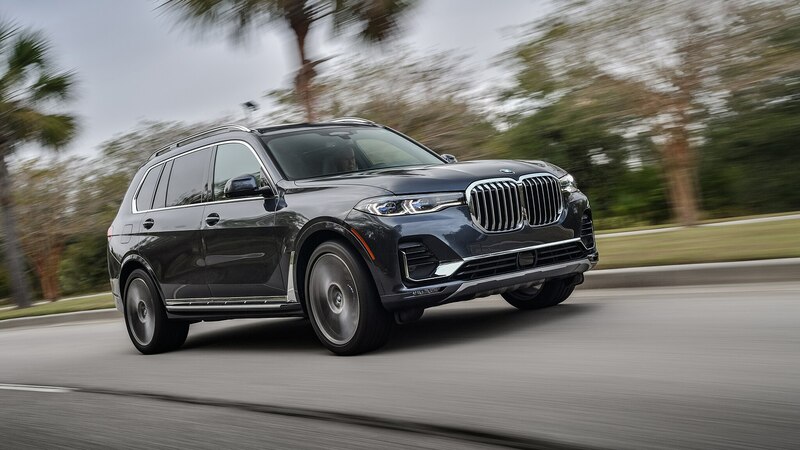 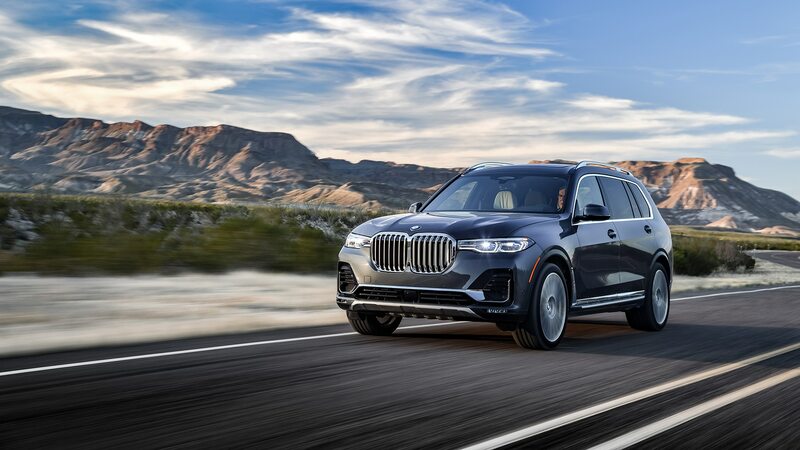 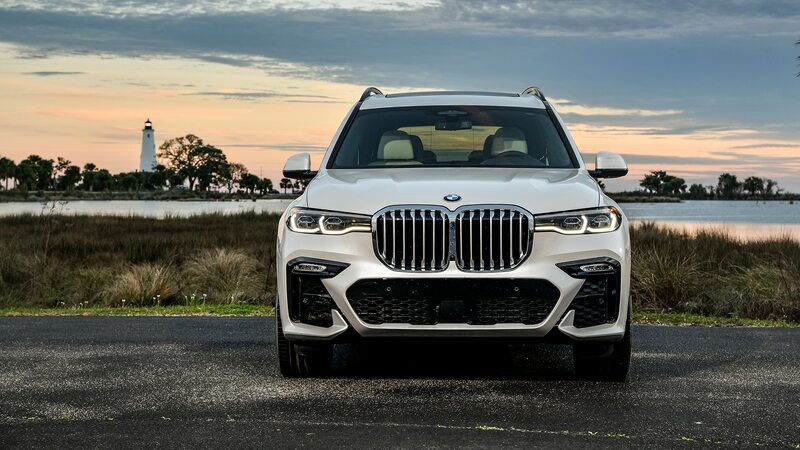 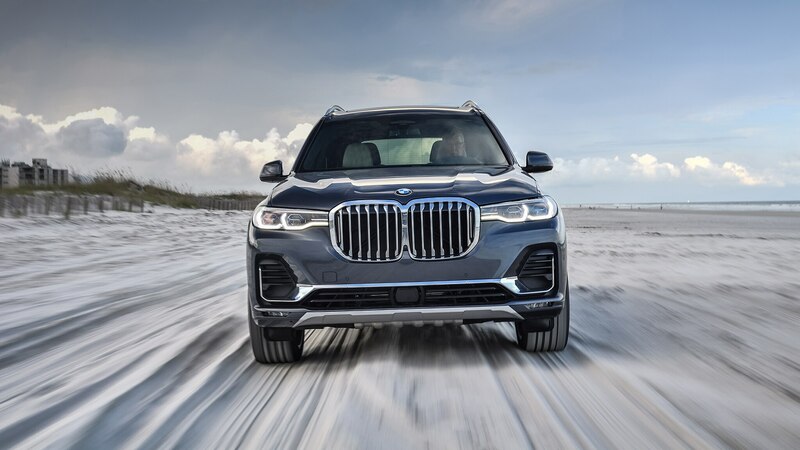 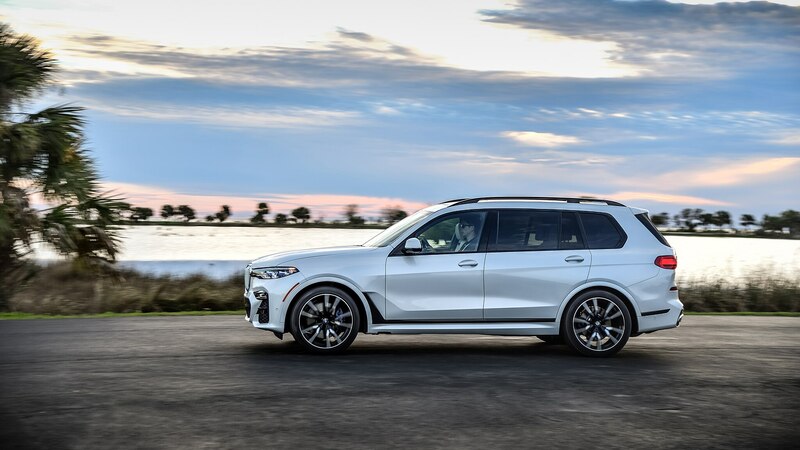 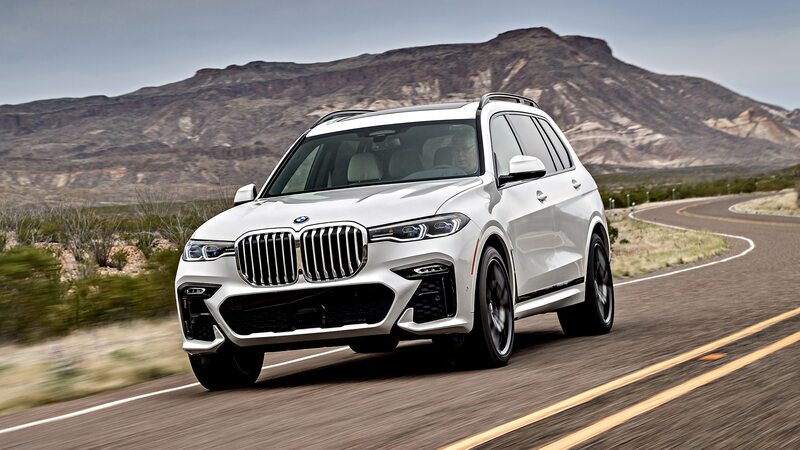 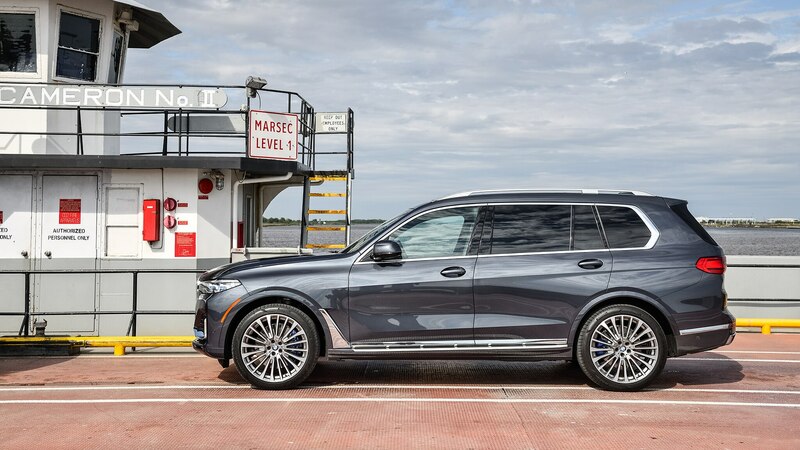 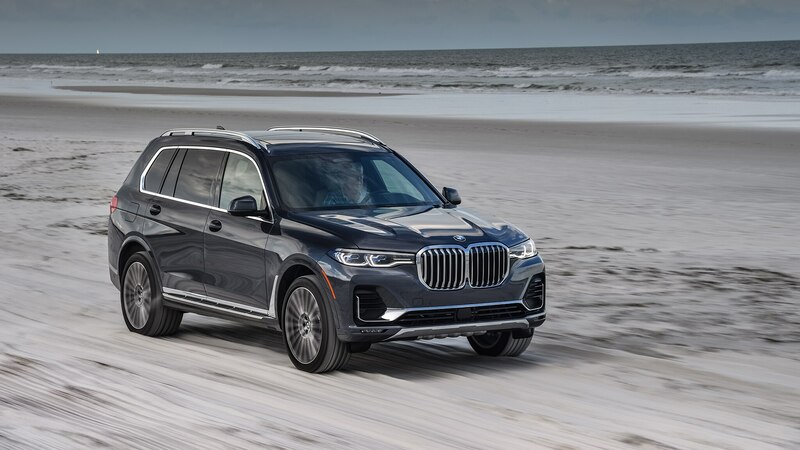 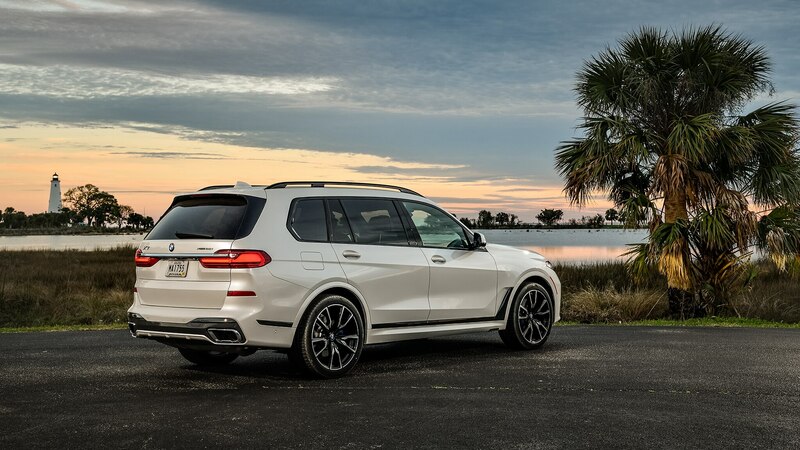 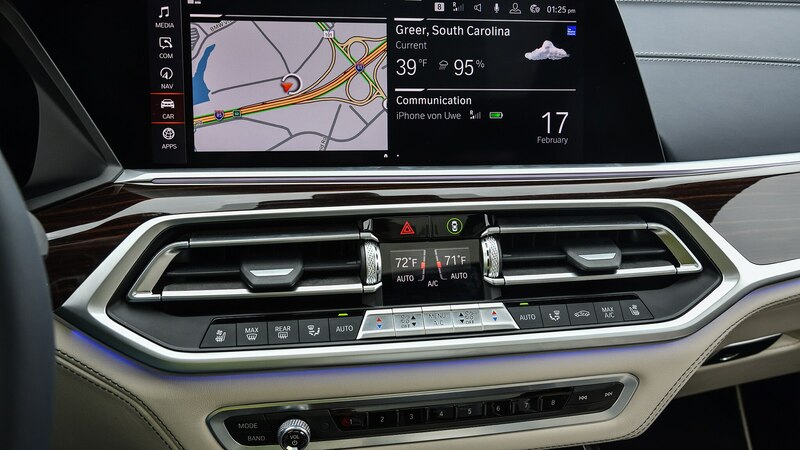 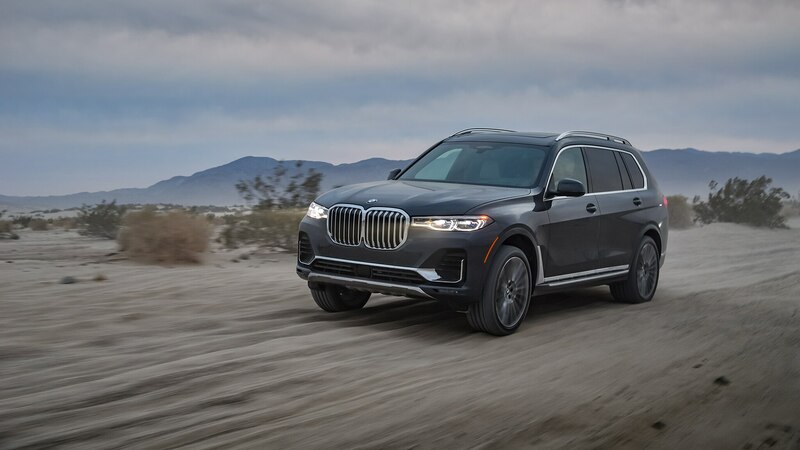 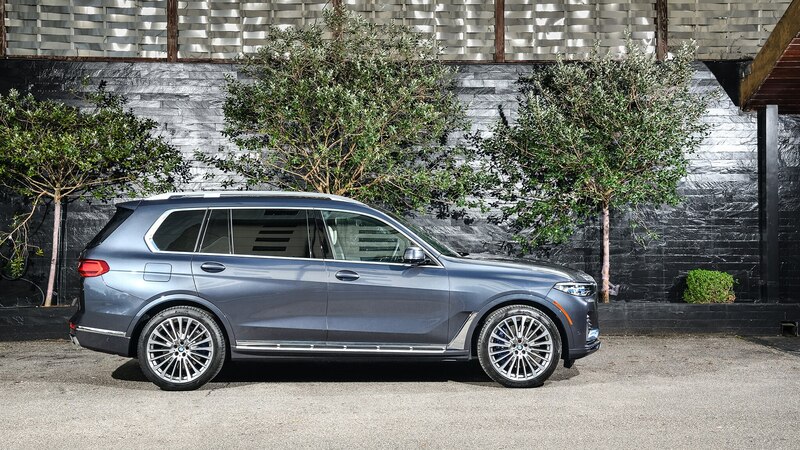 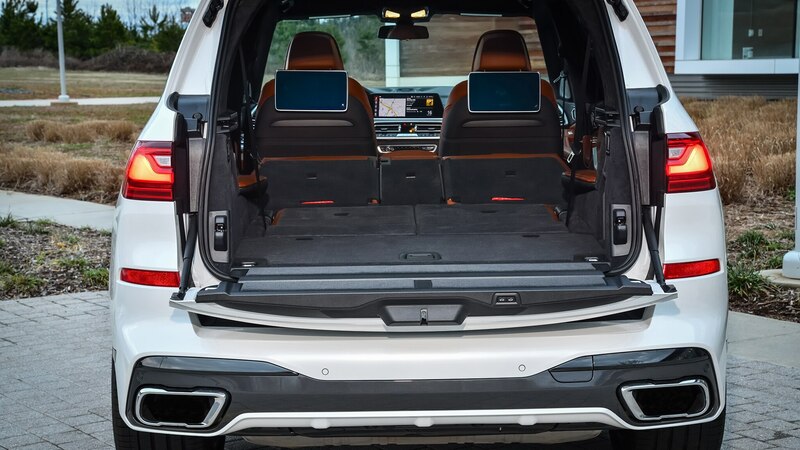 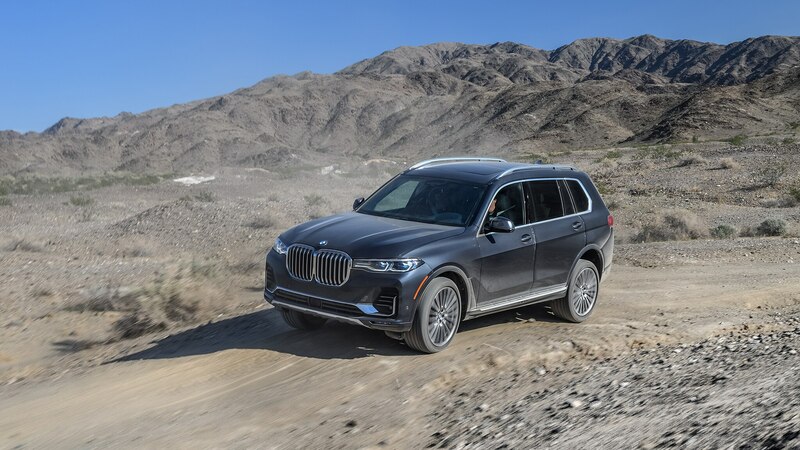 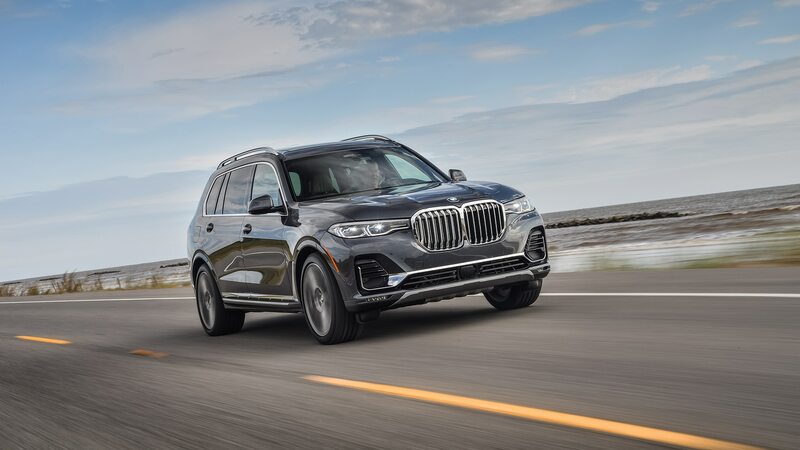 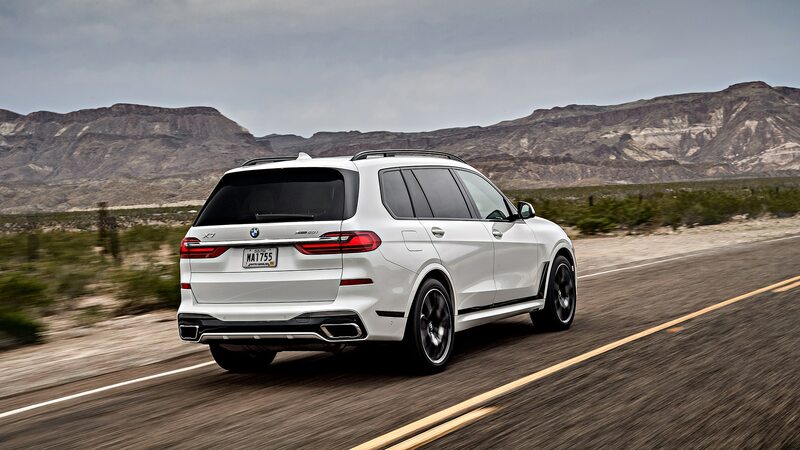 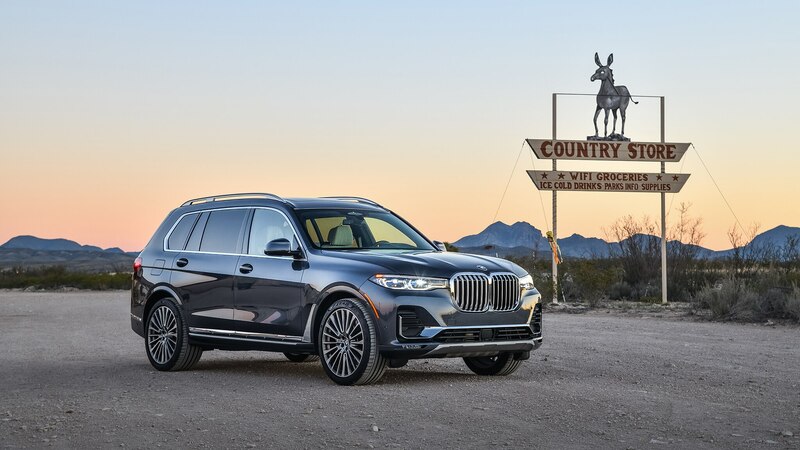 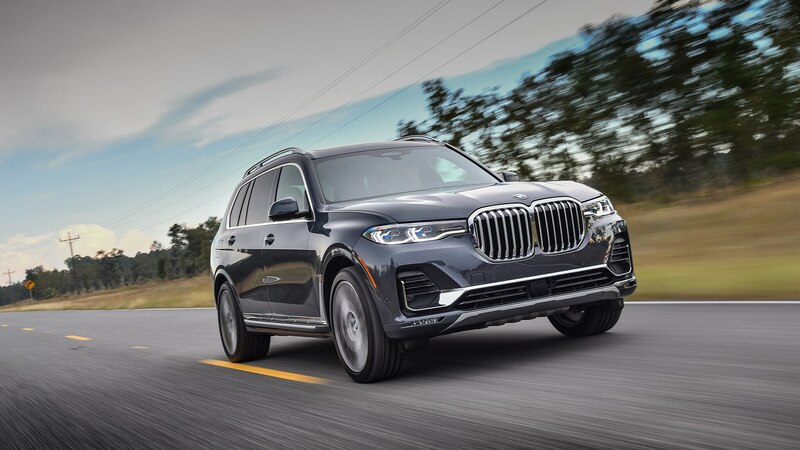 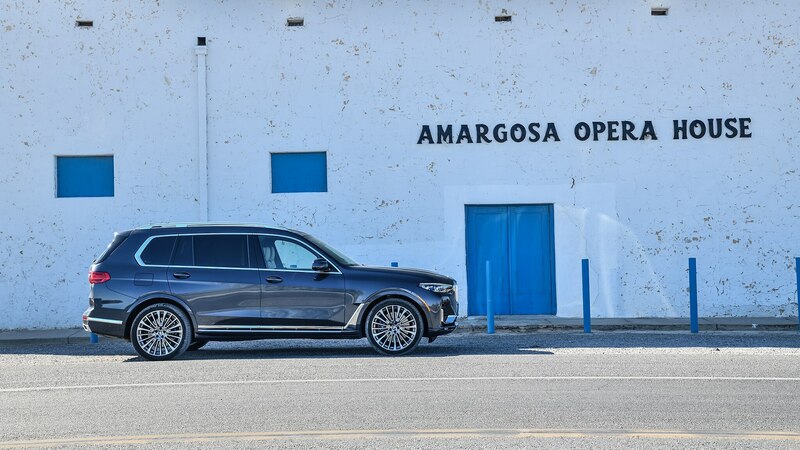 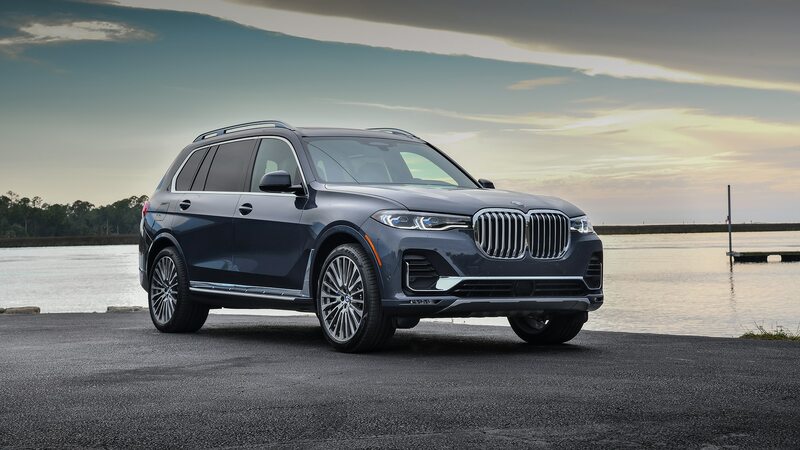 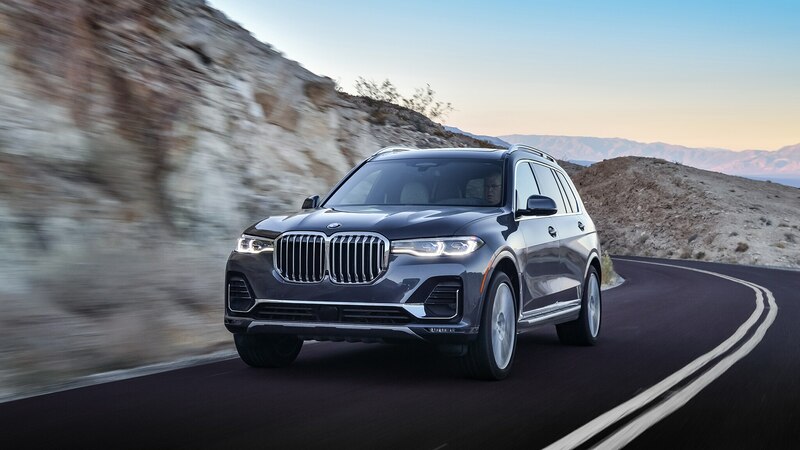 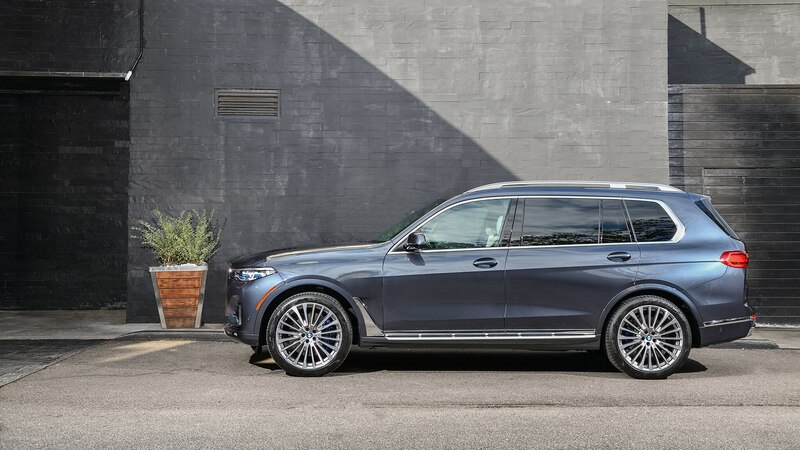 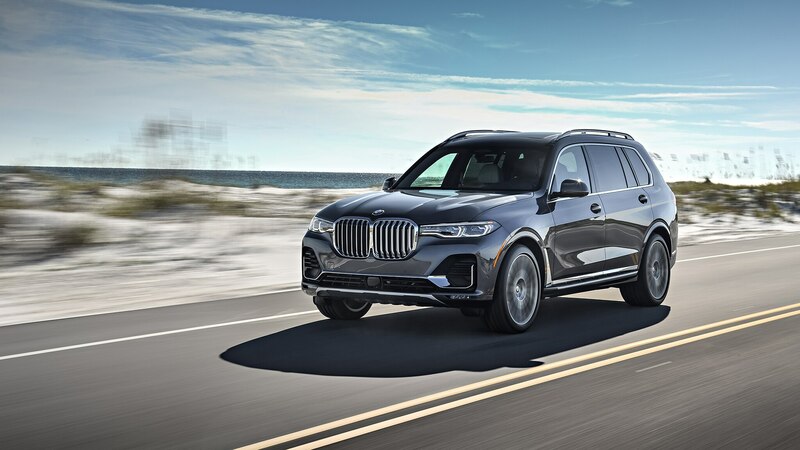 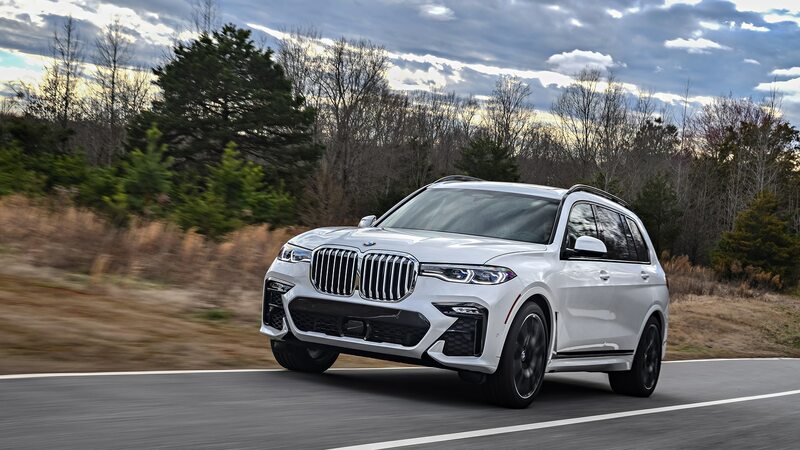 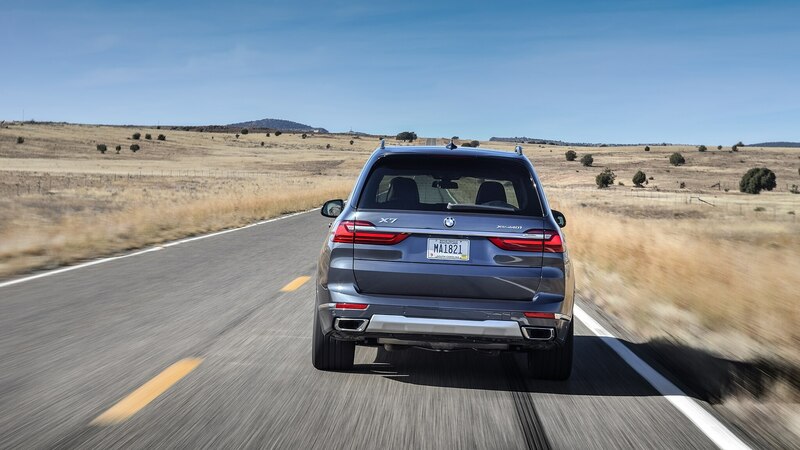 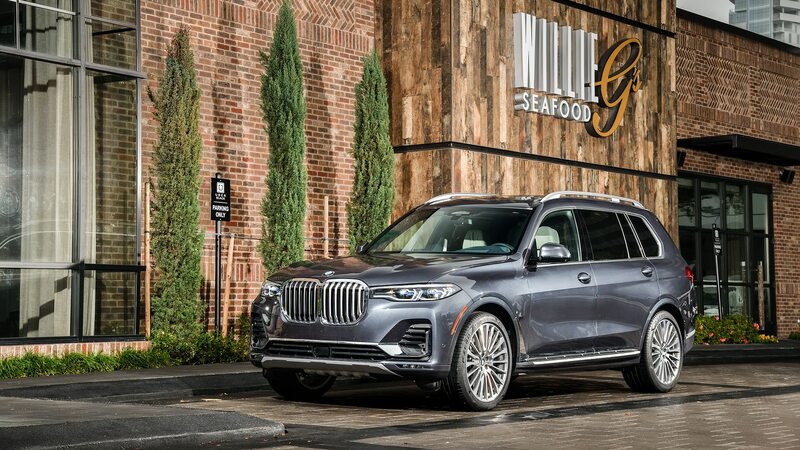 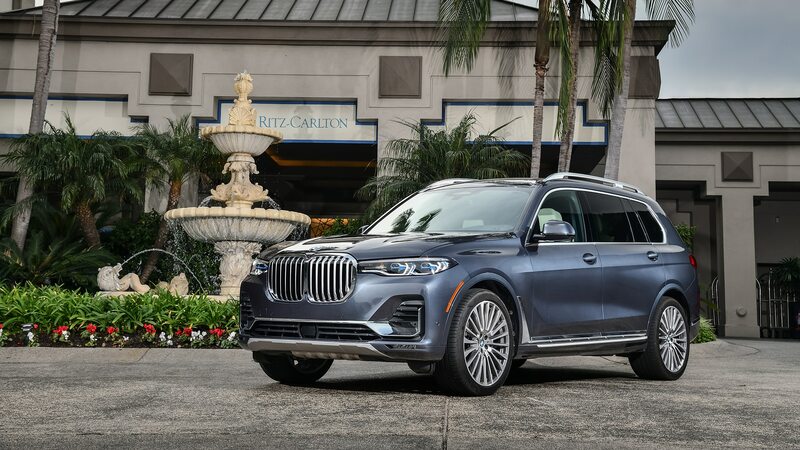 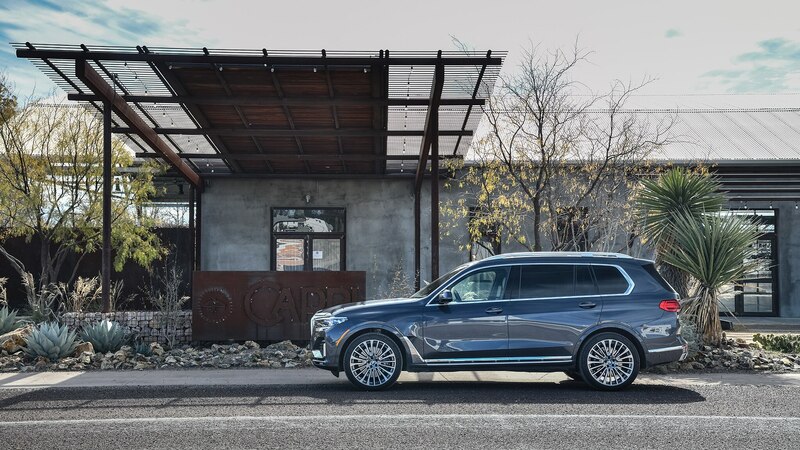 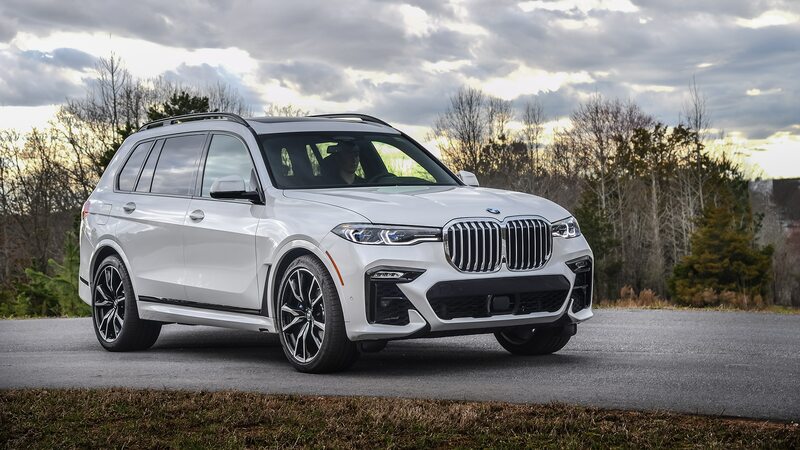 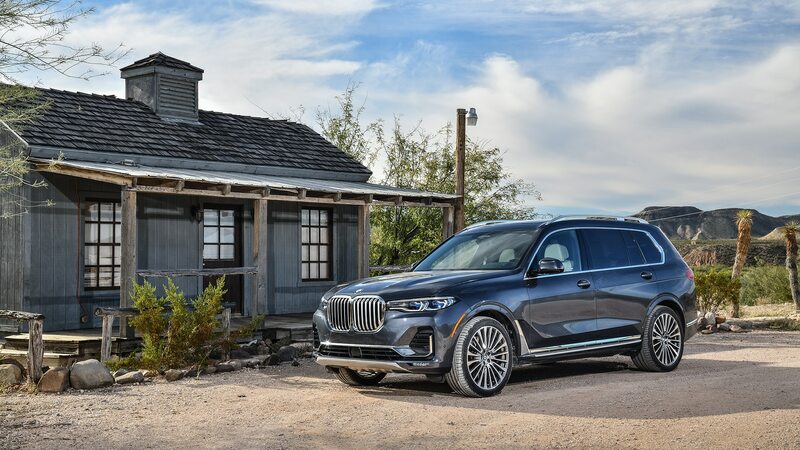 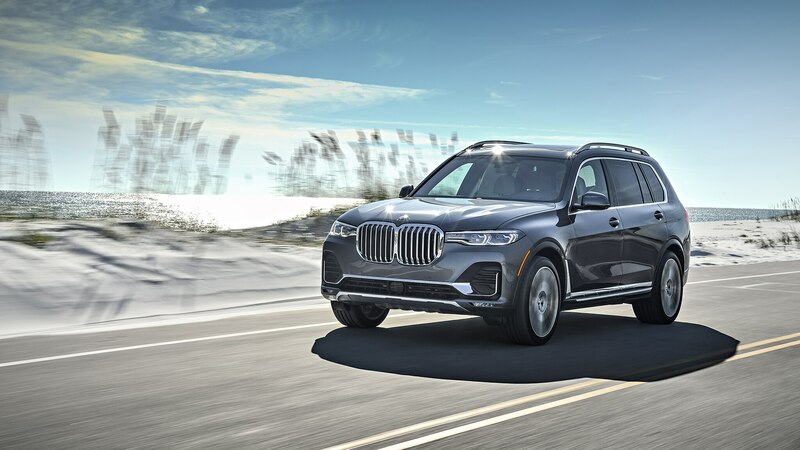 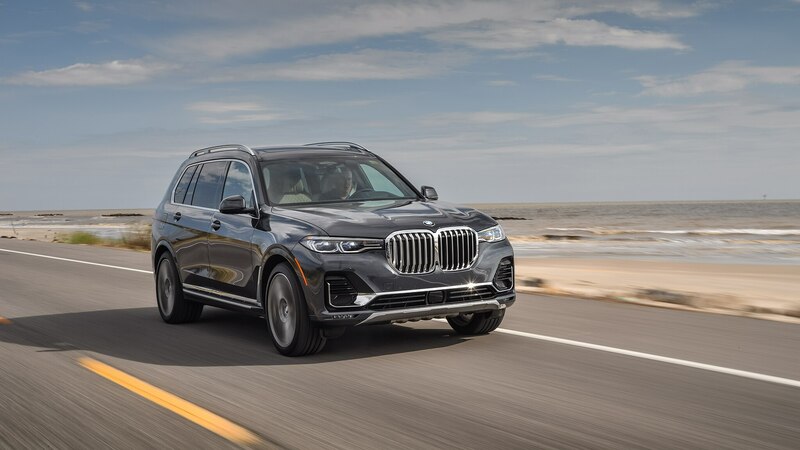 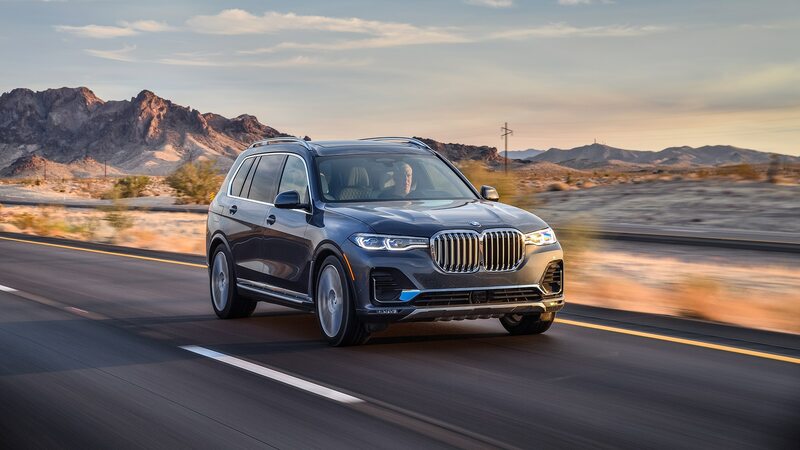 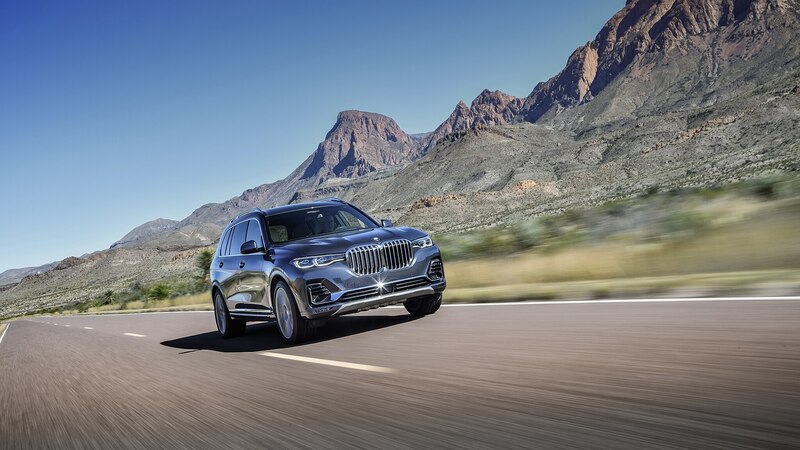 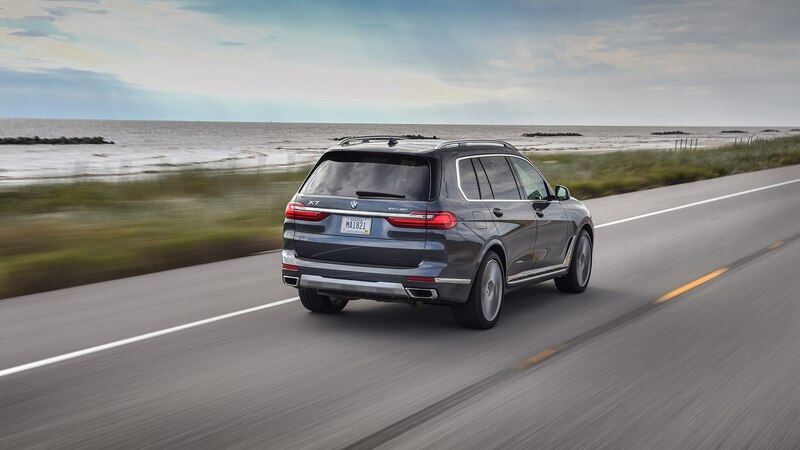 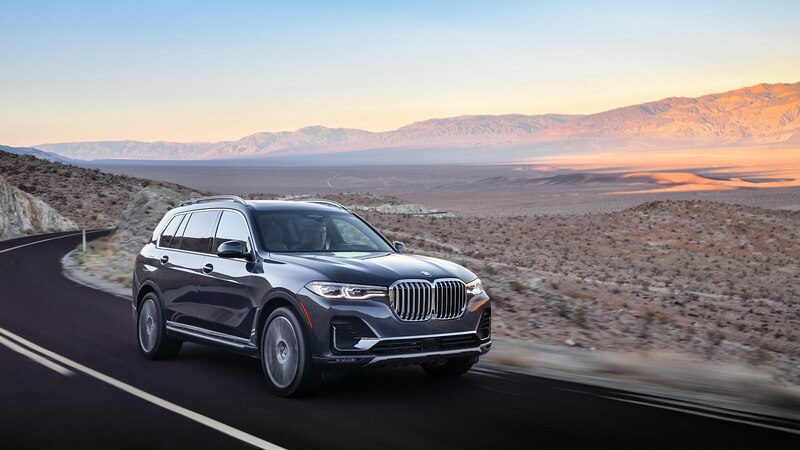 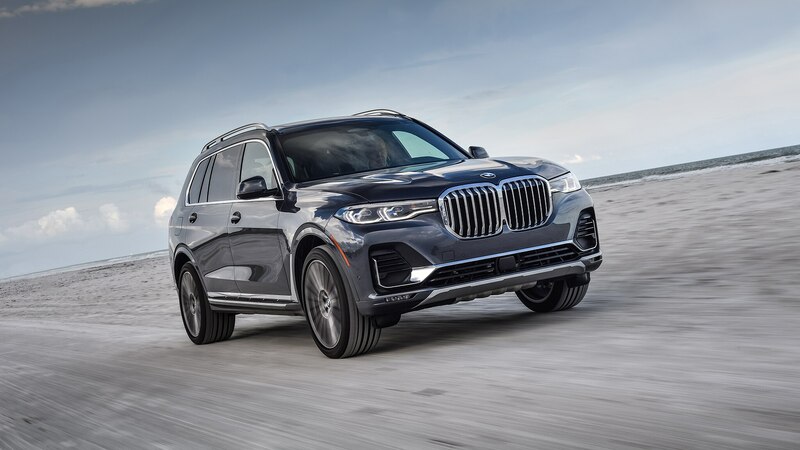 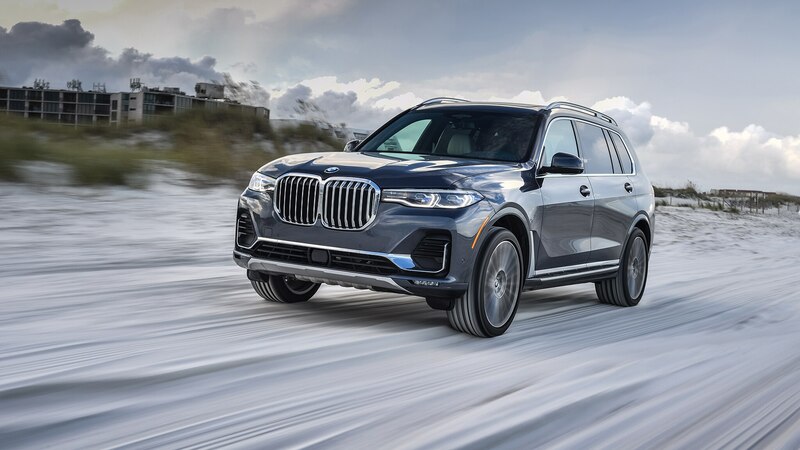 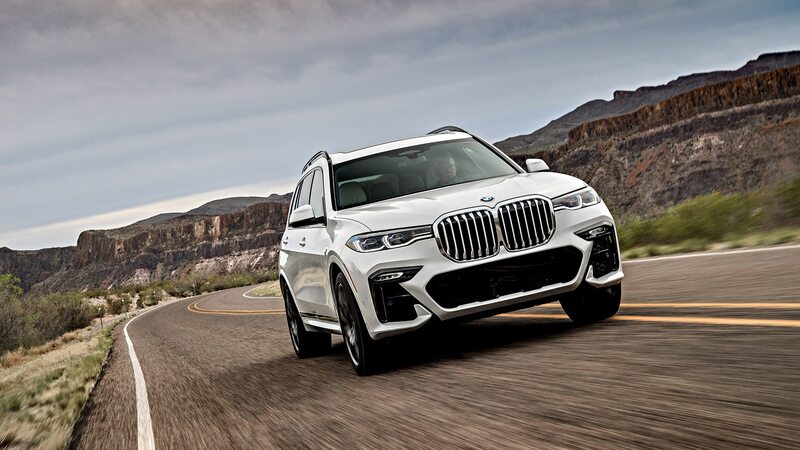 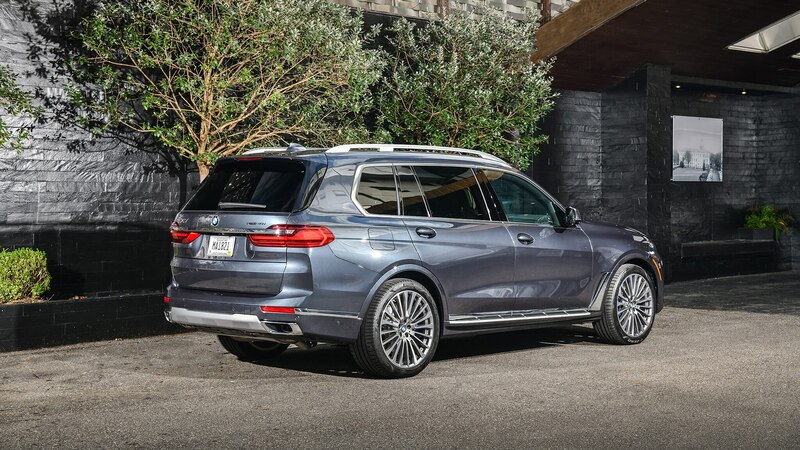 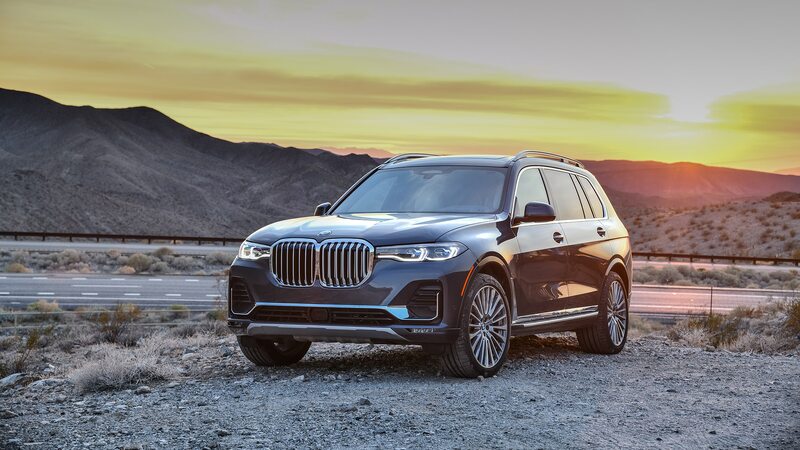 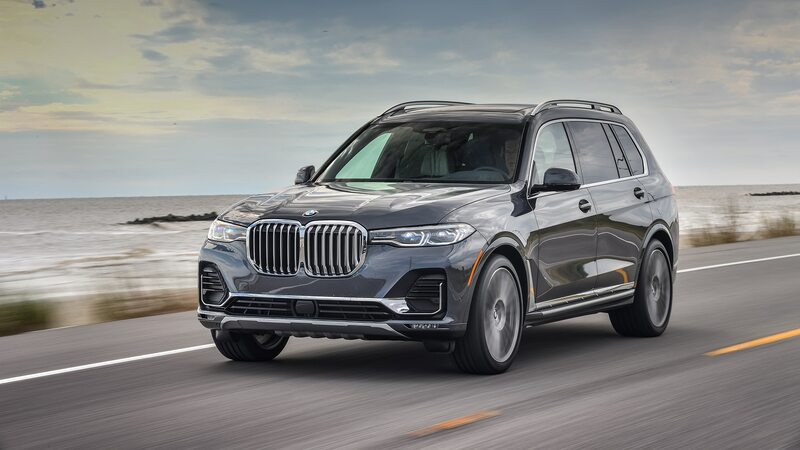 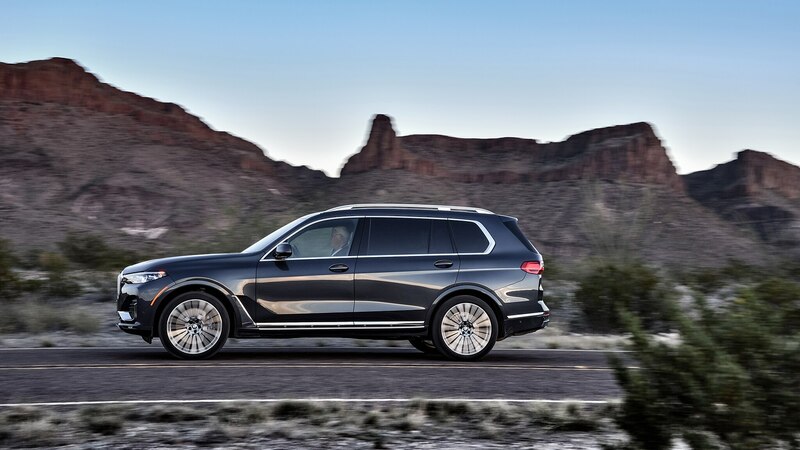 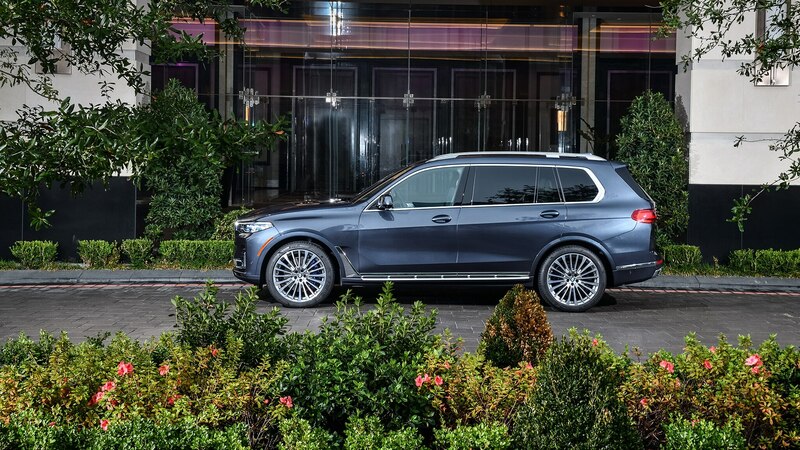 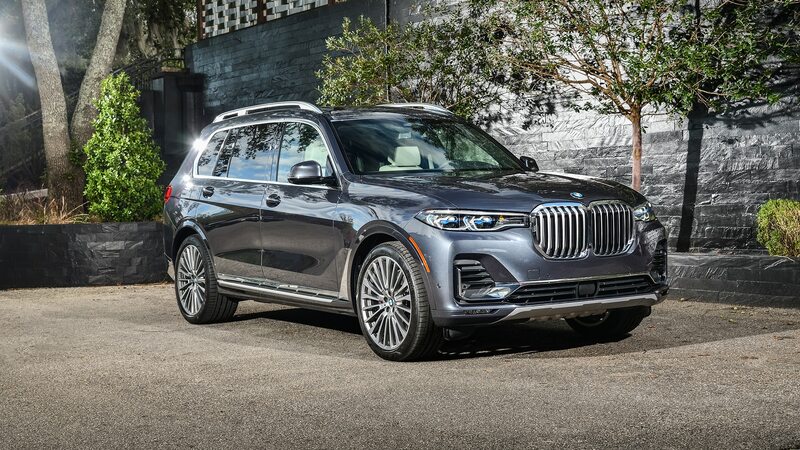 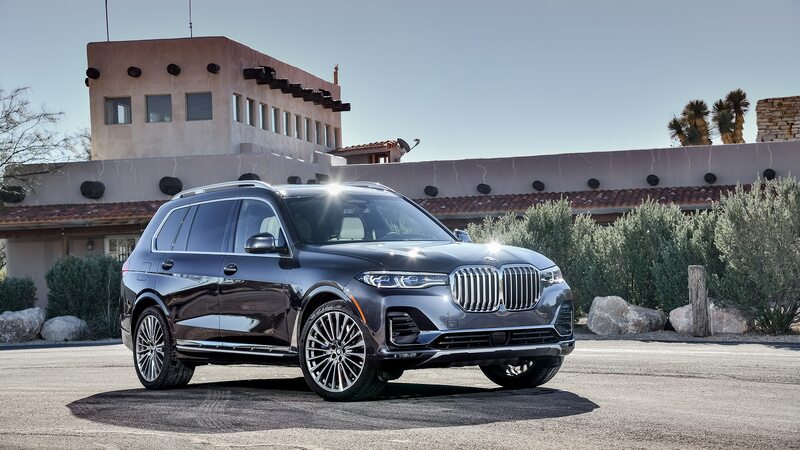 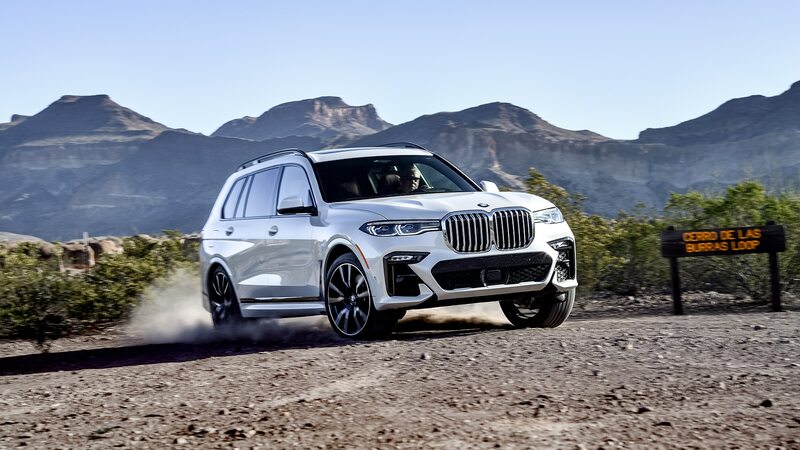 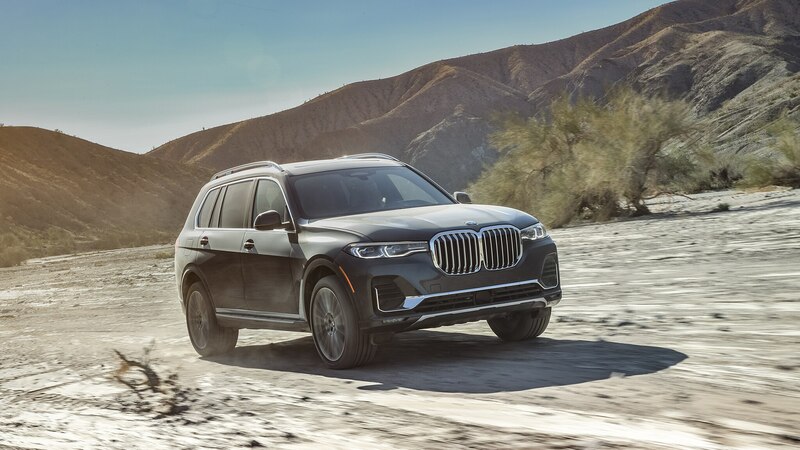 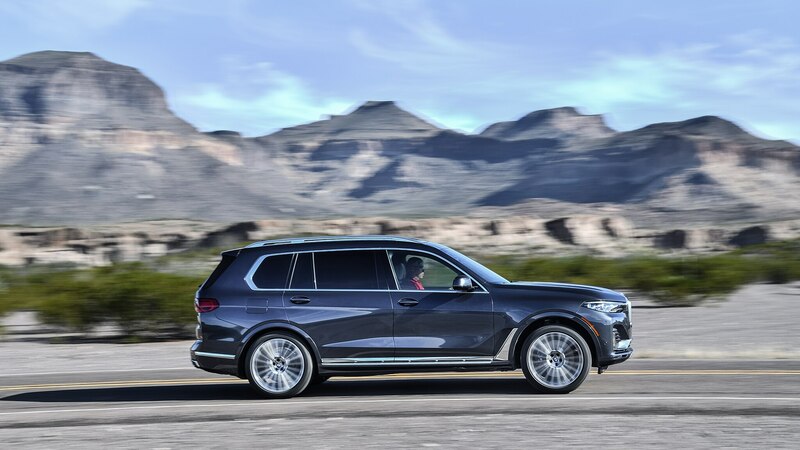 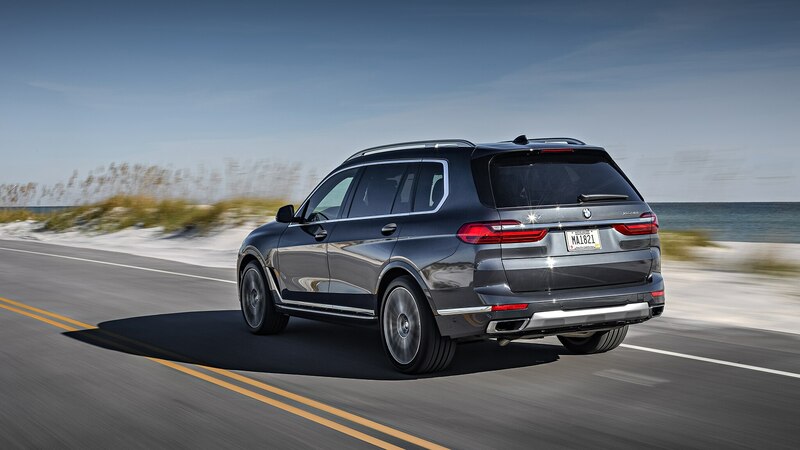 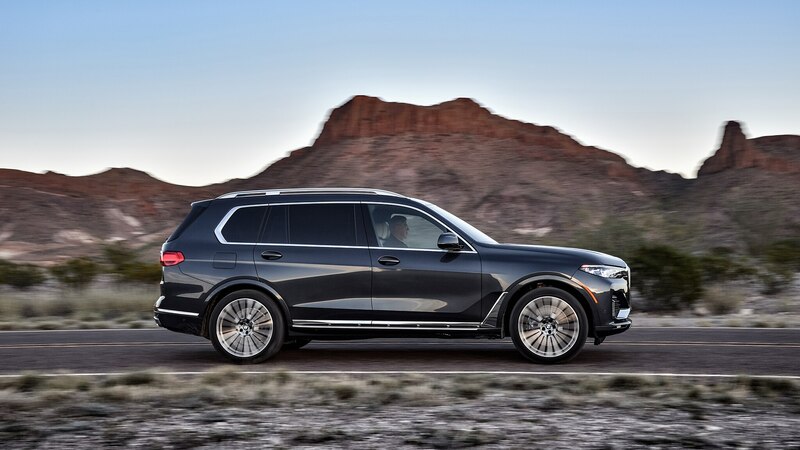 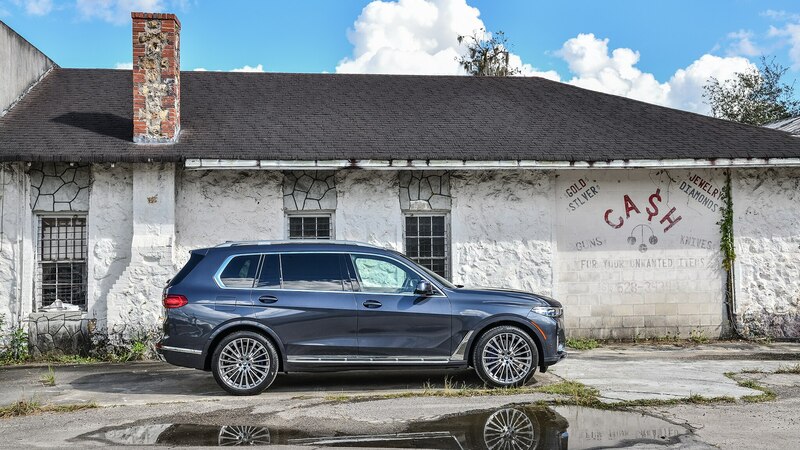 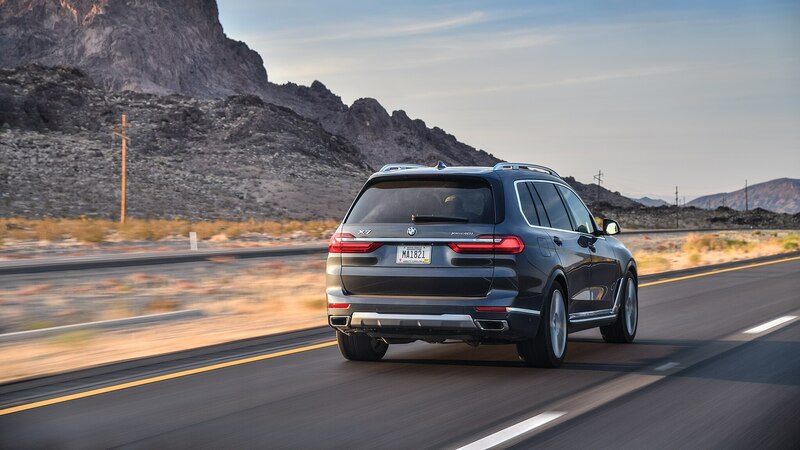 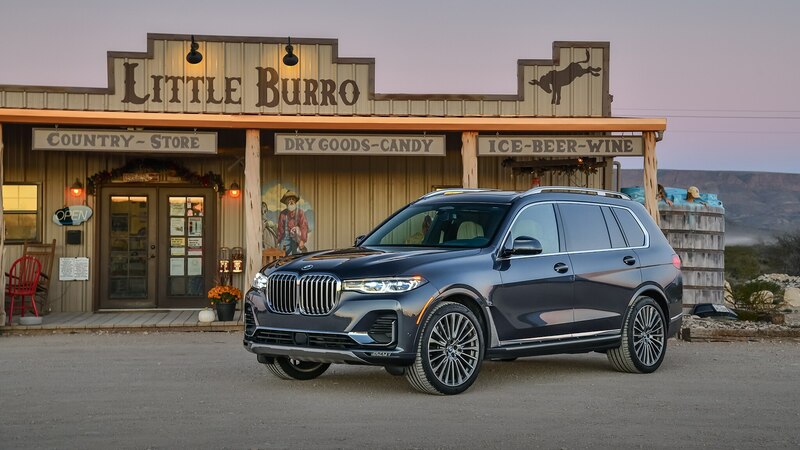 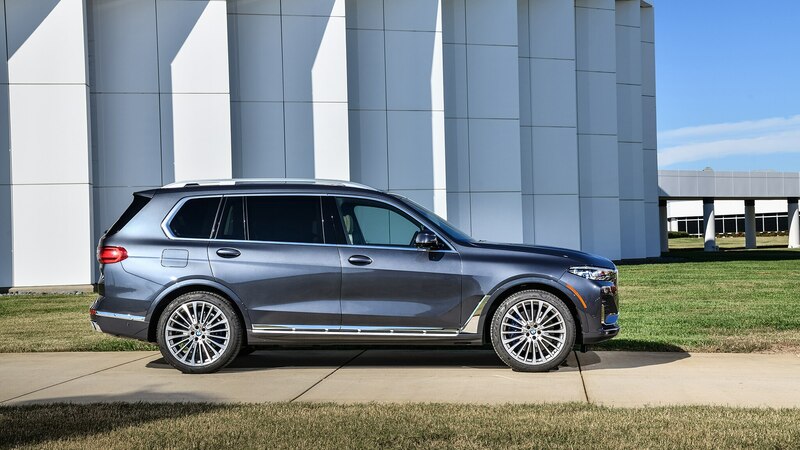 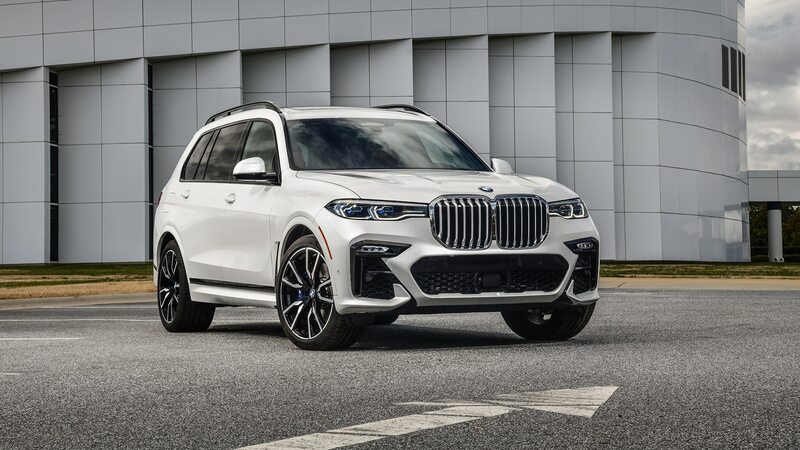 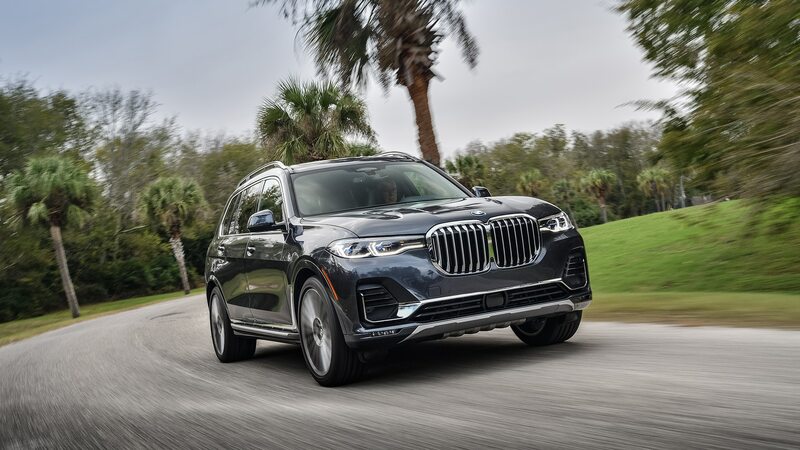 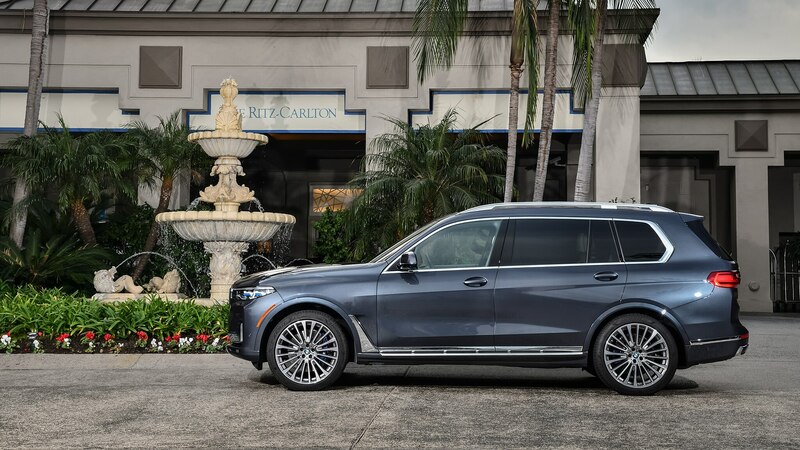 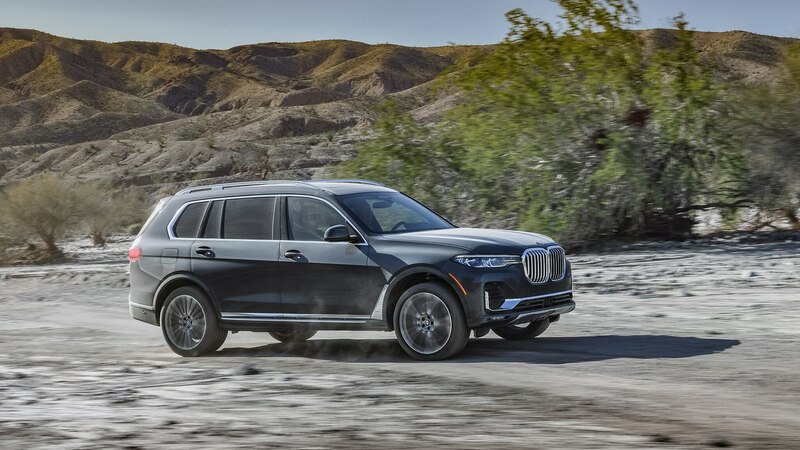 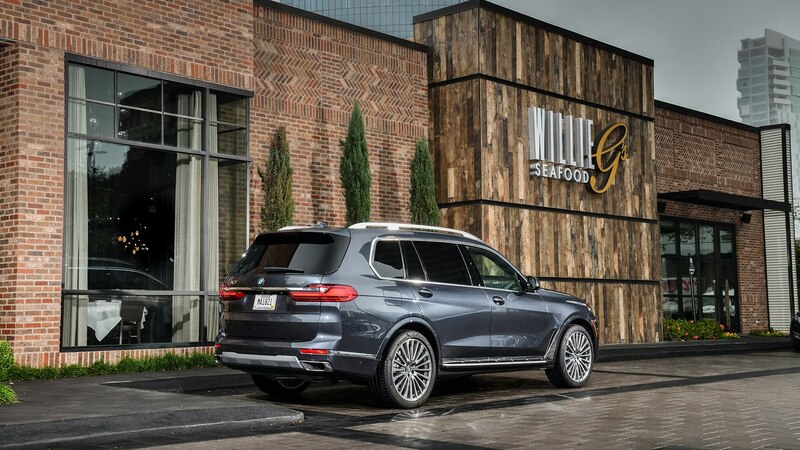 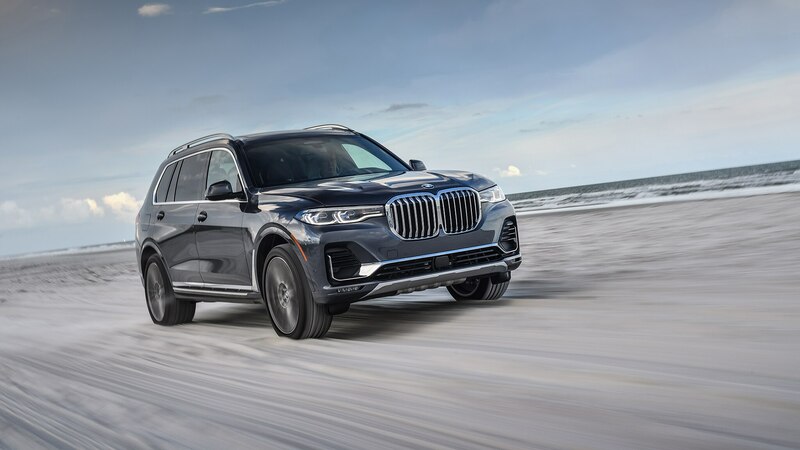 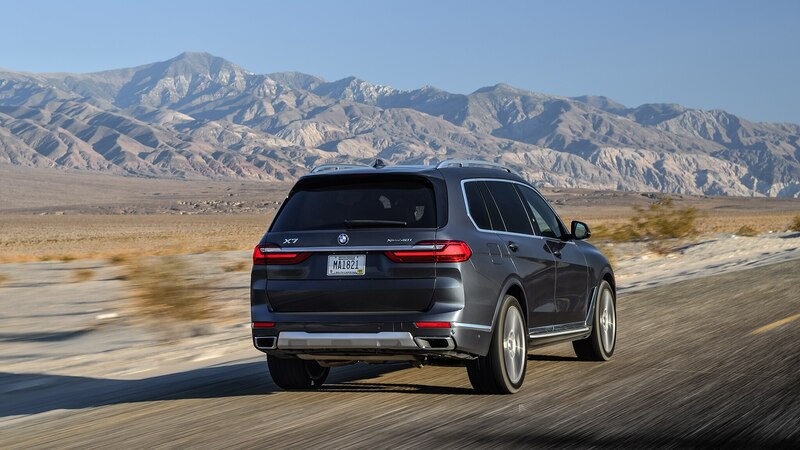 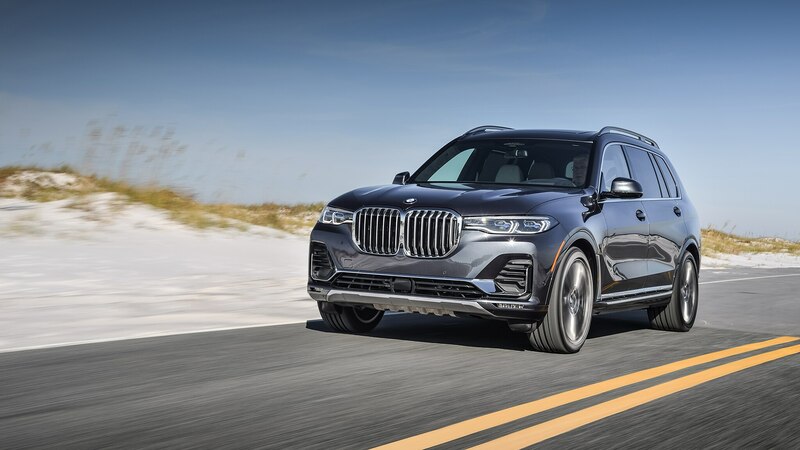 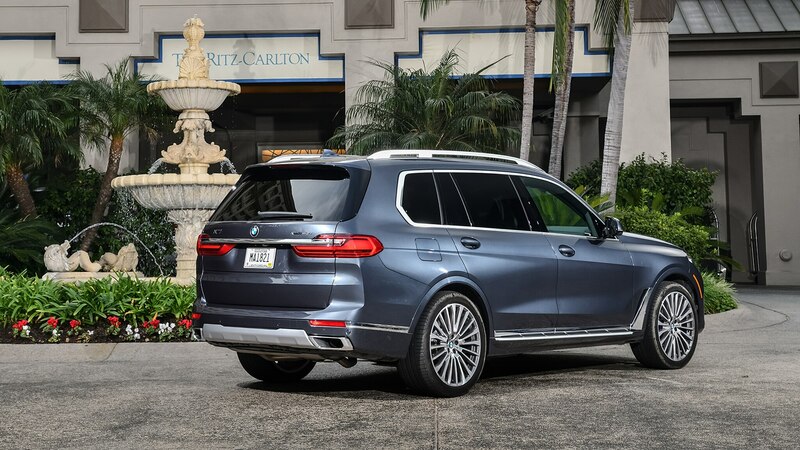 BMW may be a vehicle generation behind Mercedes and its GLS-class to the full-size luxury SUV table, but the X7 accomplishes what it set out to do, namely be hugely comfortable, hugely capable, and hugely luxurious. 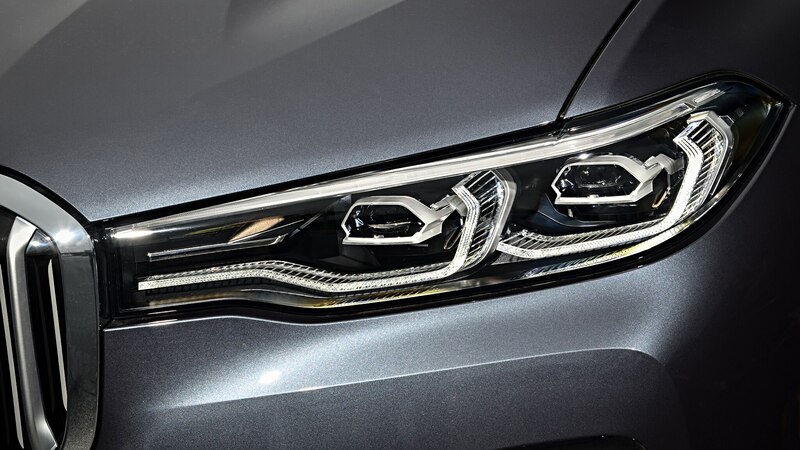 Prepare yourself to see a lot of them—they’ll certainly be hard to miss.